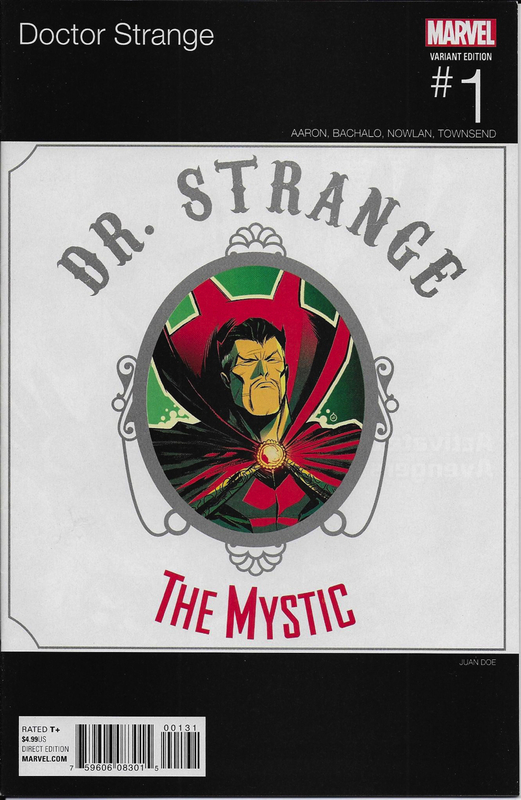 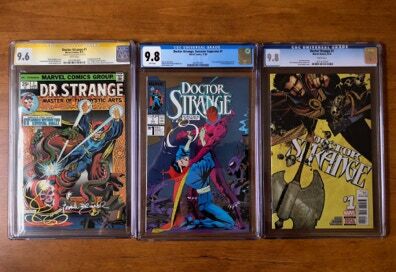 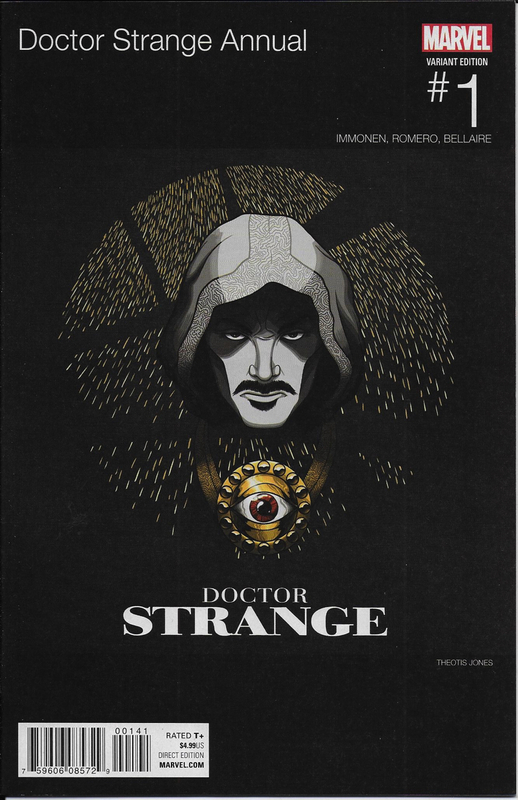 ﻿Doctor ﻿Strange ﻿has ﻿had ﻿several ﻿self ﻿titled ﻿series. 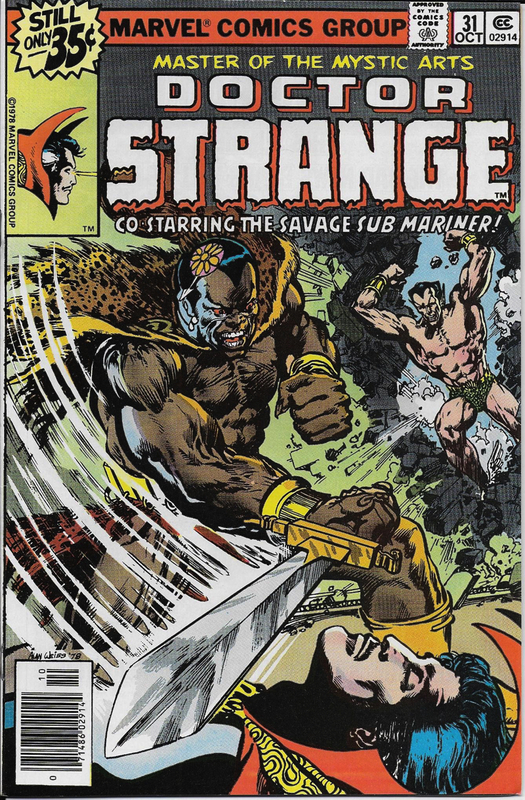 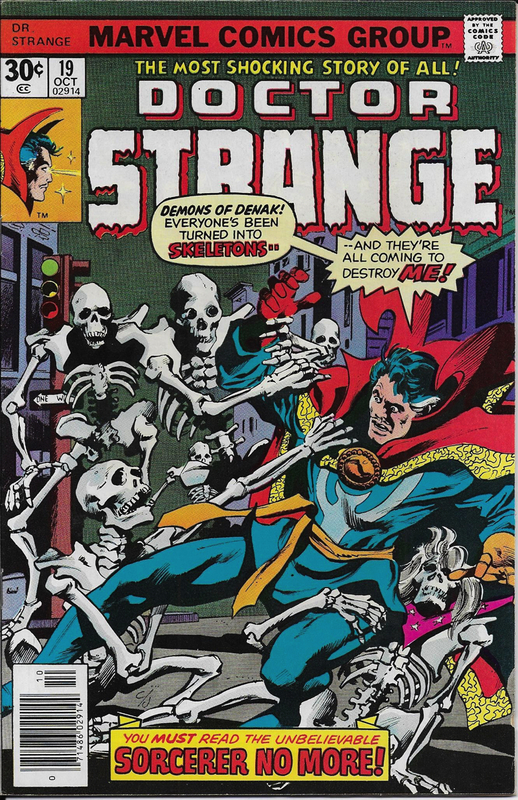 ﻿It ﻿all ﻿started ﻿when ﻿he ﻿took ﻿over ﻿Strange ﻿Tales ﻿in ﻿June ﻿of ﻿1968. 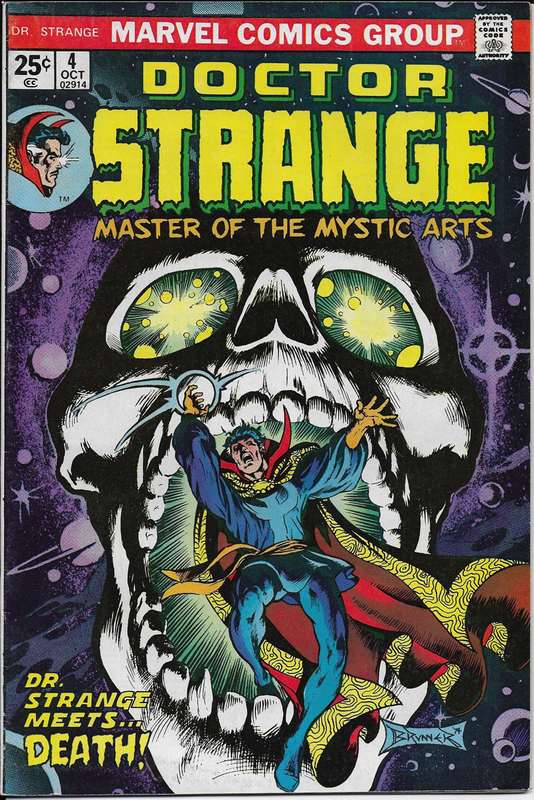 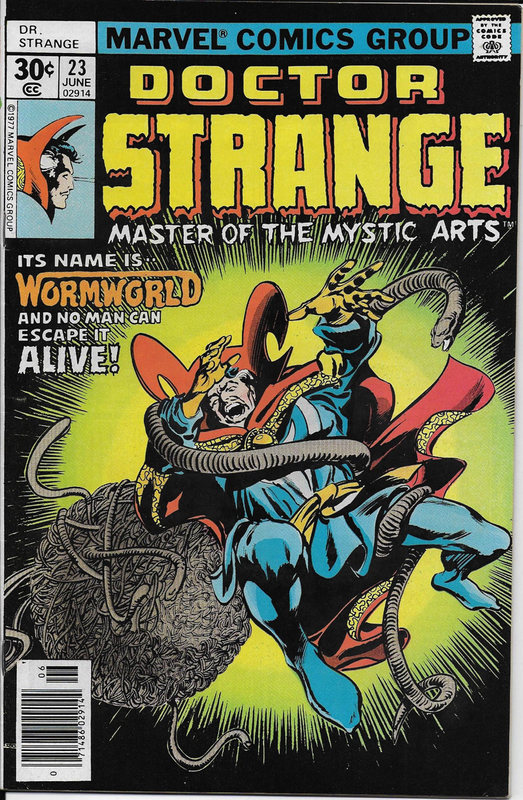 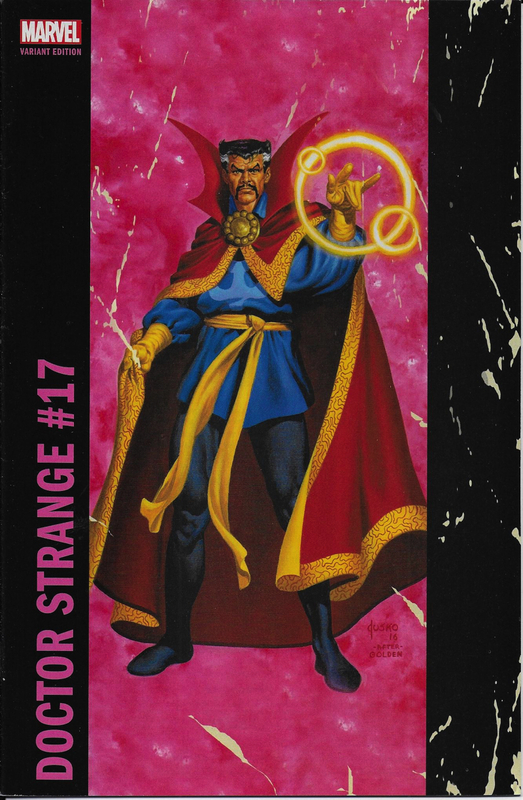 ﻿They ﻿retitled ﻿the ﻿book ﻿Doctor ﻿Strange ﻿but ﻿continued ﻿the ﻿Strange ﻿Tales ﻿numbering ﻿scheme ﻿by ﻿numbering ﻿the ﻿book ﻿#169. 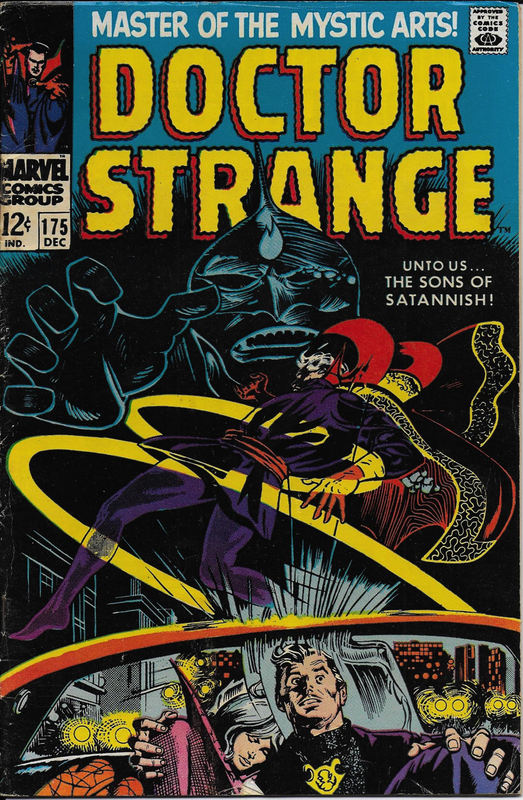 ﻿This ﻿continued ﻿until ﻿Doctor ﻿Strange ﻿#183 ﻿in ﻿November ﻿of ﻿1969. 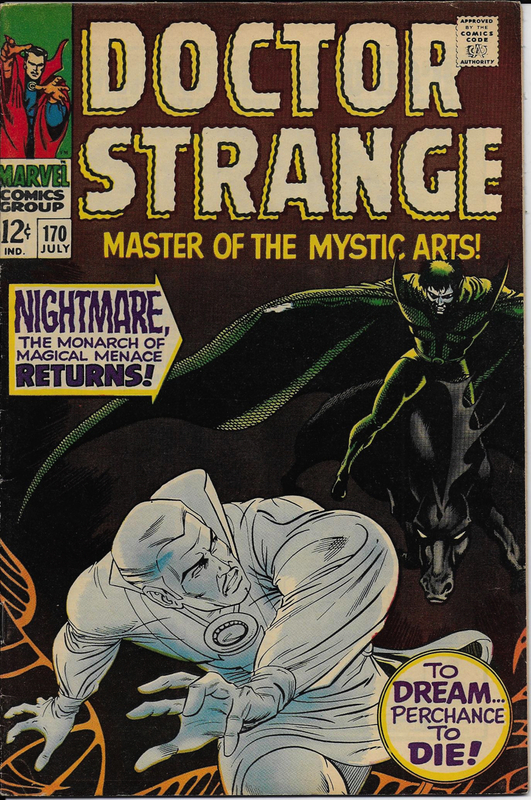 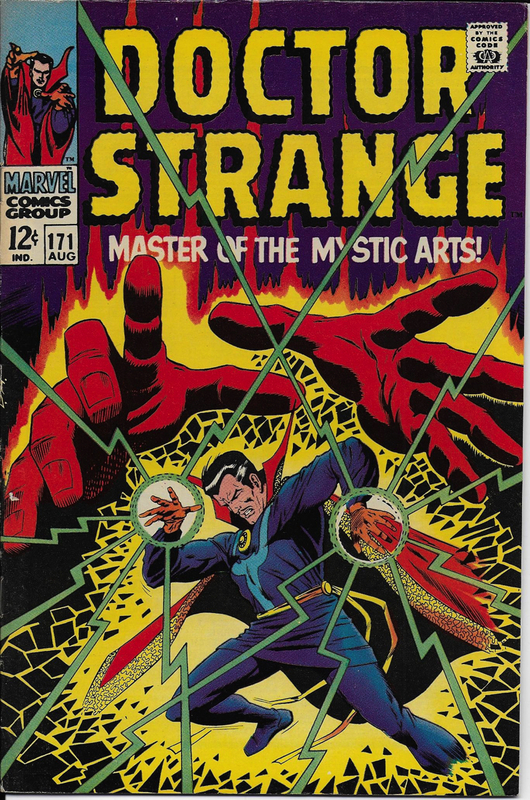 ﻿Doctor ﻿Strange ﻿would ﻿return ﻿with ﻿his ﻿own ﻿title ﻿again ﻿in ﻿June ﻿of ﻿1974. 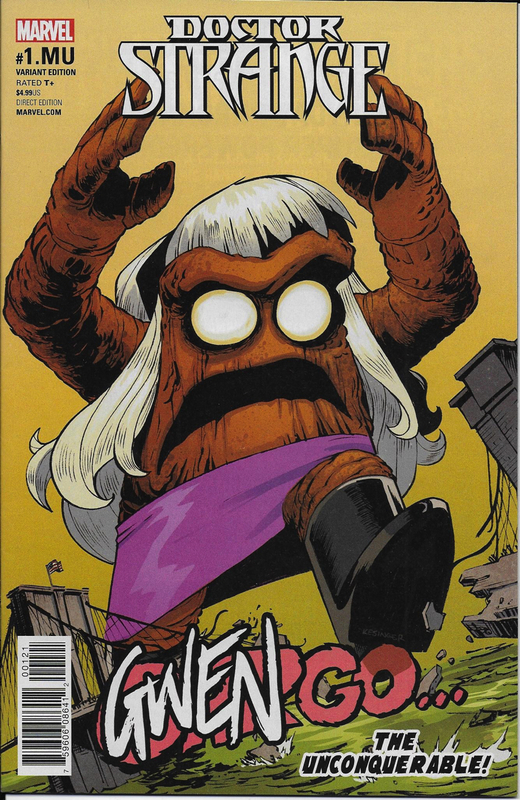 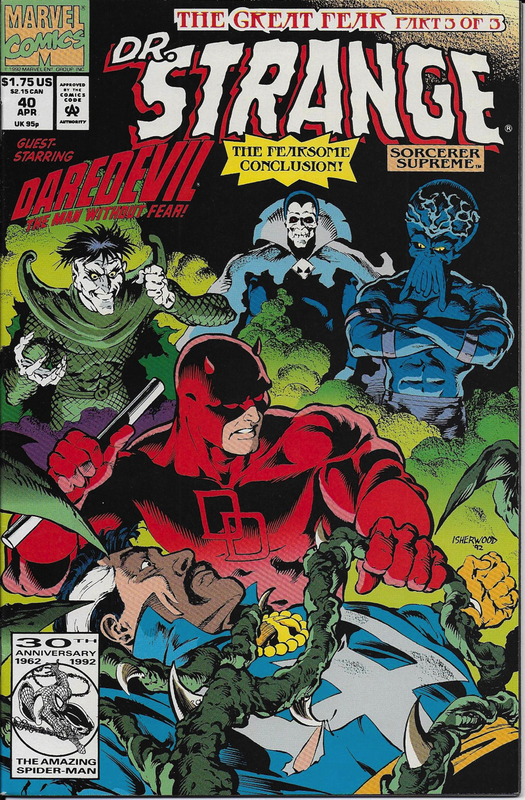 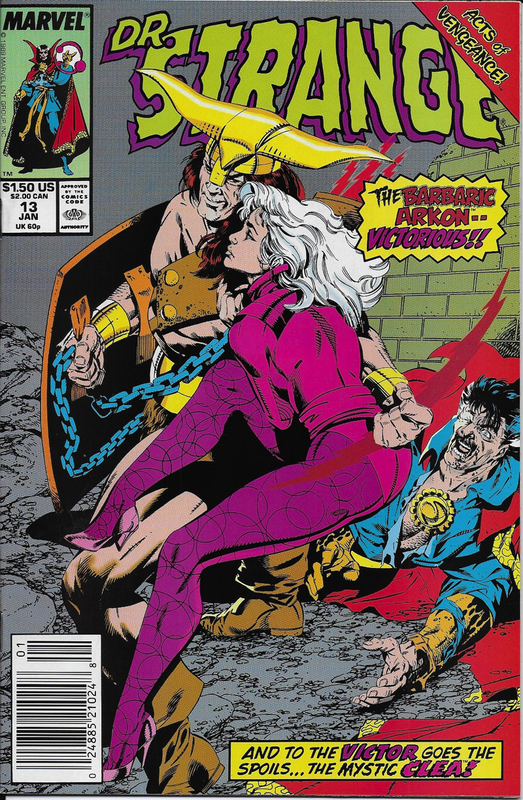 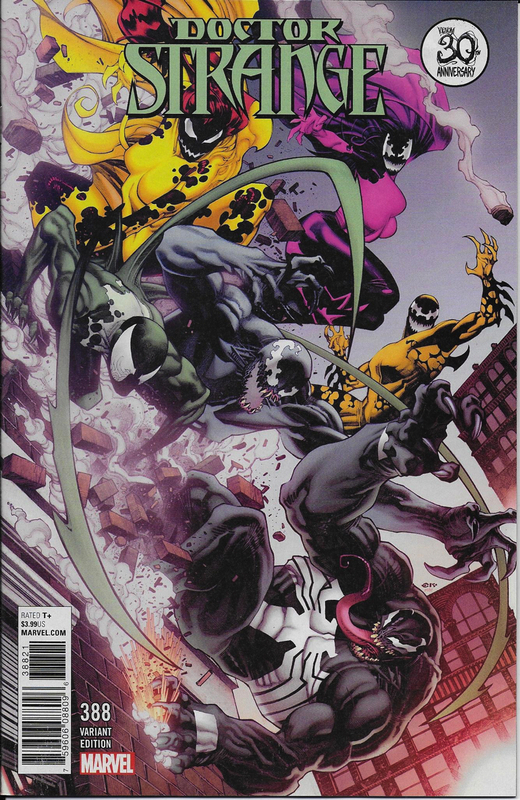 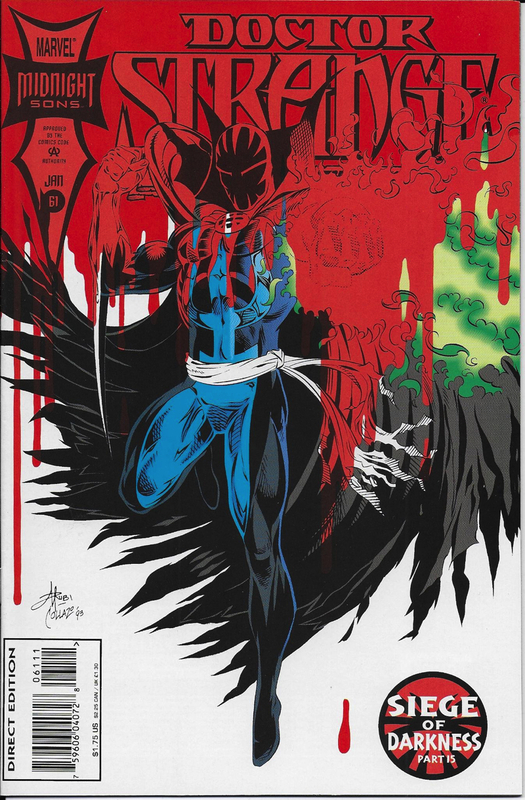 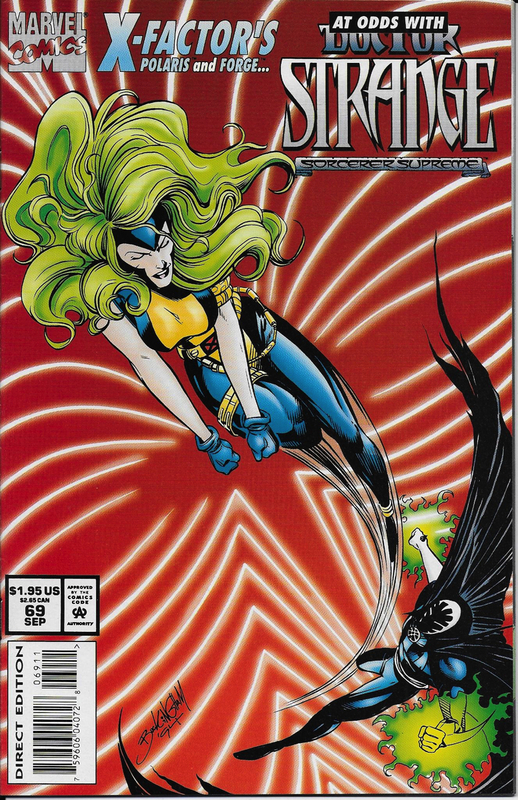 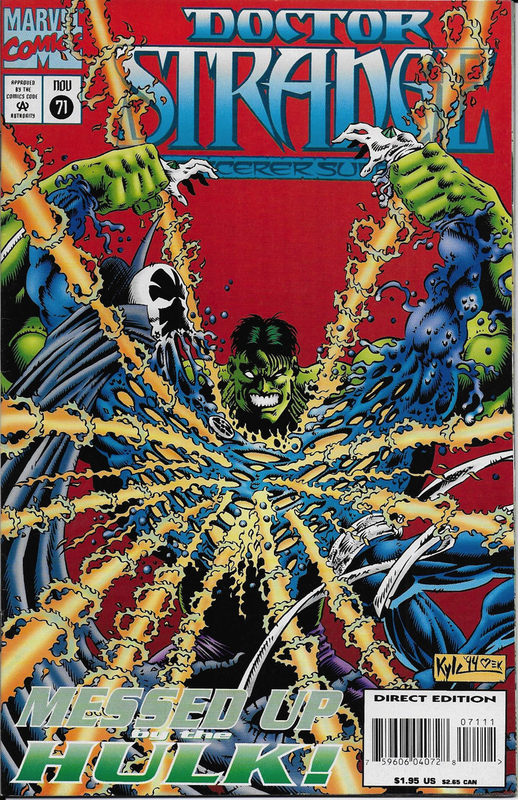 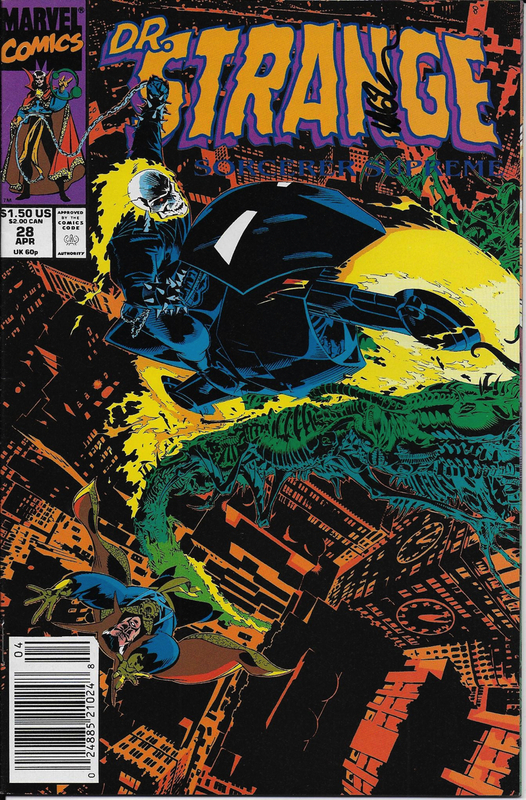 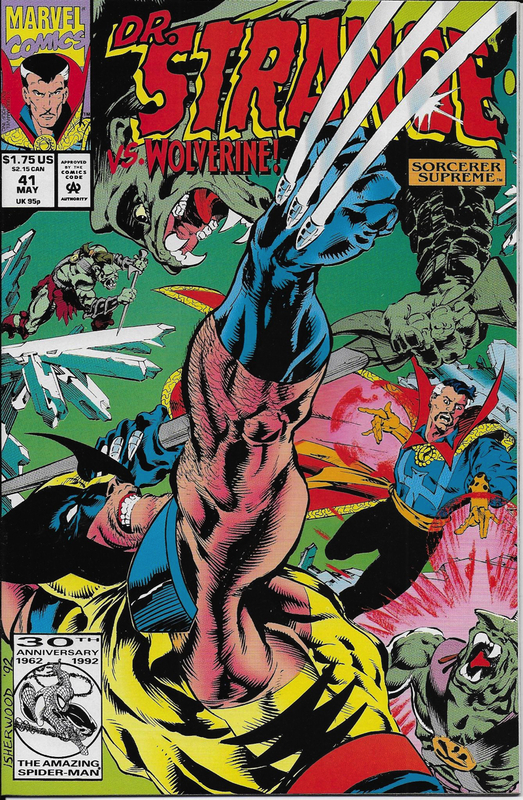 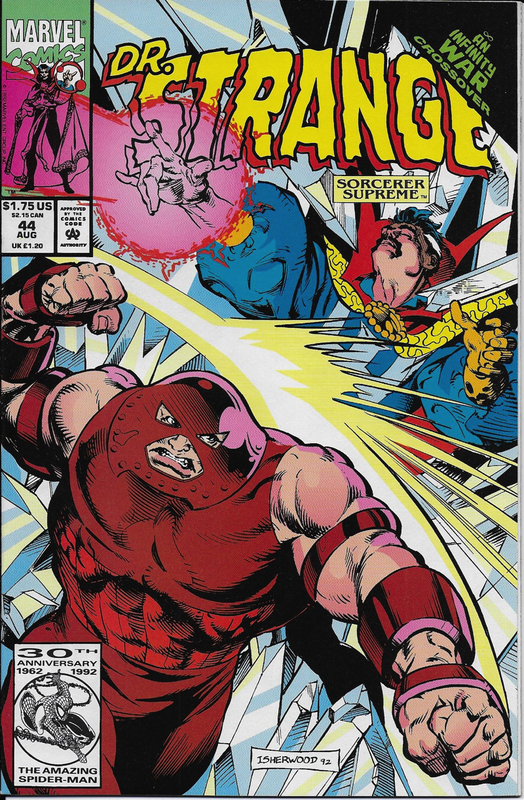 ﻿This ﻿series ﻿lasted ﻿until ﻿issue ﻿#81 ﻿in ﻿February ﻿of ﻿1987. 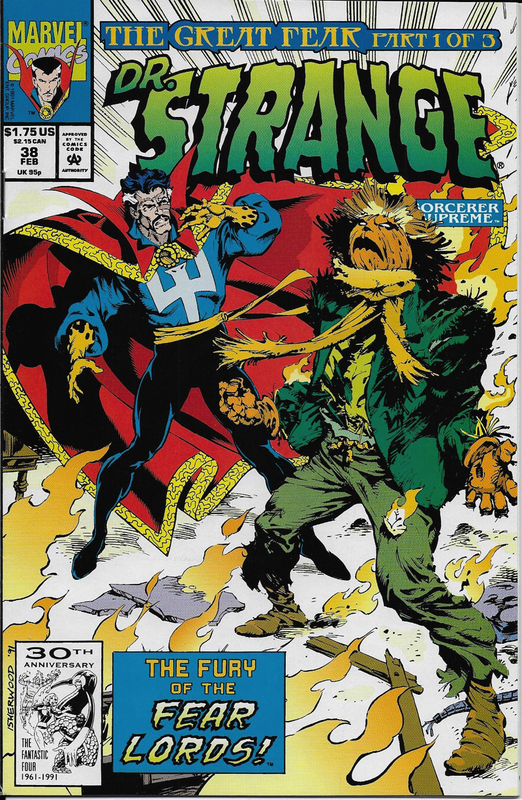 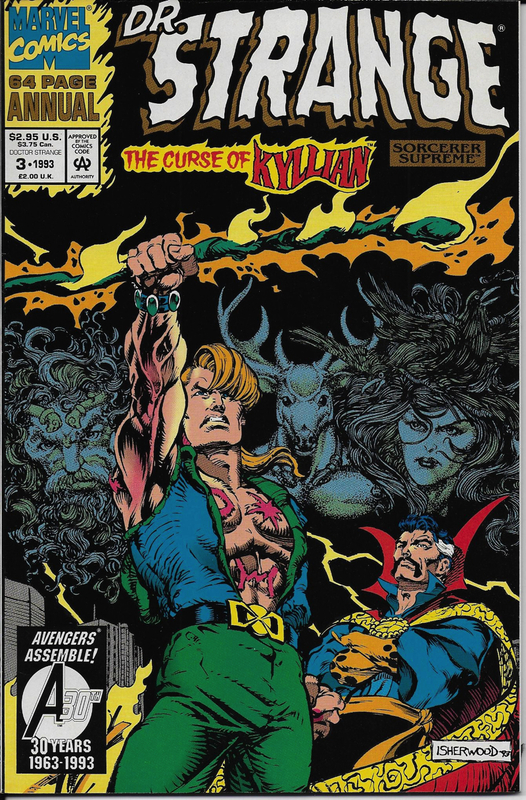 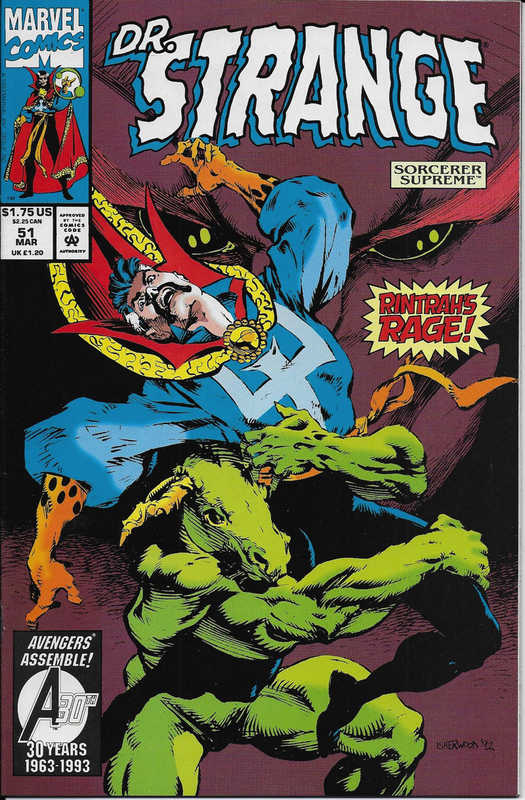 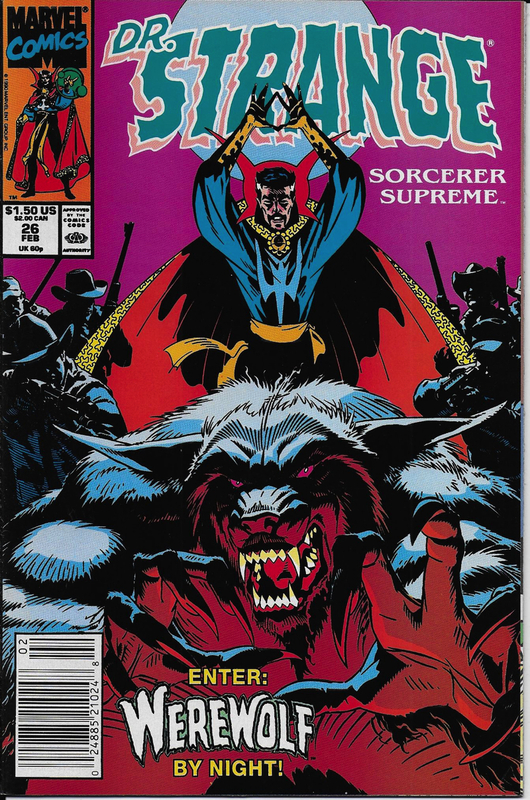 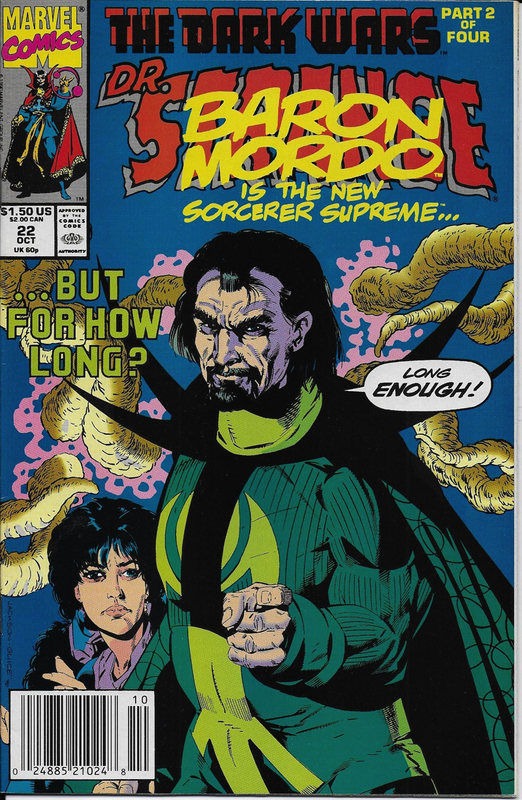 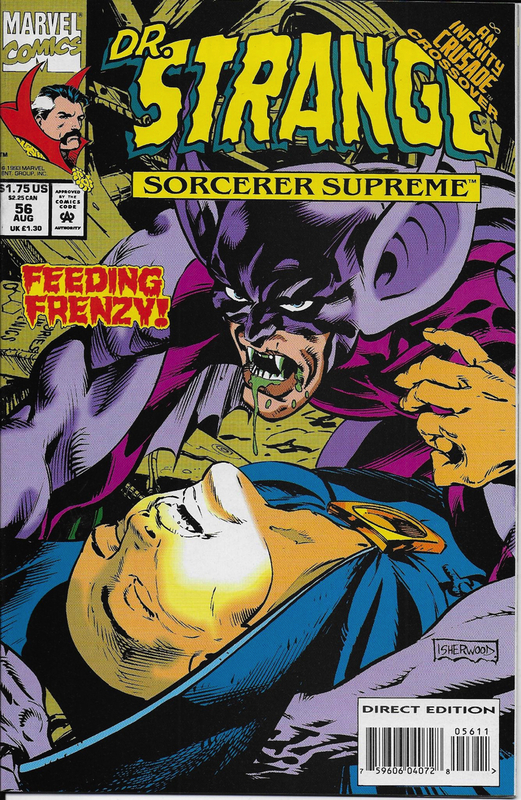 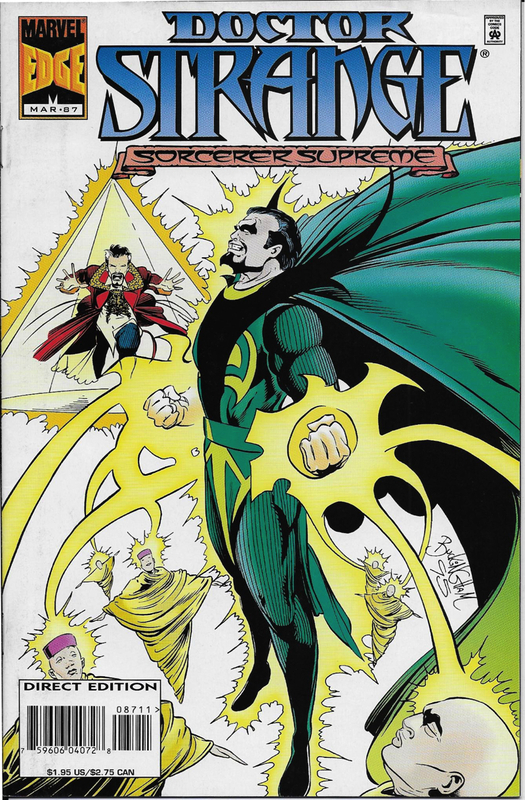 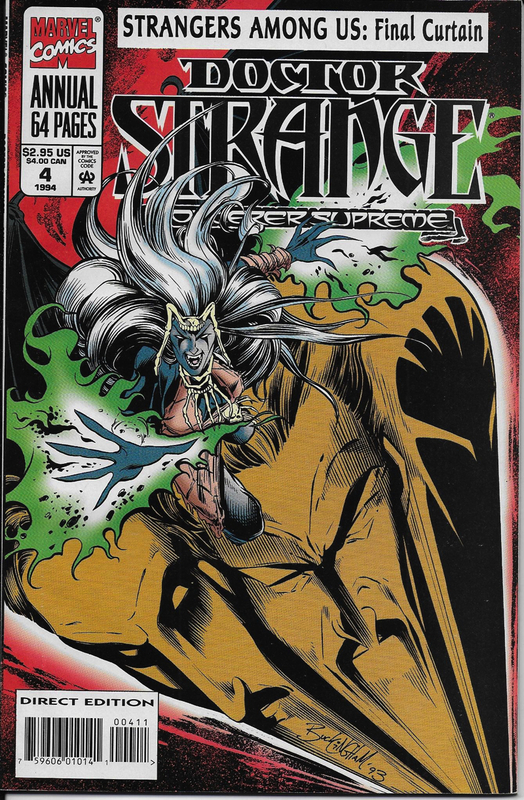 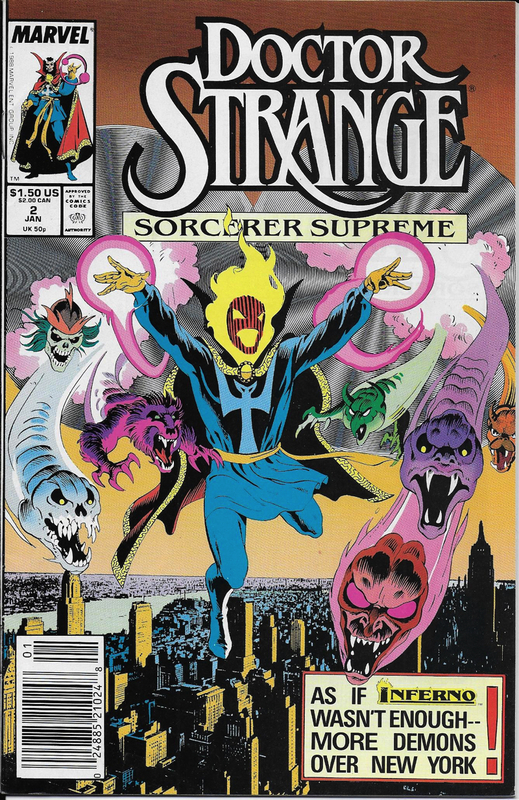 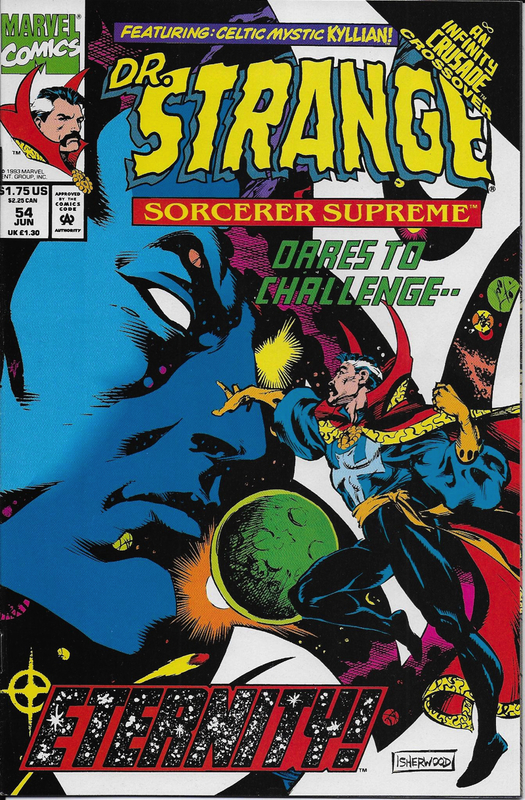 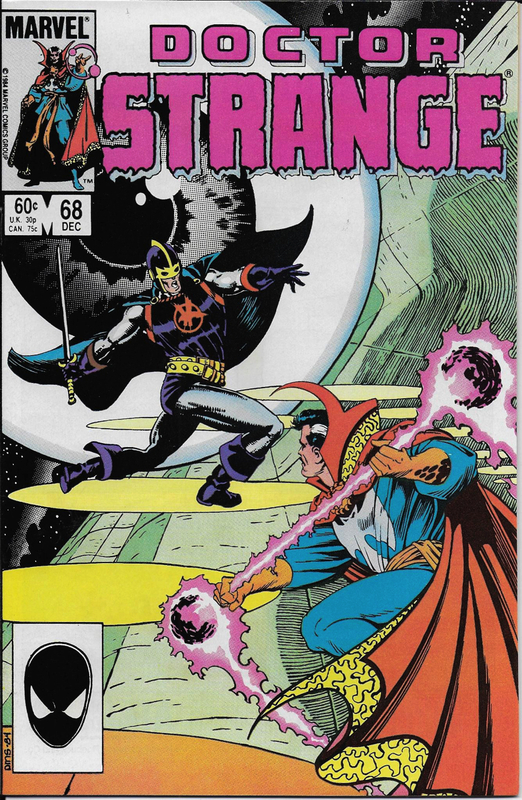 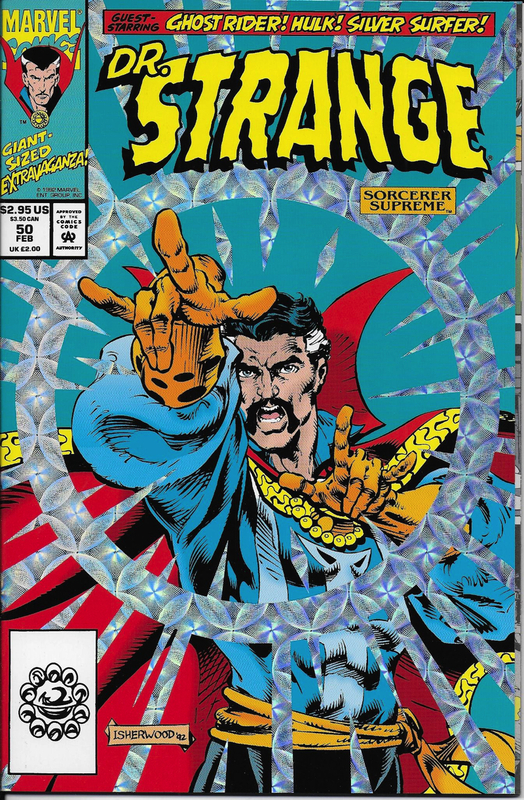 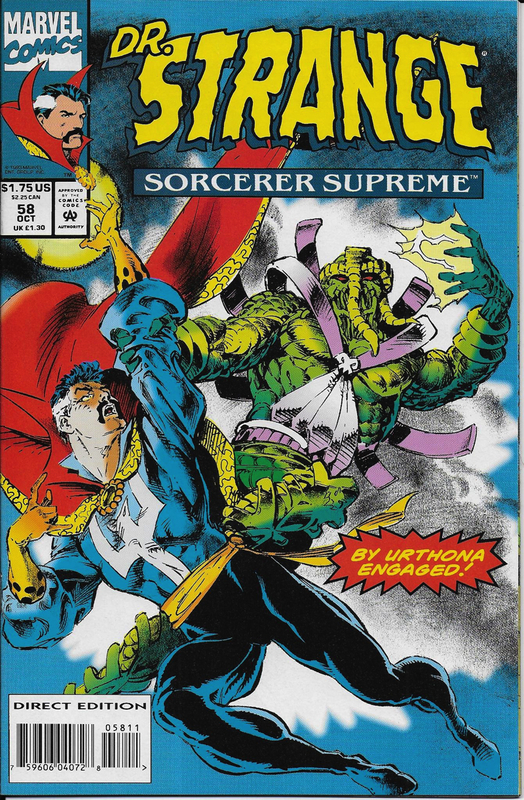 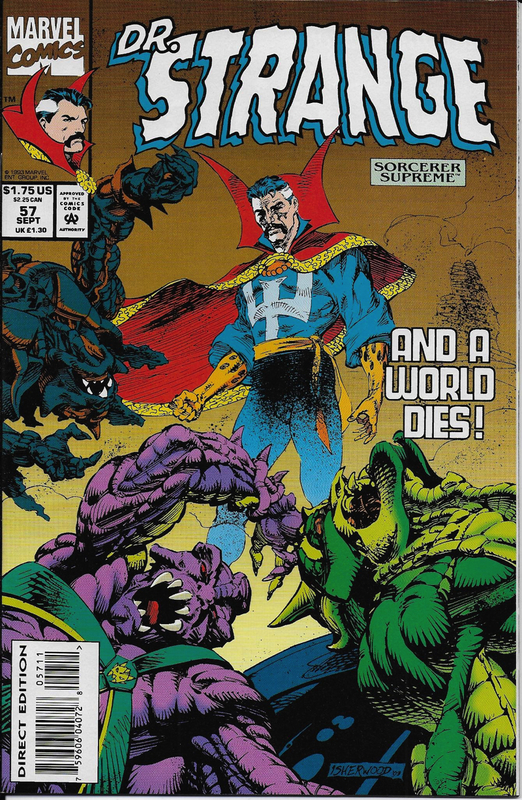 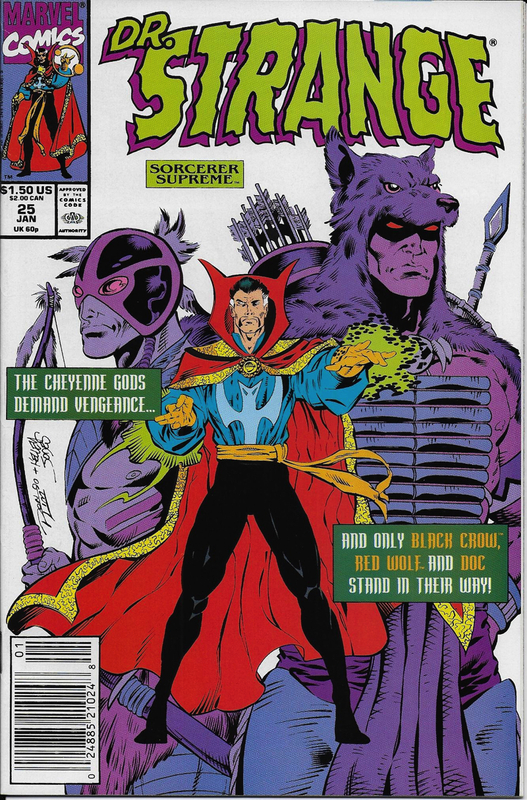 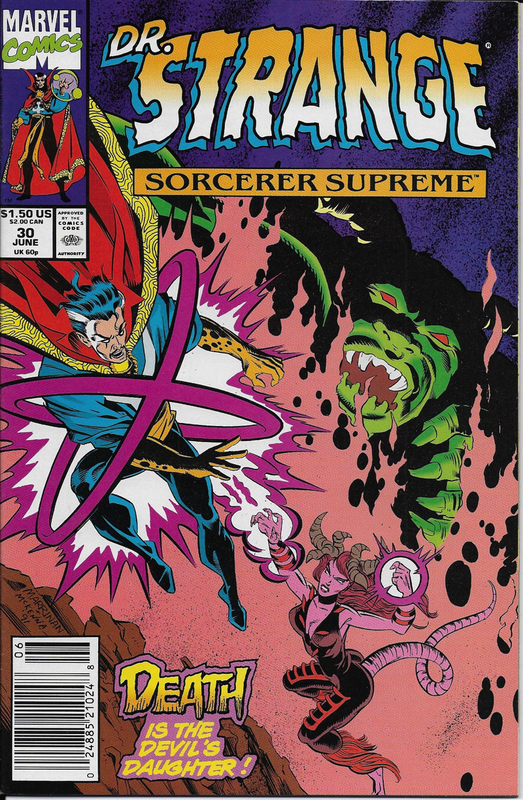 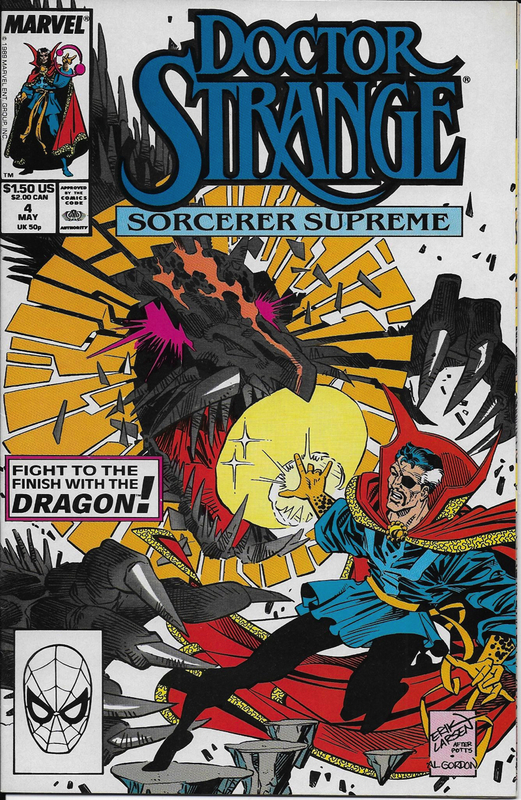 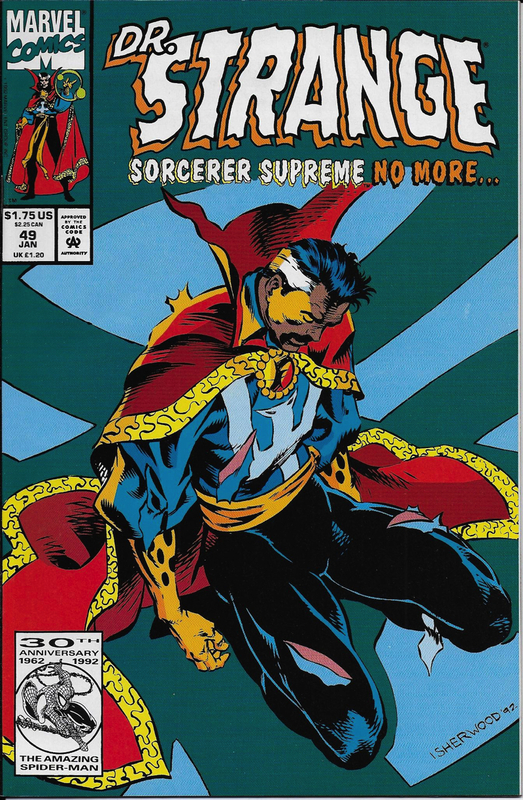 ﻿In ﻿November ﻿of ﻿1988, ﻿Doctor ﻿Strange ﻿would ﻿return ﻿in ﻿Doctor ﻿Strange ﻿Sorcerer ﻿supreme, ﻿which ﻿lasted ﻿until ﻿issue ﻿#90 ﻿in ﻿June ﻿of ﻿1996. 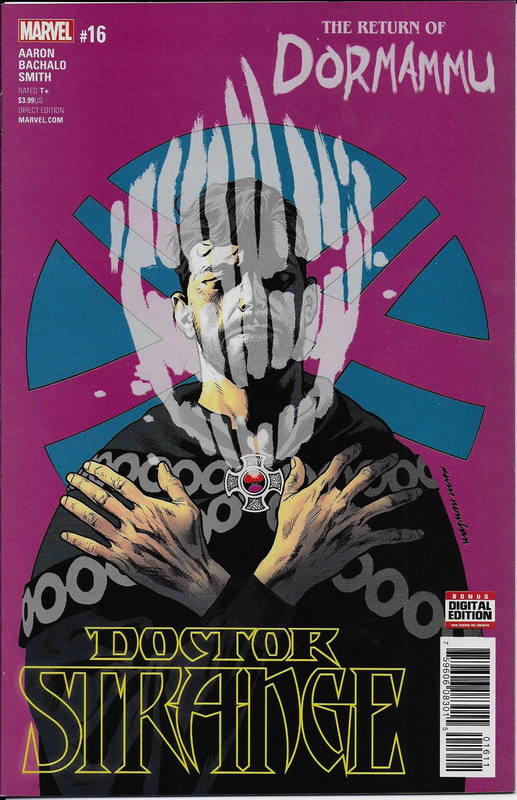 ﻿The ﻿good ﻿Doctor ﻿would ﻿return ﻿in ﻿October ﻿of ﻿2015 ﻿in ﻿a ﻿series ﻿that ﻿would ﻿last ﻿until ﻿2018. 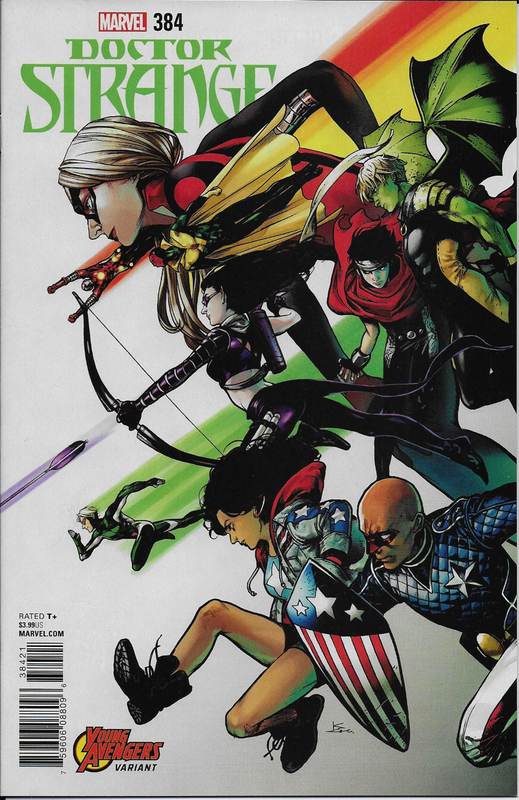 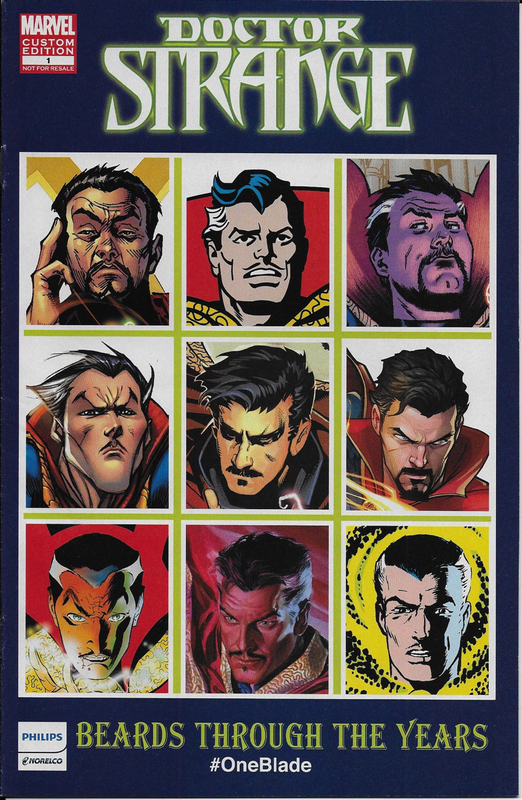 ﻿In ﻿2017, ﻿Marvel ﻿changed ﻿they ﻿way ﻿they ﻿numbered ﻿many ﻿of ﻿their ﻿comics. 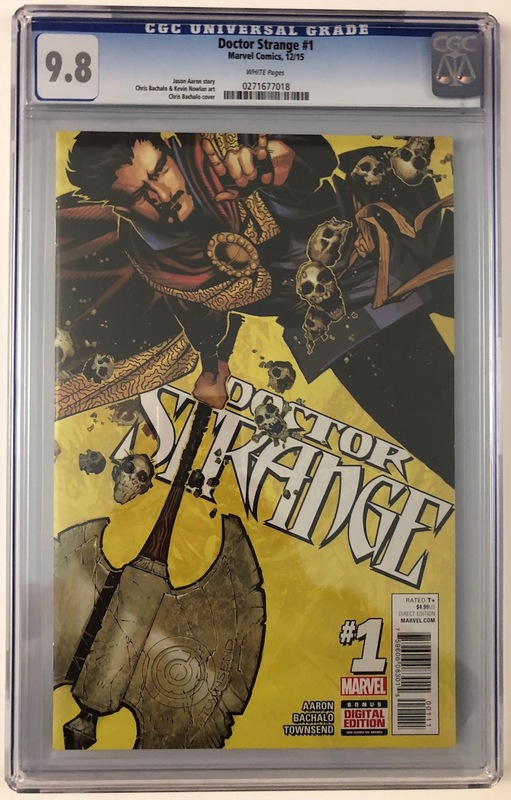 ﻿In ﻿mid ﻿series, ﻿they ﻿changed ﻿the ﻿number ﻿on ﻿the ﻿comics ﻿to ﻿a ﻿Legacy ﻿Number. 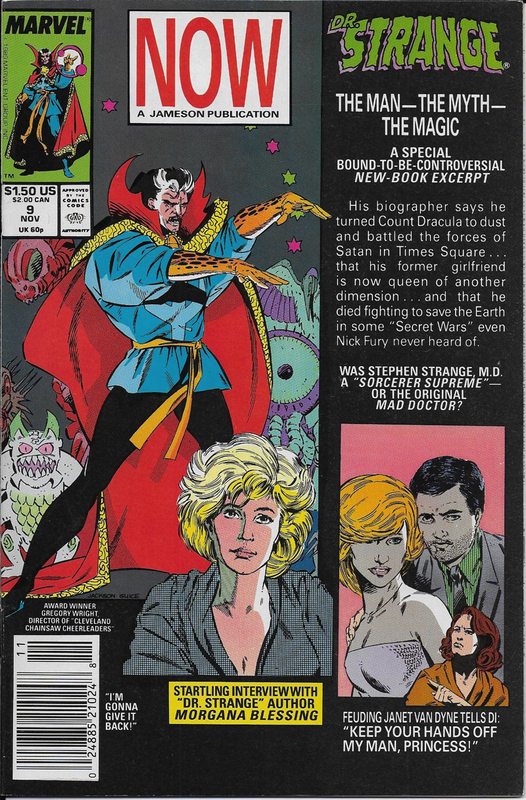 ﻿This ﻿number ﻿was ﻿determined ﻿by ﻿how ﻿many ﻿comics ﻿that ﻿character ﻿had ﻿in ﻿their ﻿own ﻿titles ﻿up ﻿to ﻿this ﻿date. 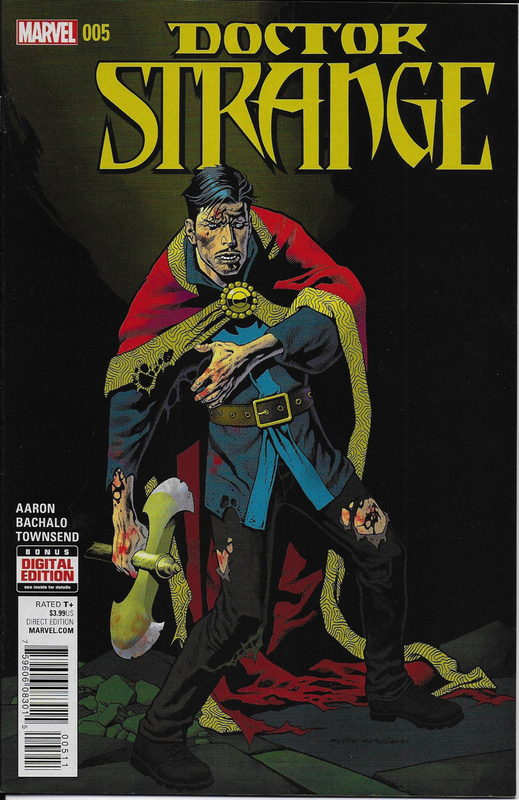 ﻿Doctor ﻿Strange ﻿went ﻿from ﻿issue ﻿#26 ﻿in ﻿December ﻿(released ﻿October) ﻿of ﻿2017 ﻿to ﻿#381 ﻿in ﻿January ﻿(released ﻿November) ﻿of ﻿2018. 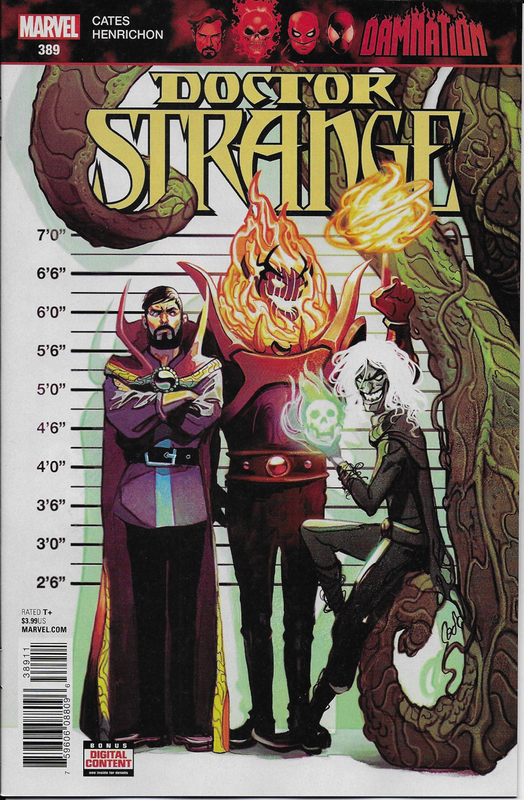 ﻿This ﻿confused ﻿a ﻿lot ﻿of ﻿people, ﻿especially ﻿when ﻿they ﻿abandoned ﻿that ﻿numbering ﻿system ﻿in ﻿2018 ﻿by ﻿returning ﻿to ﻿a ﻿Doctor ﻿Strange ﻿#1 ﻿in ﻿August ﻿(released ﻿June) ﻿of ﻿2018. 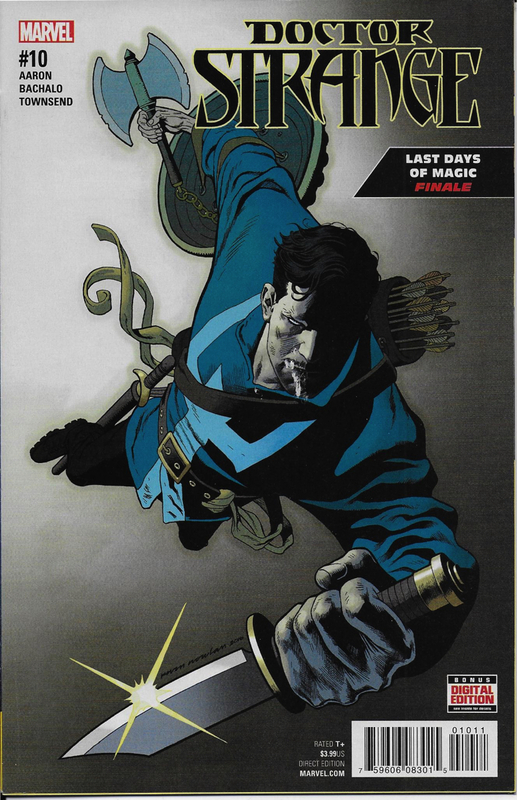 ﻿The ﻿only ﻿reason ﻿they ﻿did ﻿this ﻿was ﻿because ﻿a ﻿new ﻿writing ﻿team ﻿was ﻿taking ﻿over ﻿not ﻿because ﻿the ﻿original ﻿series ﻿came ﻿to ﻿an ﻿end. 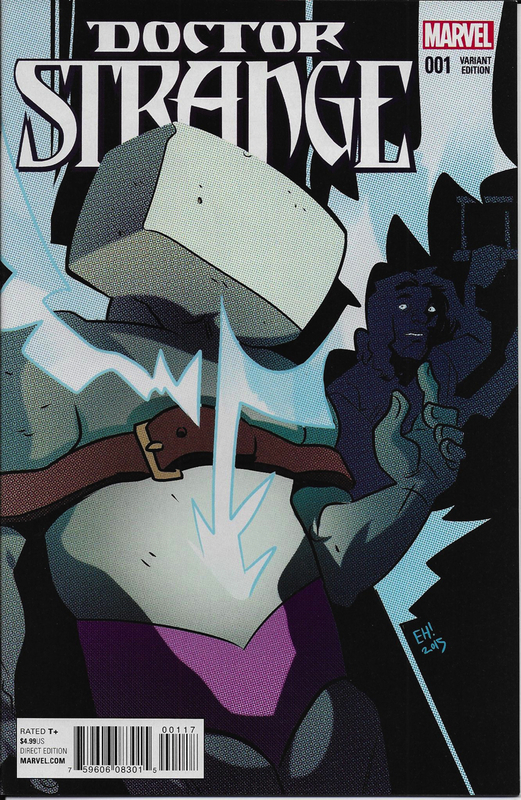 ﻿This ﻿again ﻿confused ﻿a ﻿lot ﻿of ﻿people. 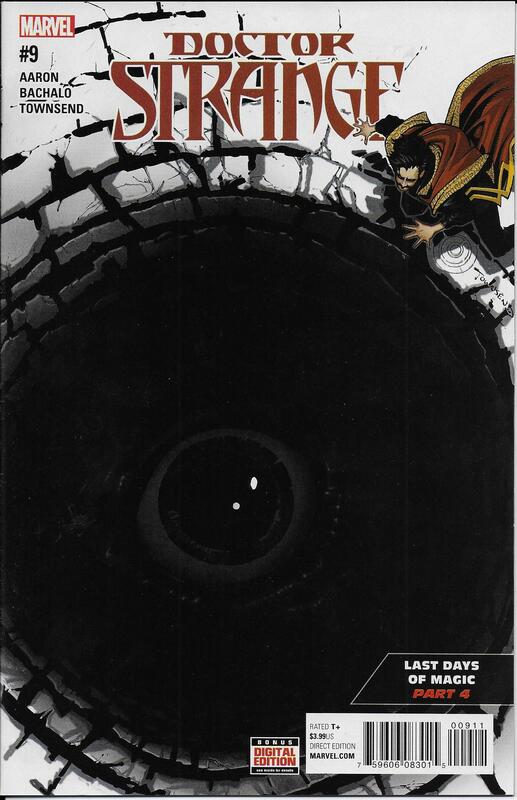 ﻿This ﻿is ﻿the ﻿current ﻿series. 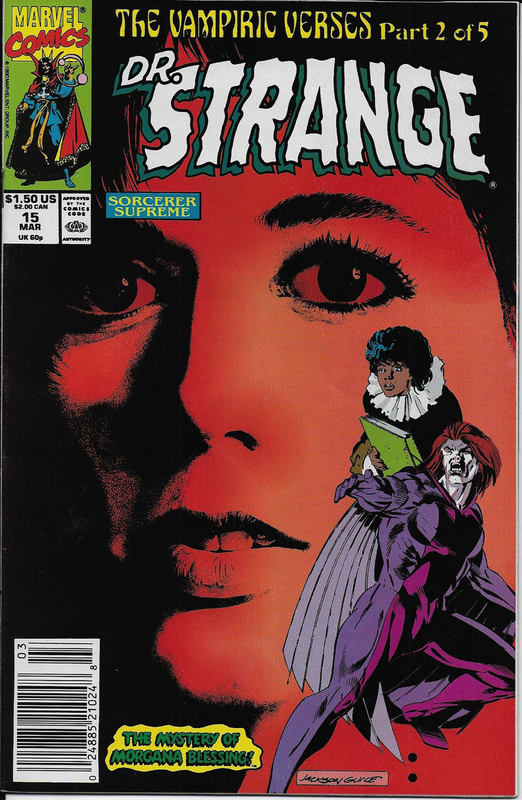 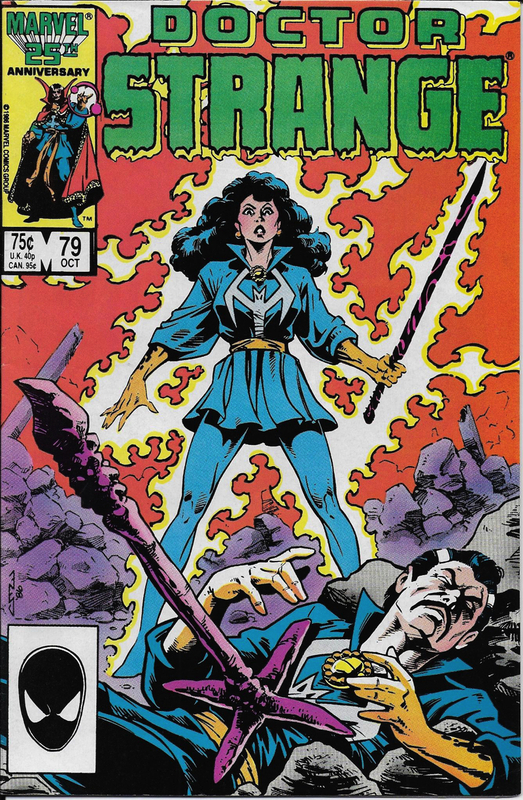 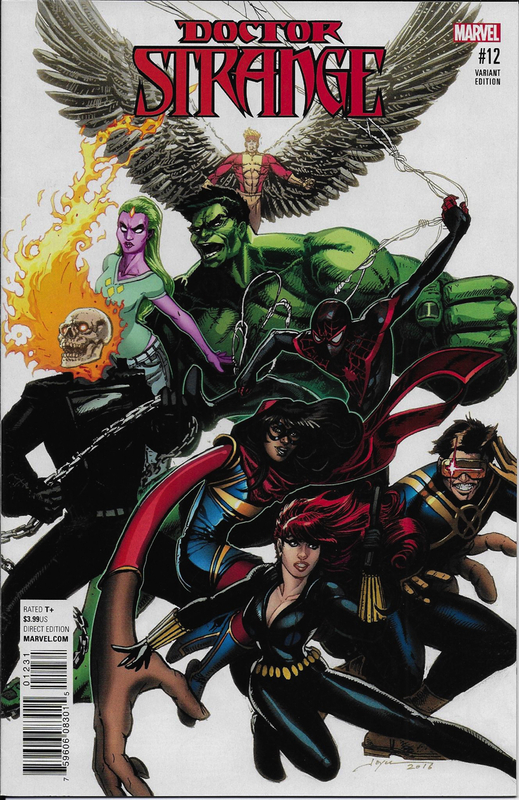 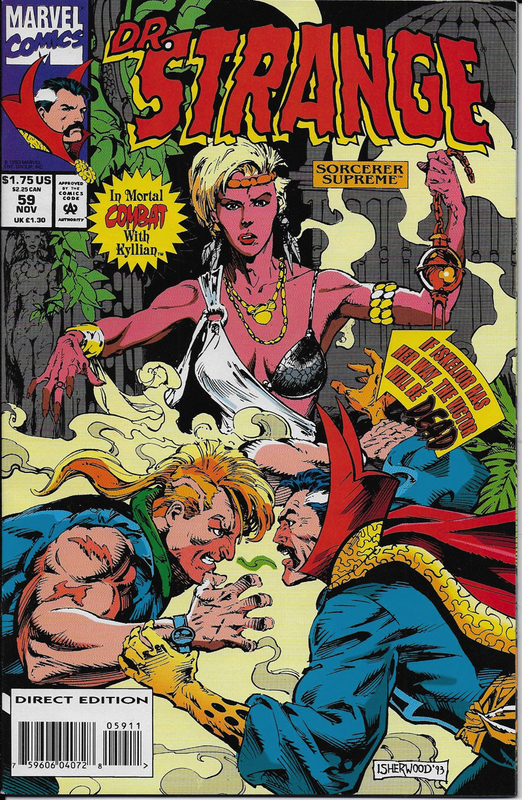 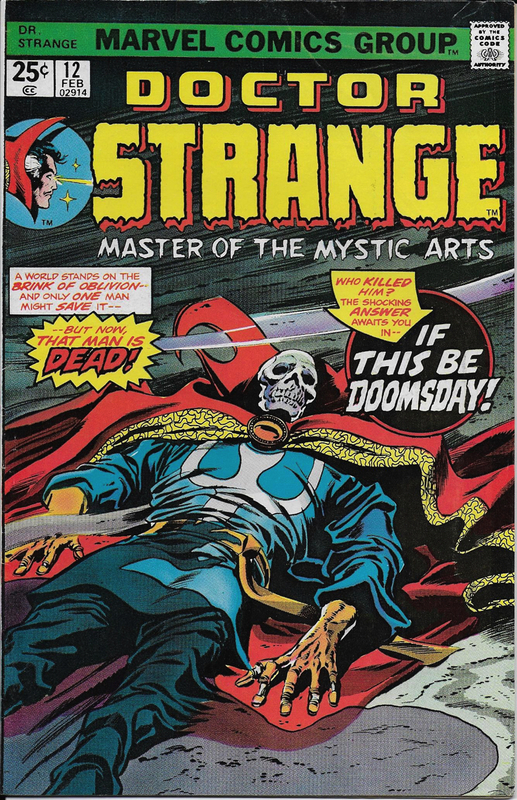 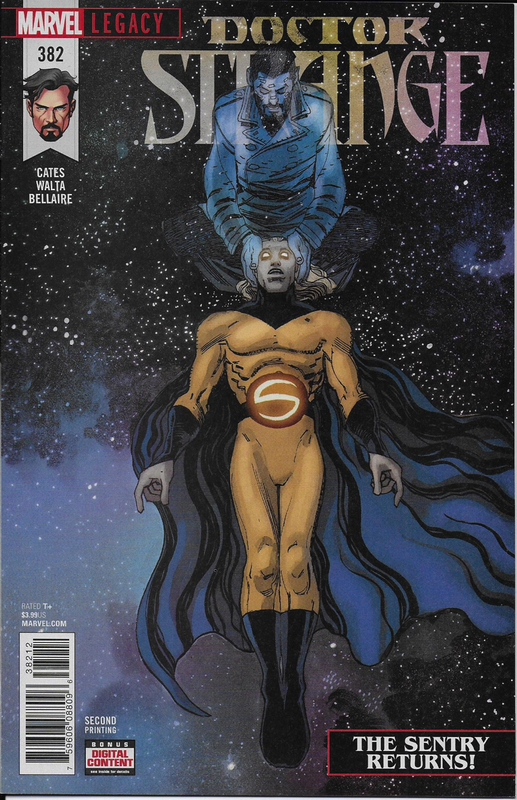 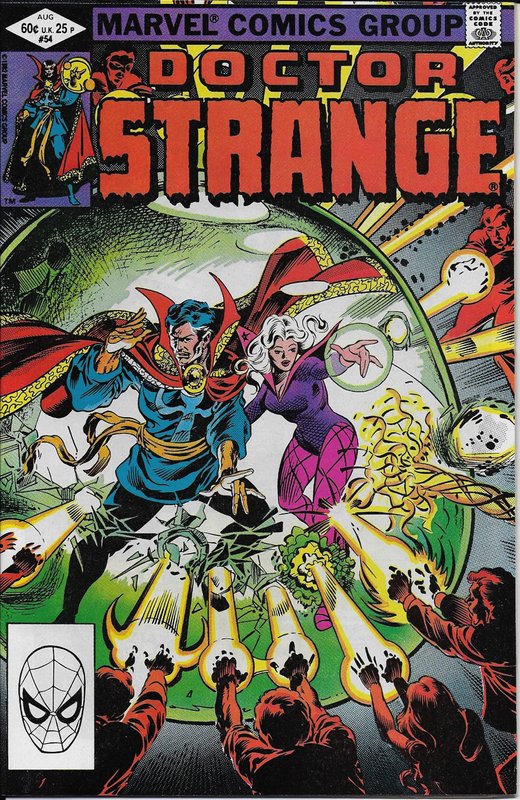 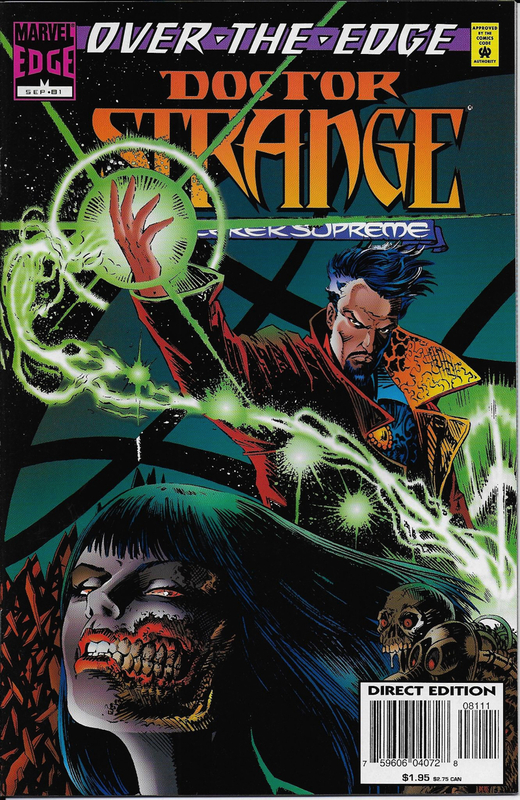 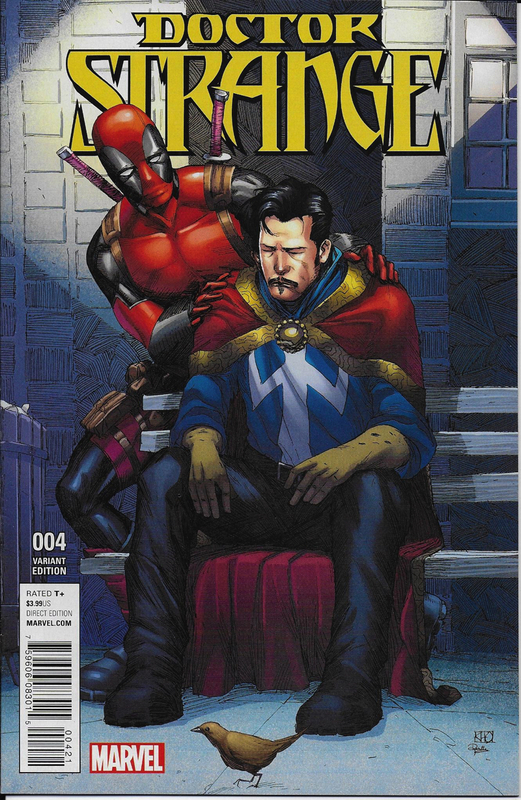 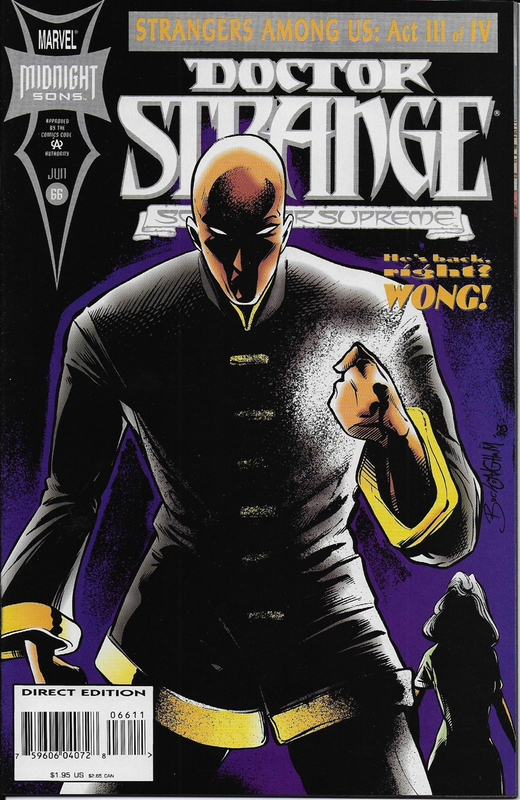 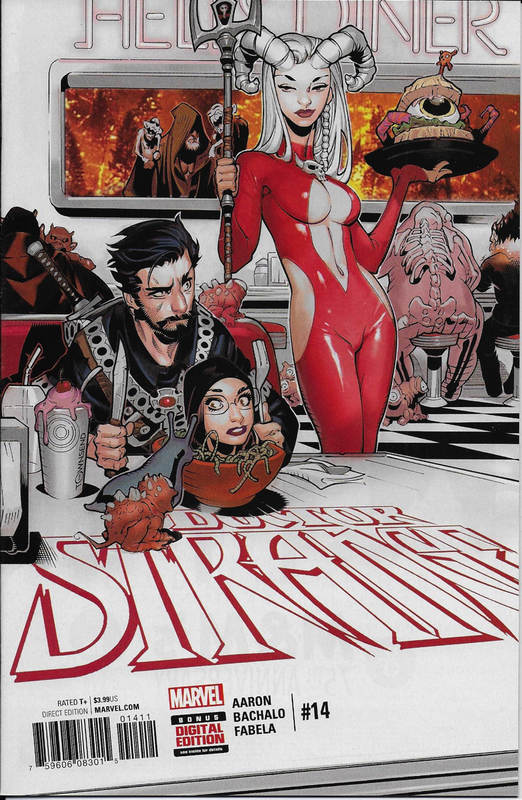 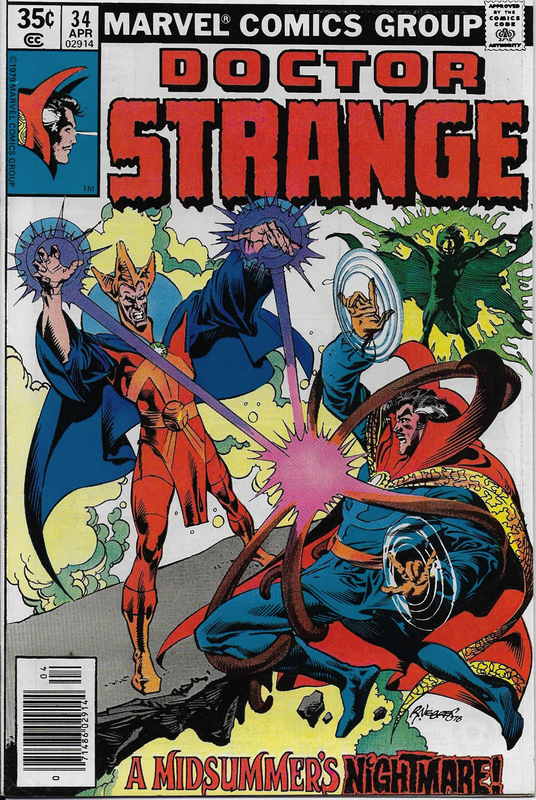 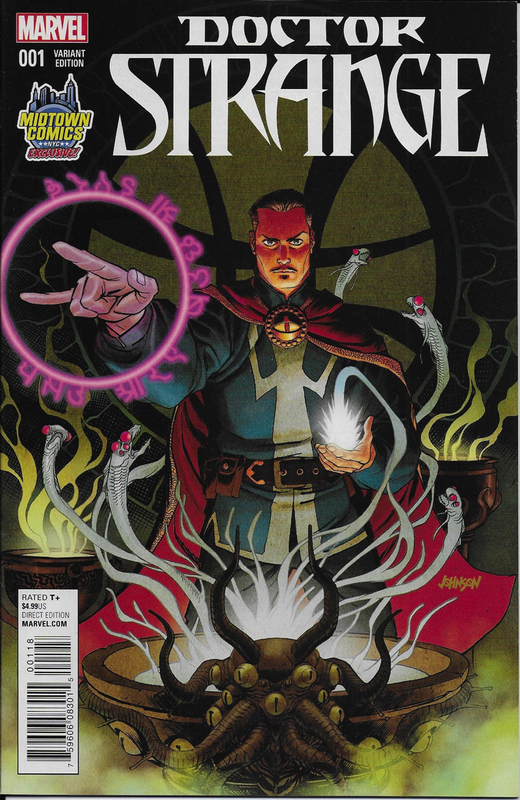 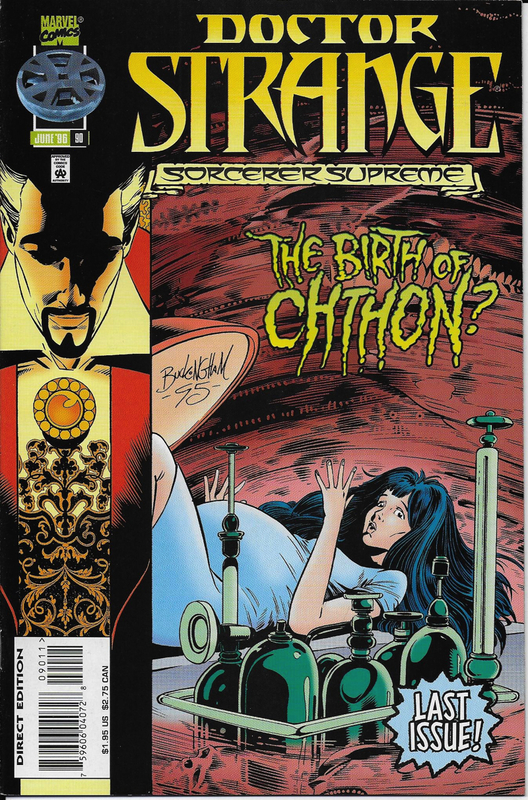 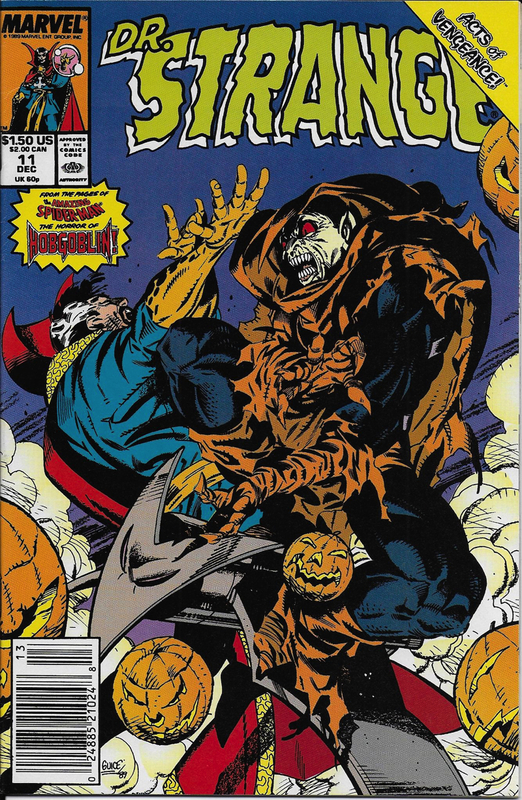 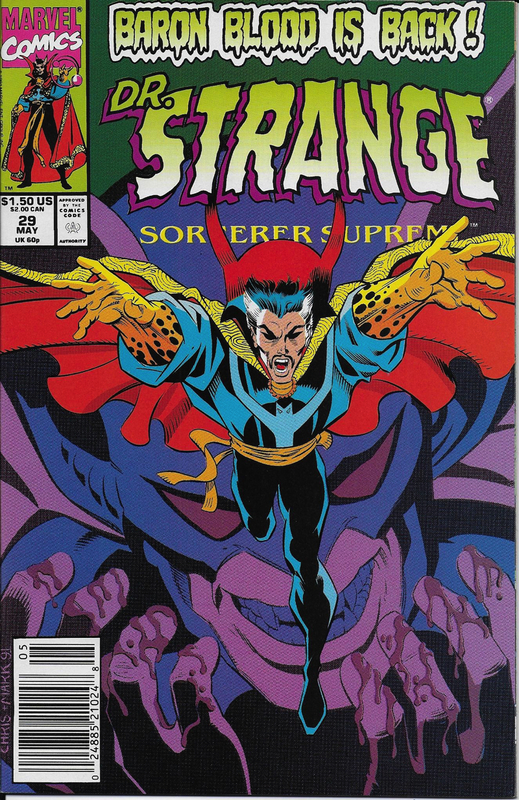 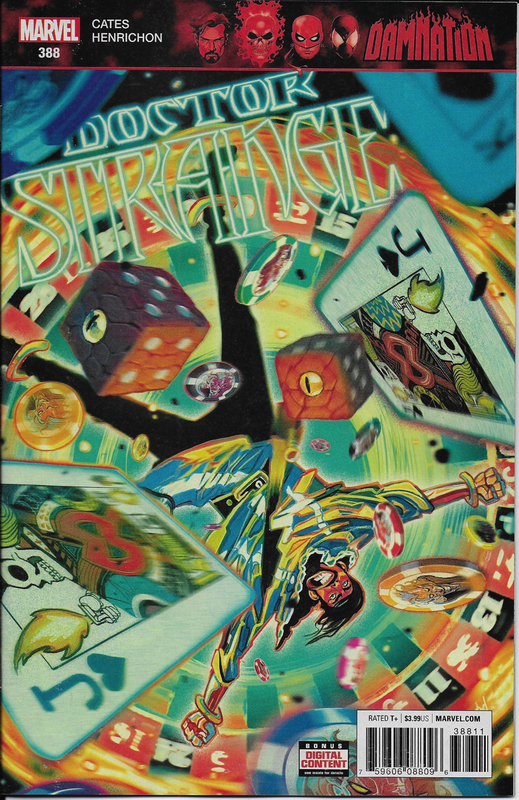 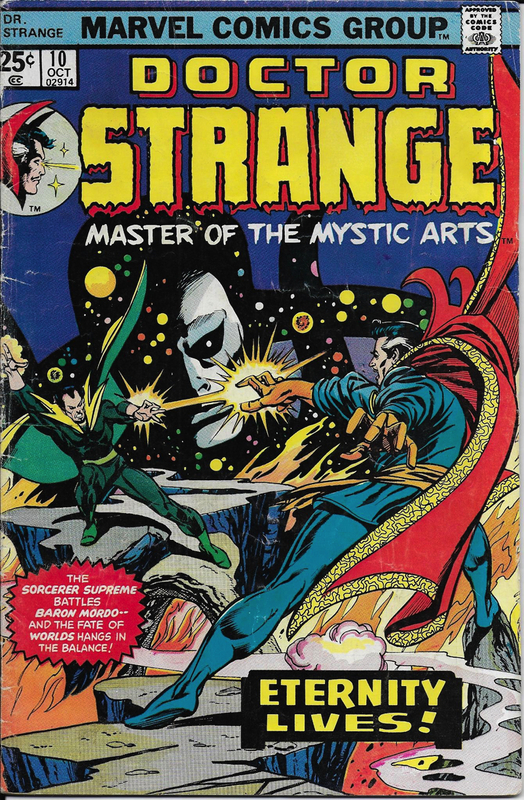 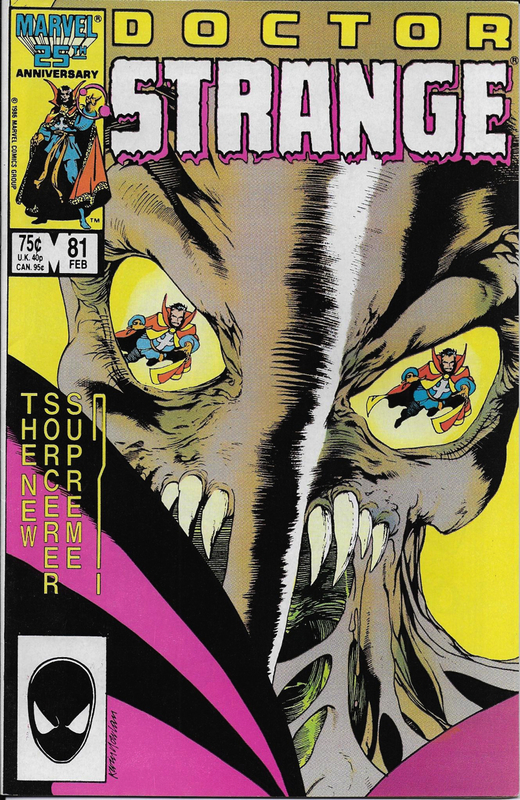 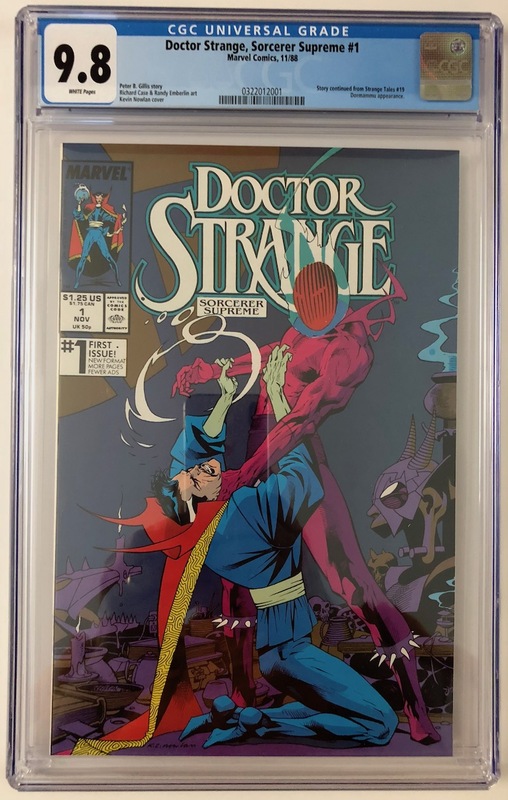 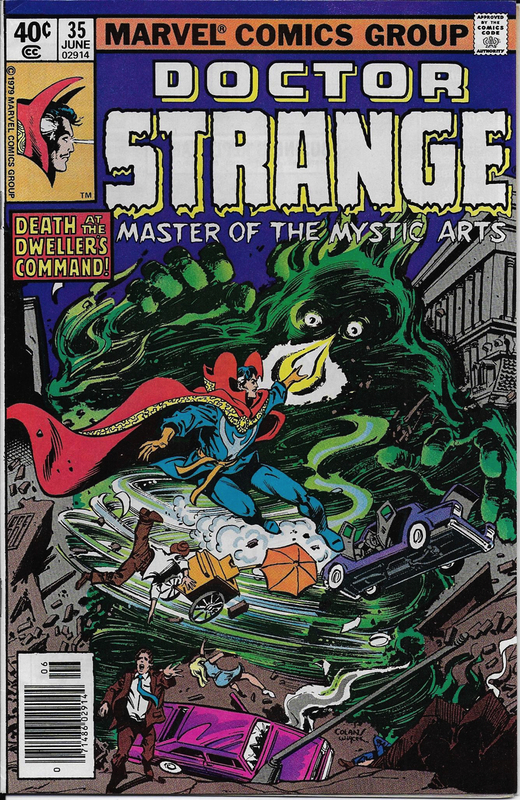 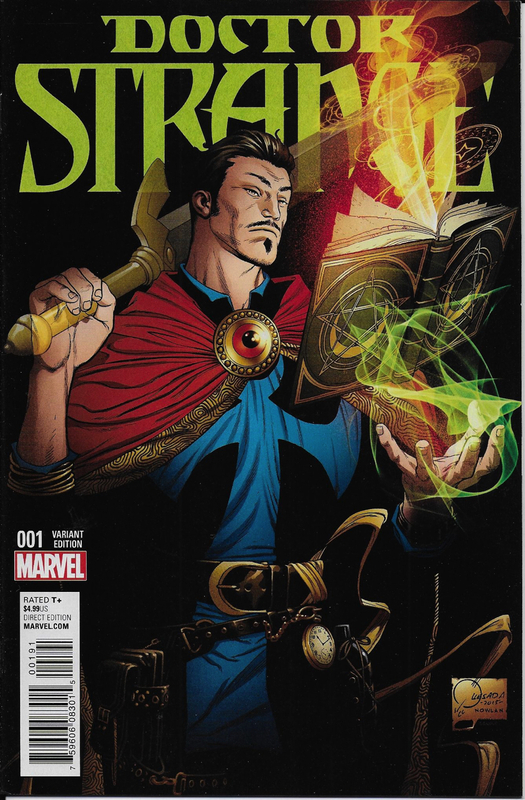 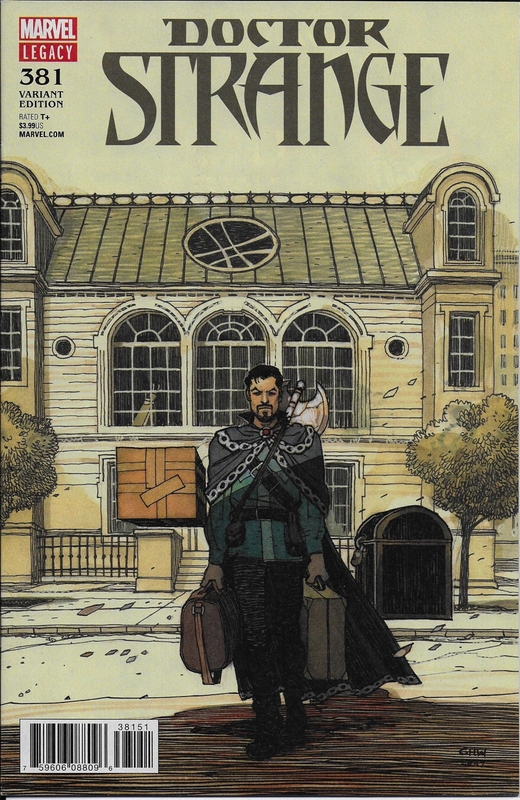 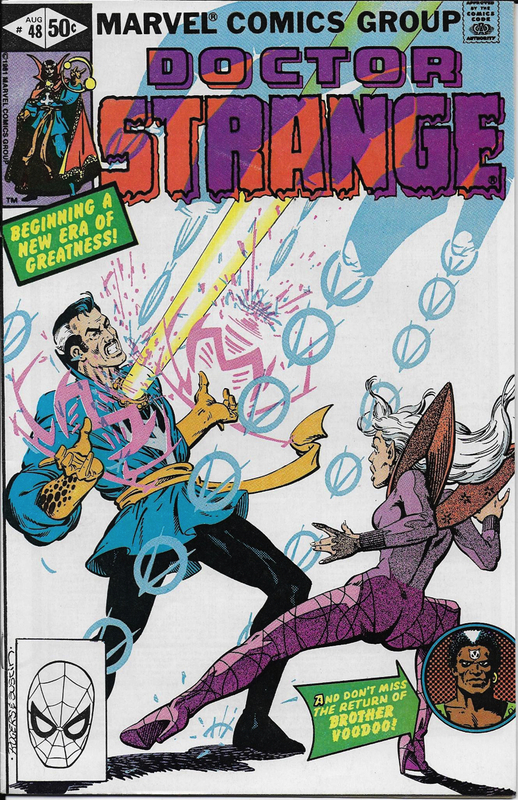 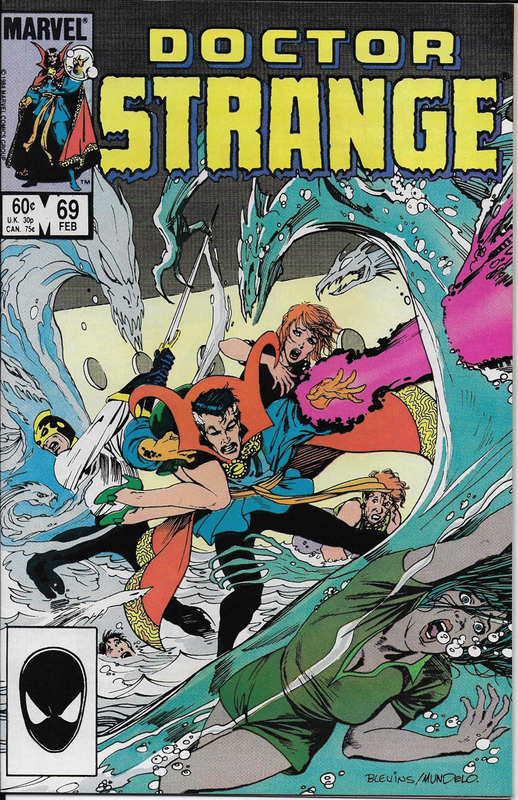 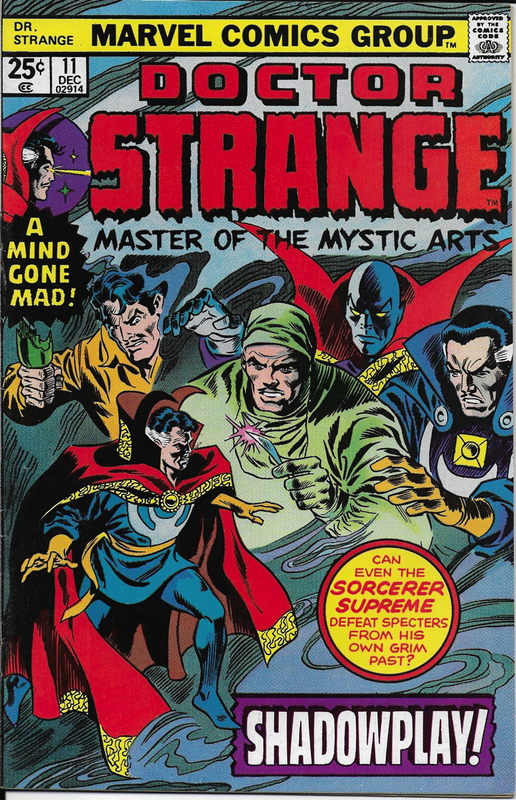 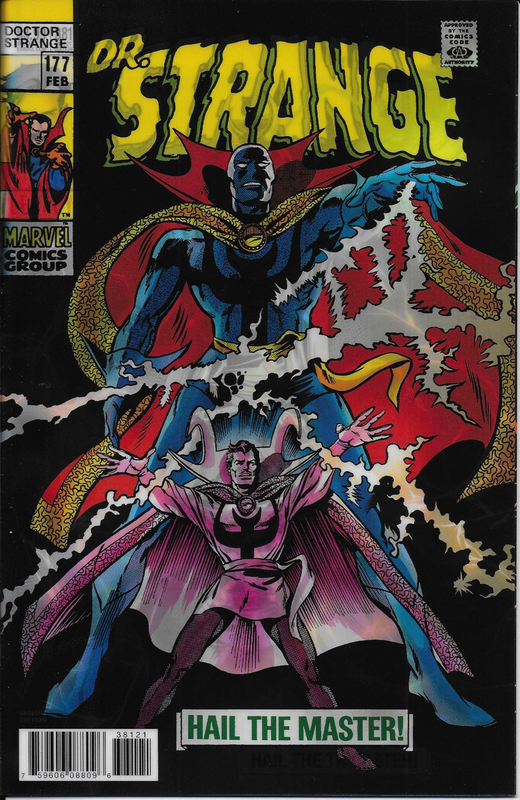 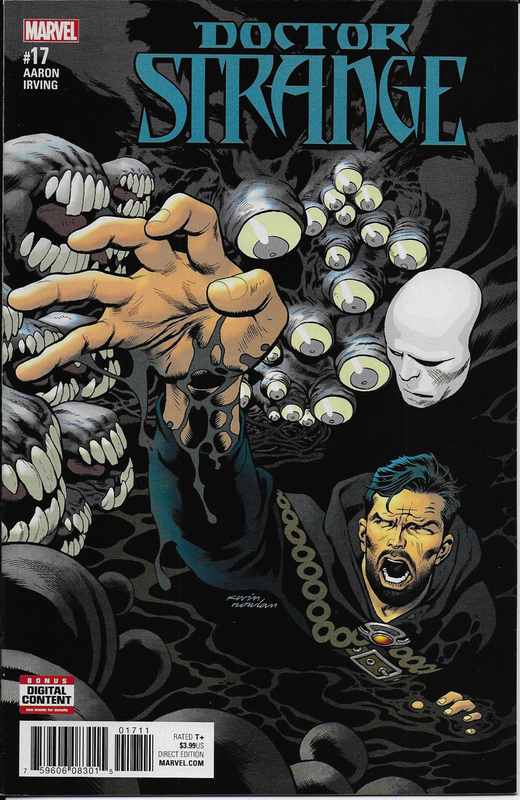 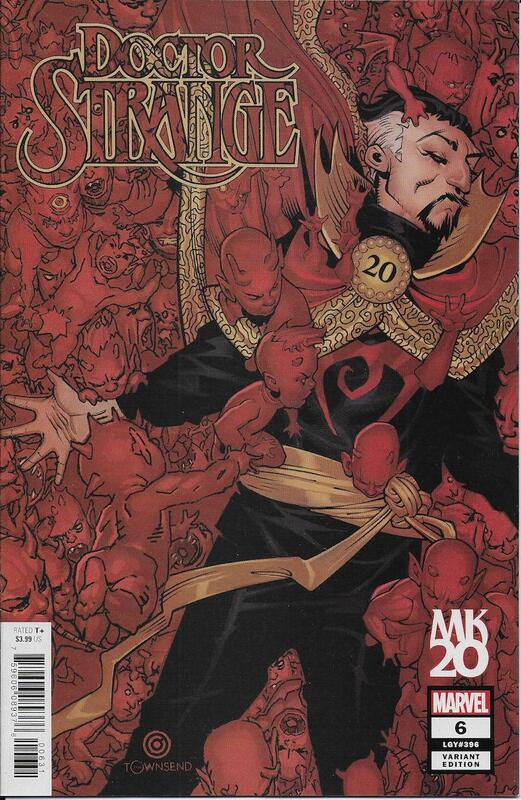 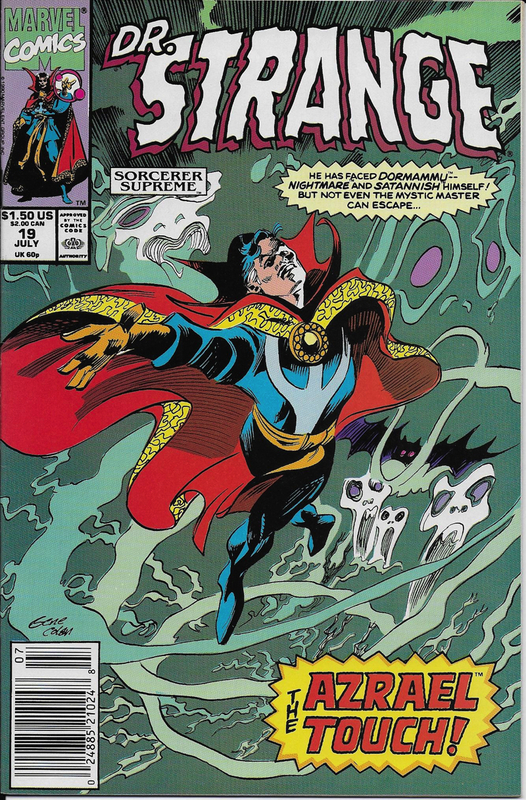 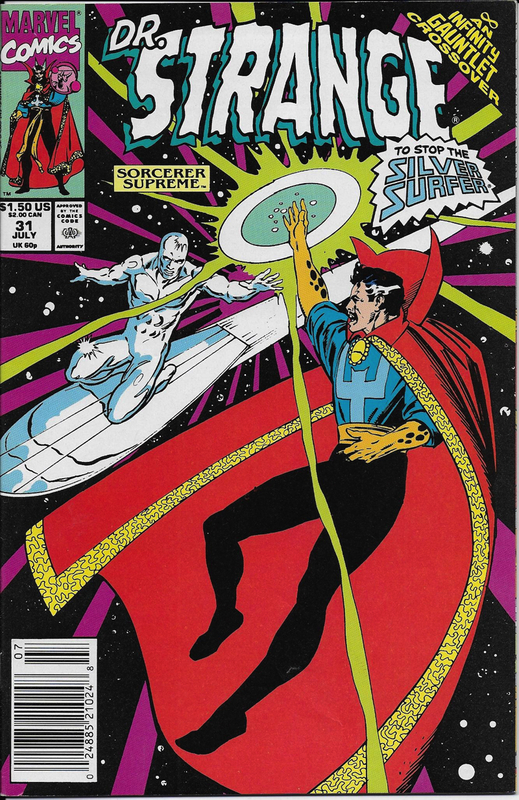 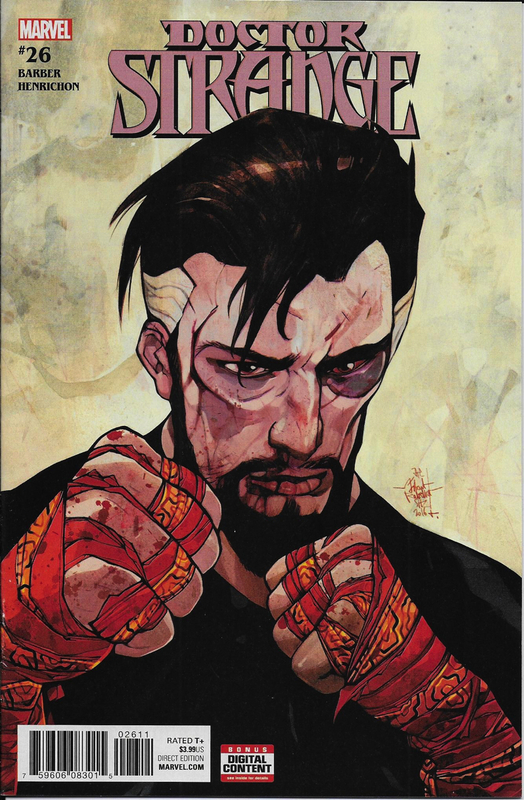 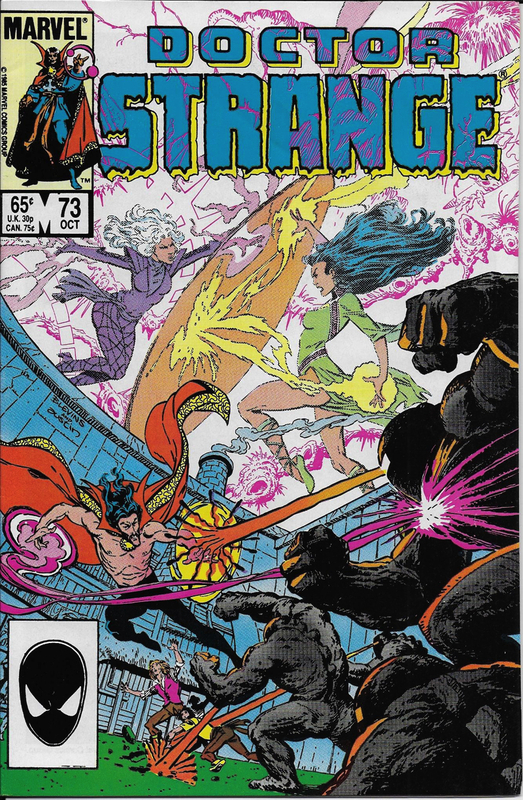 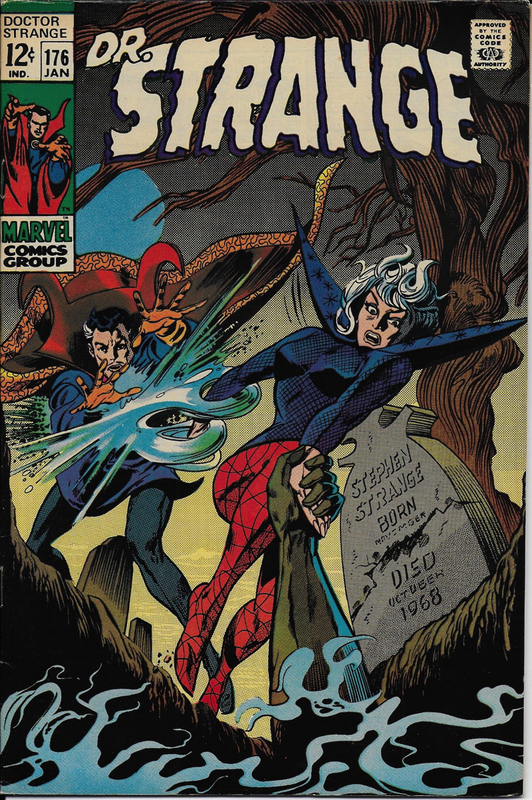 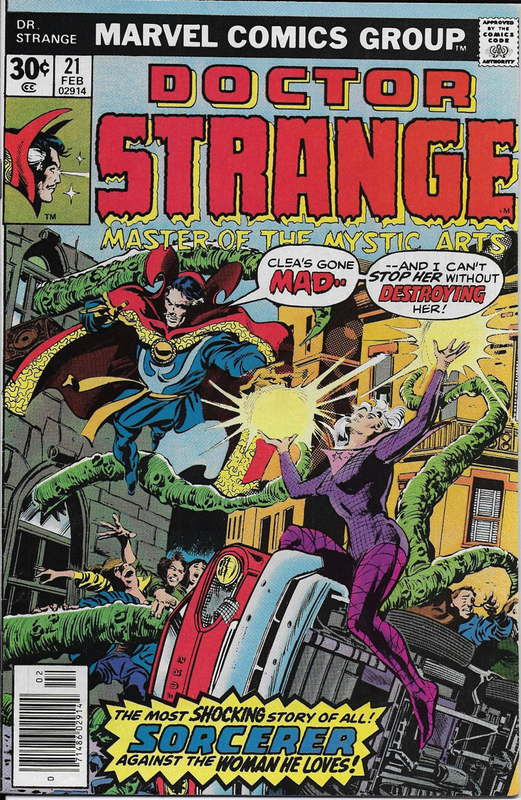 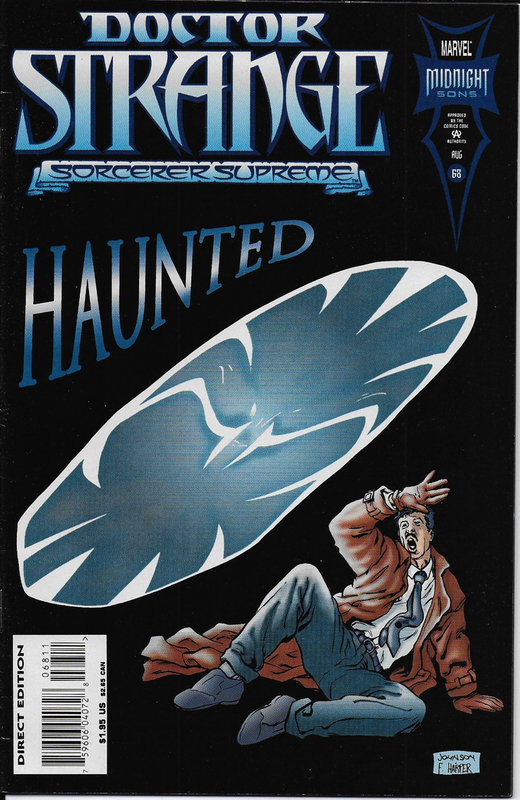 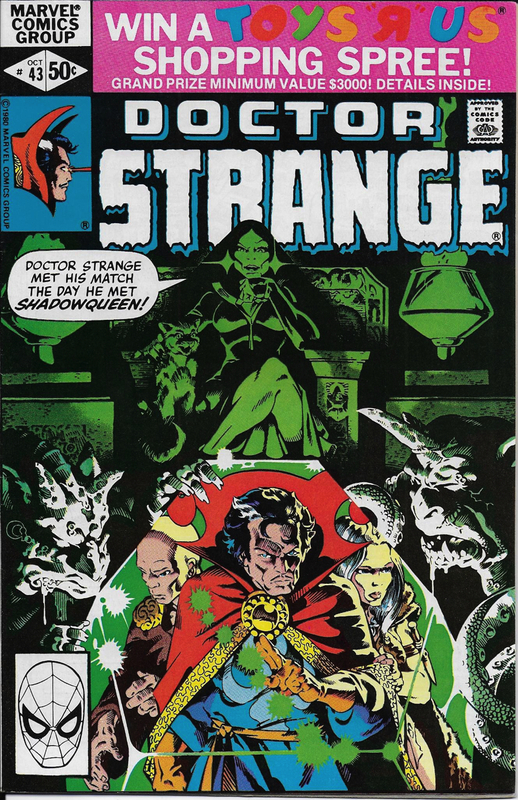 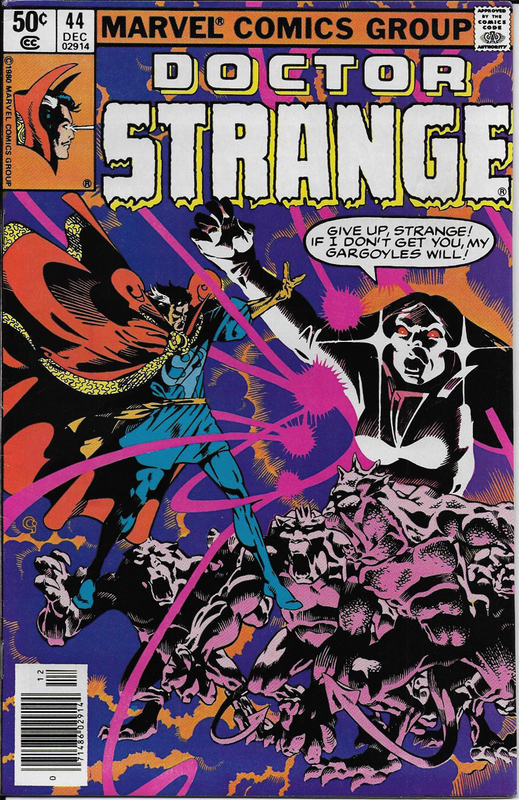 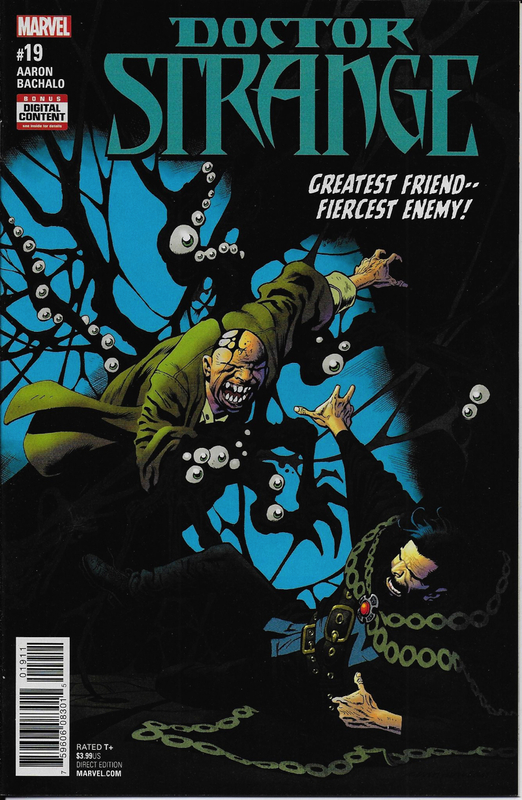 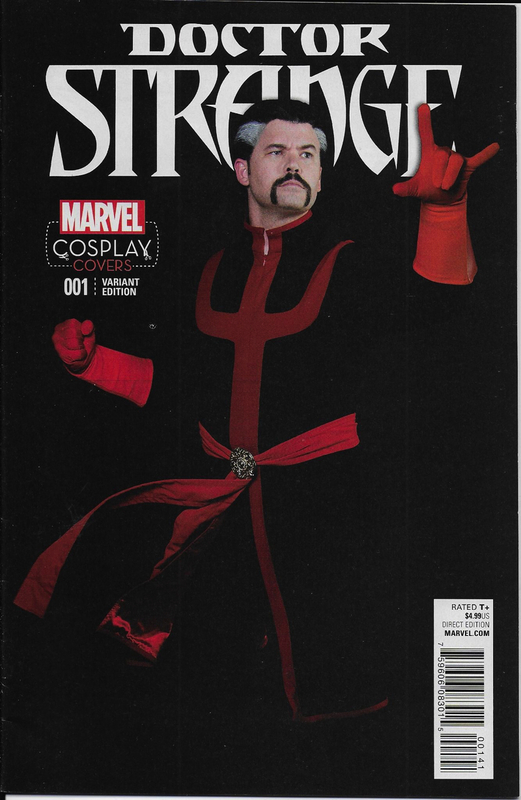 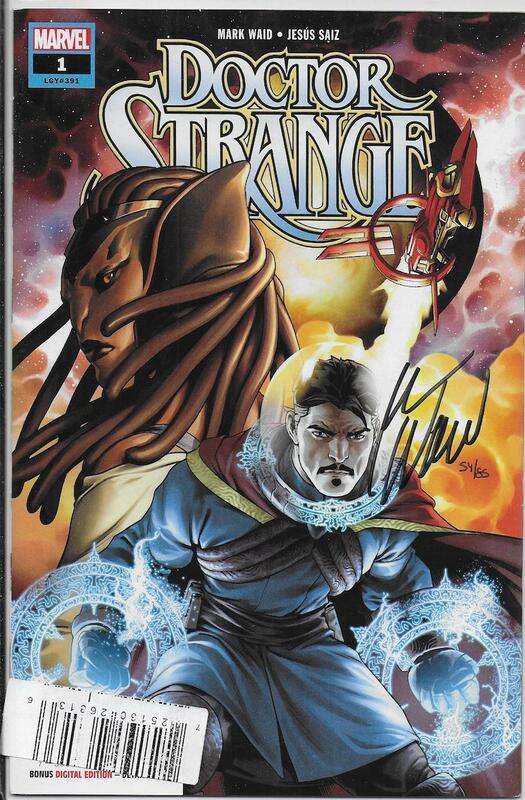 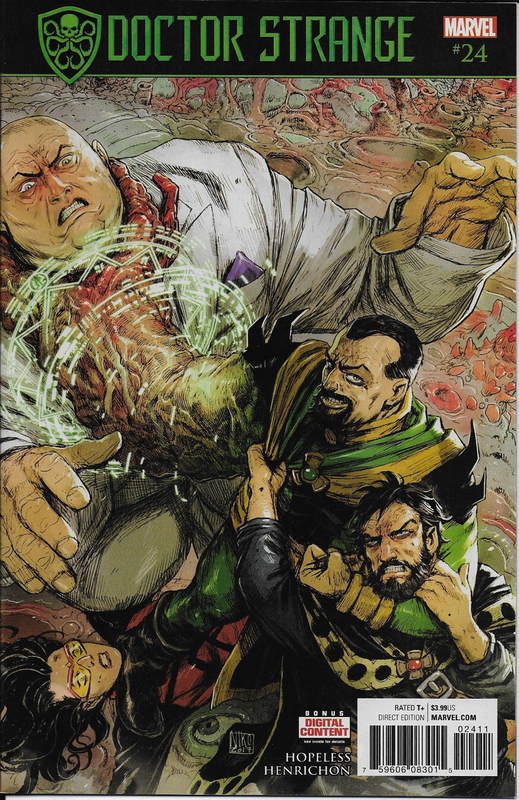 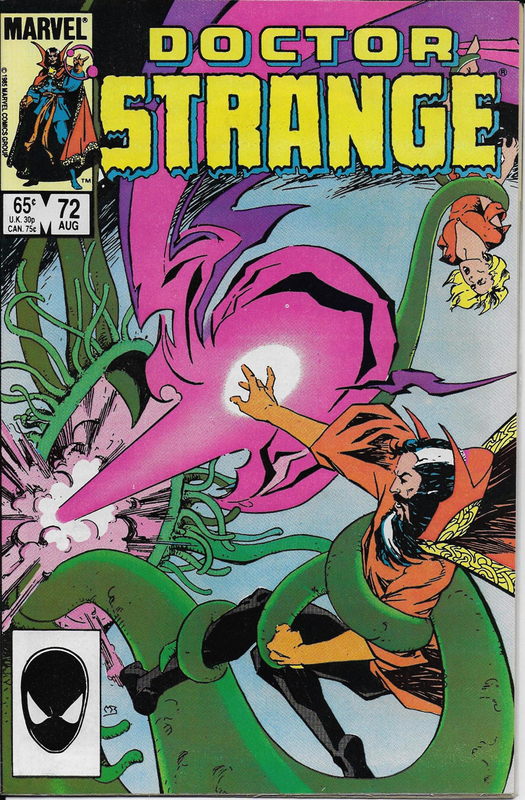 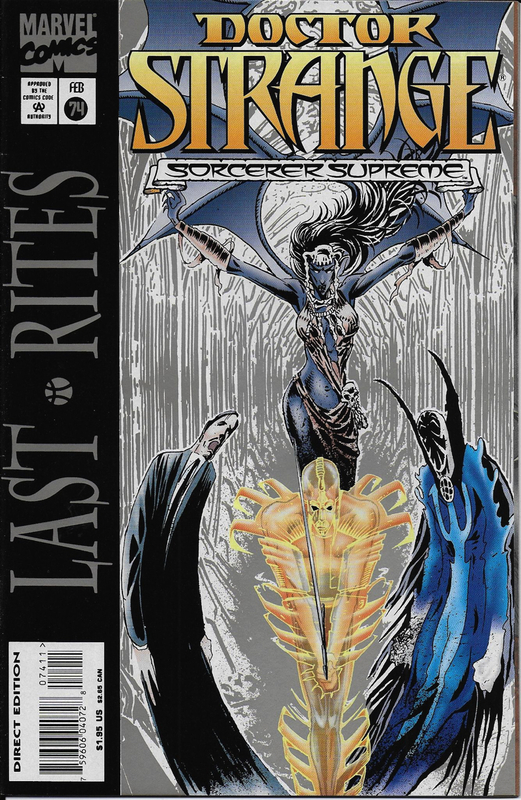 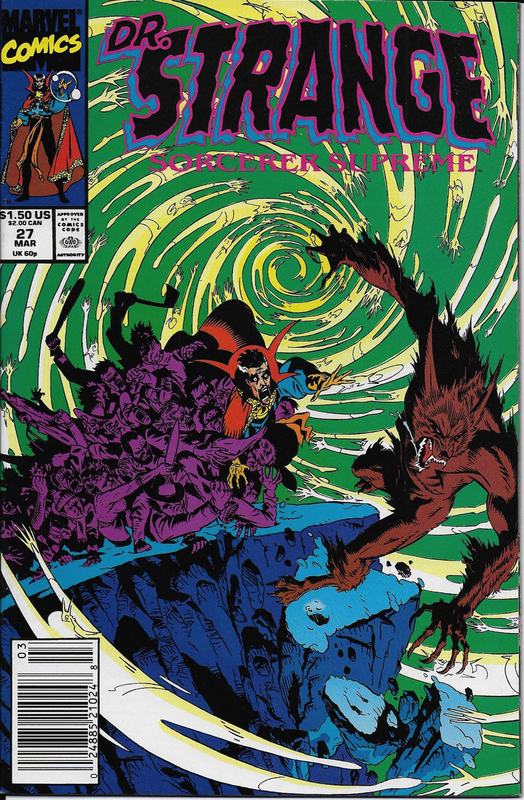 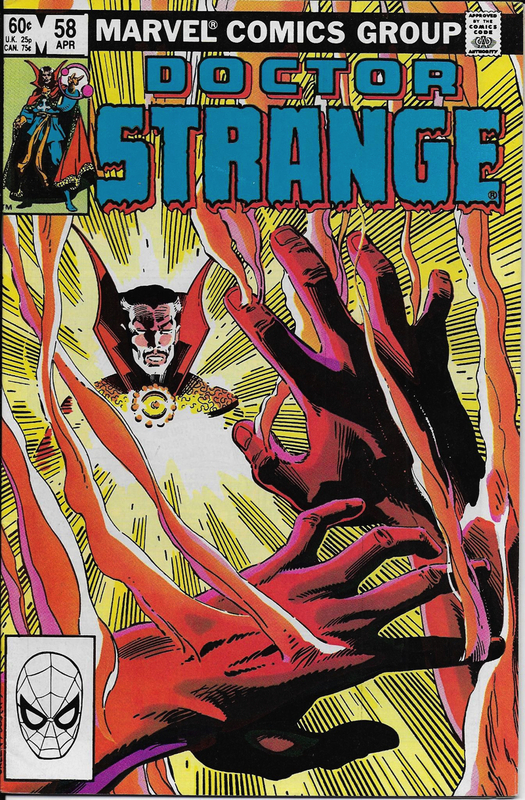 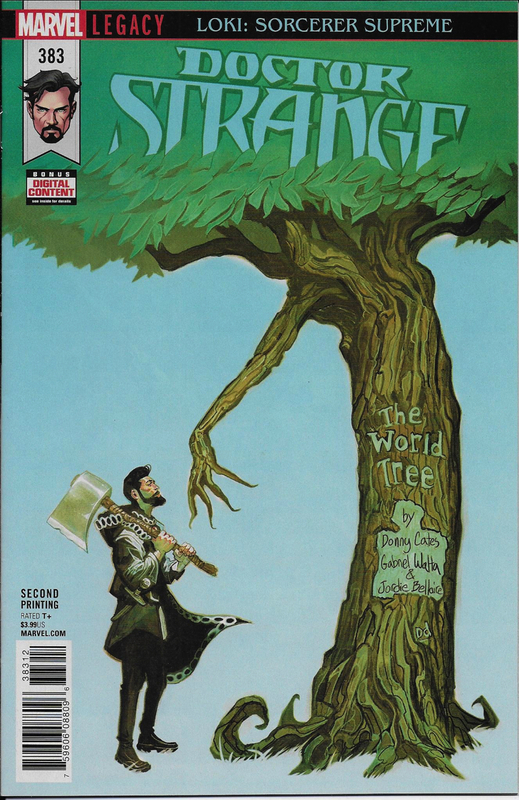 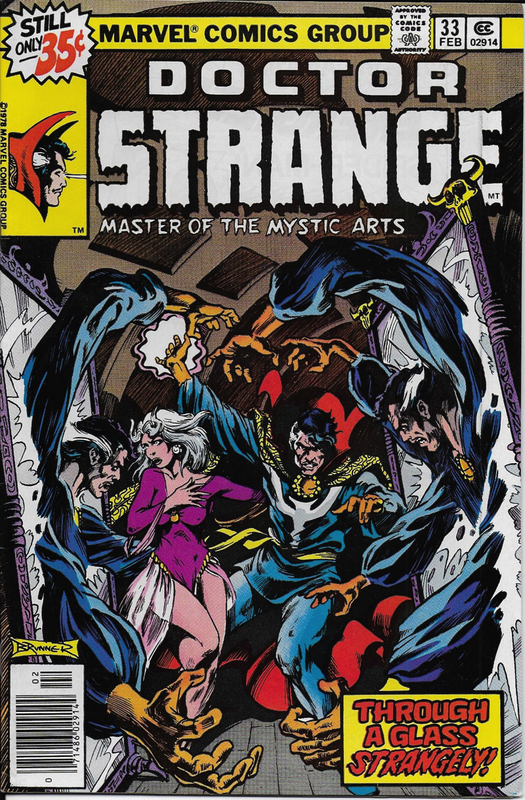 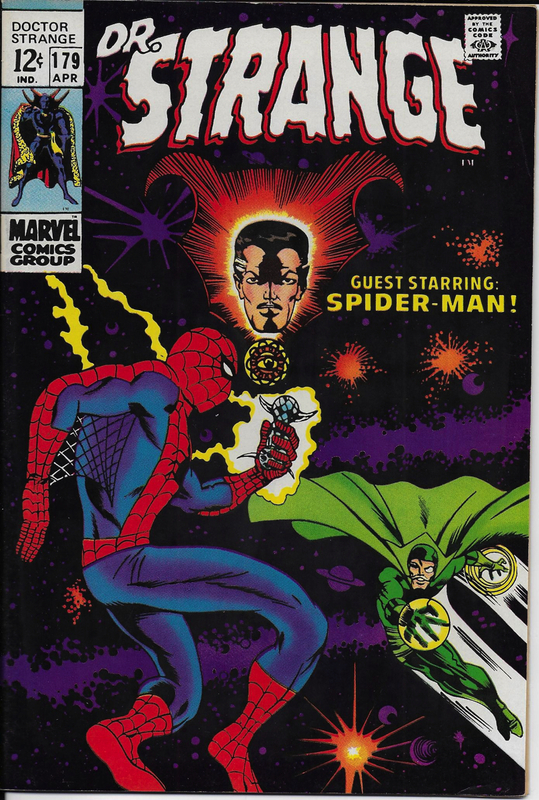 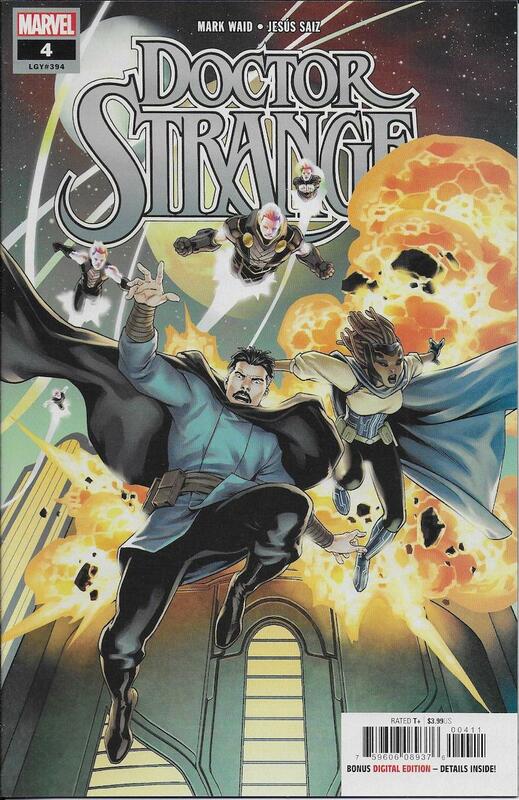 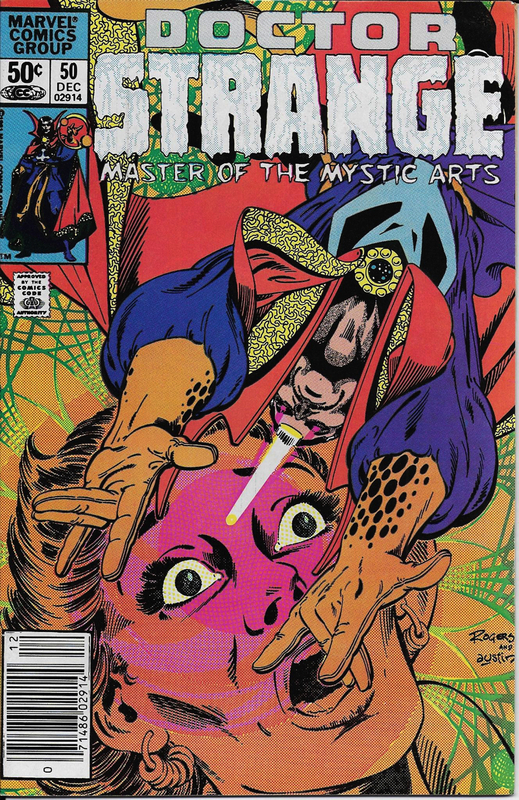 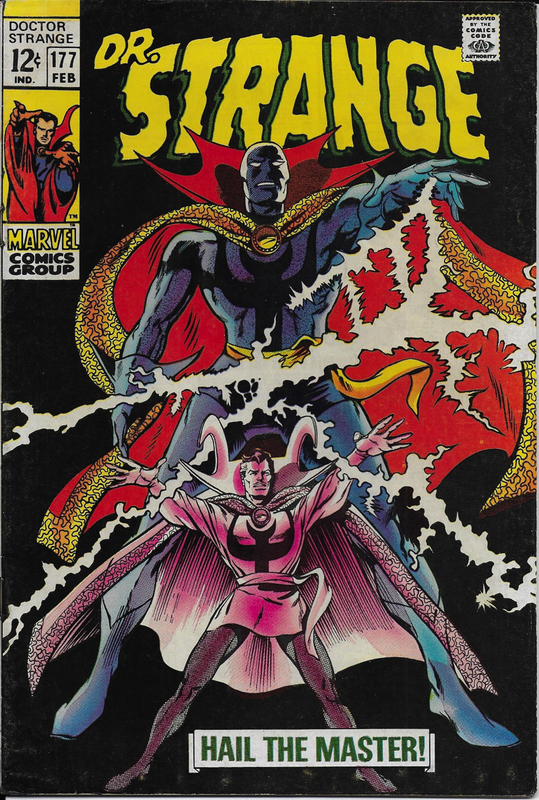 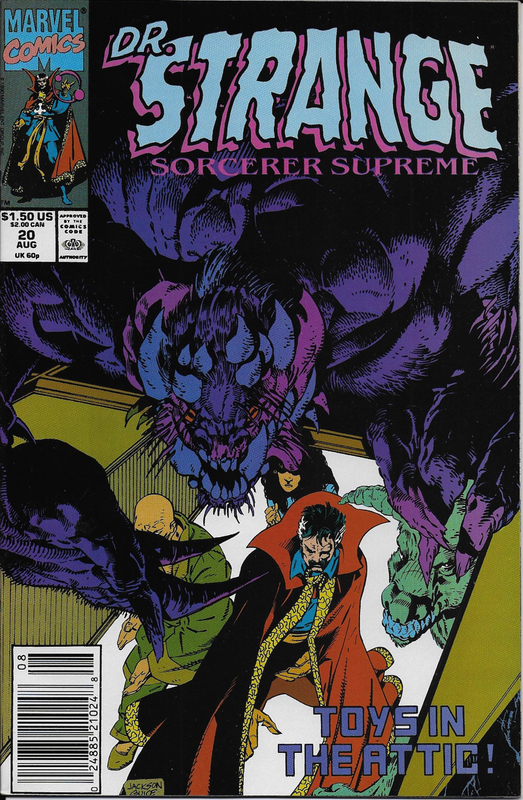 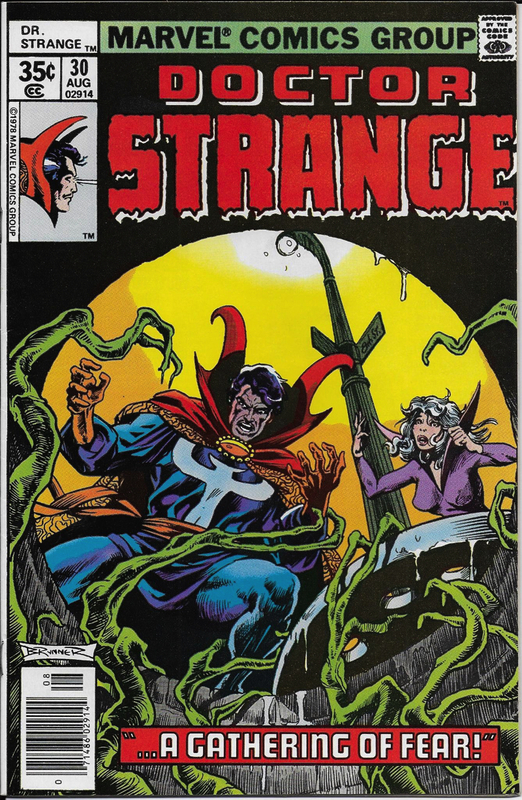 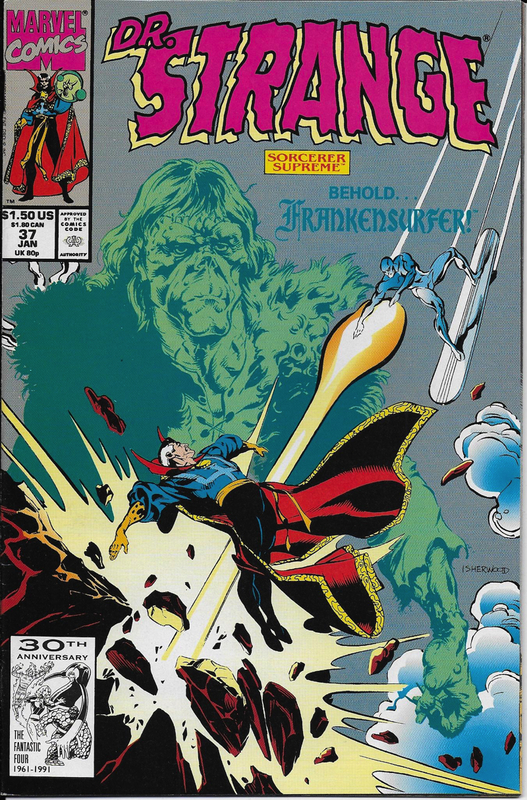 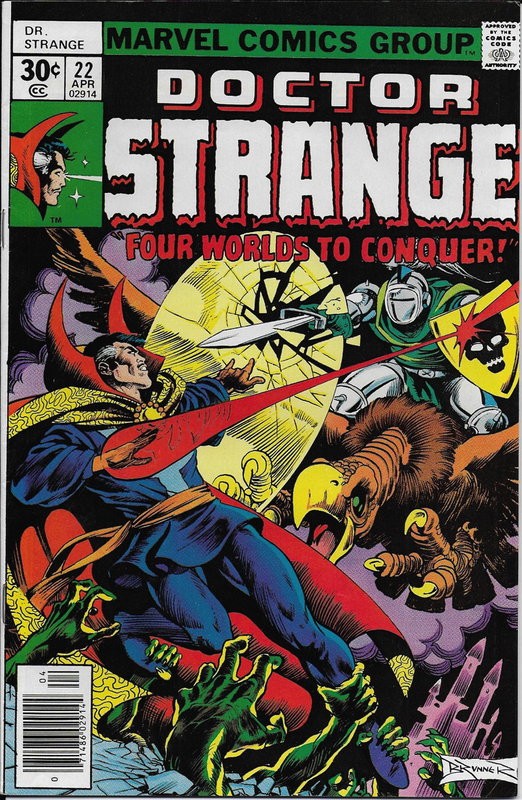 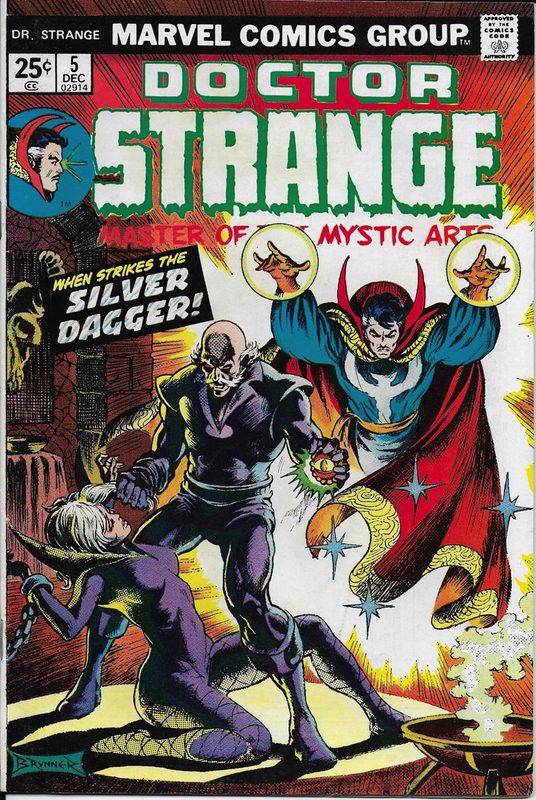 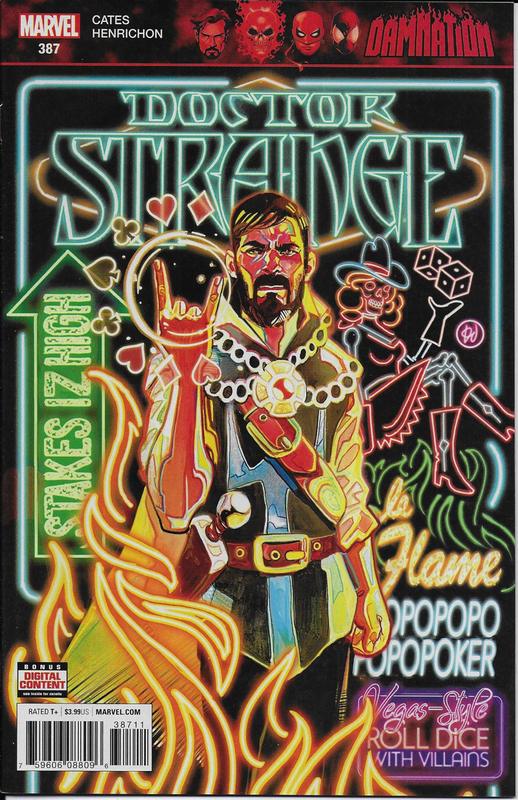 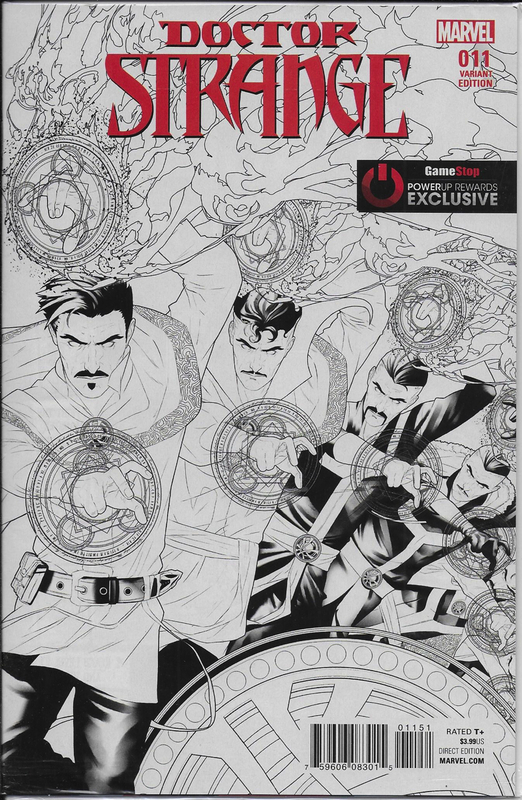 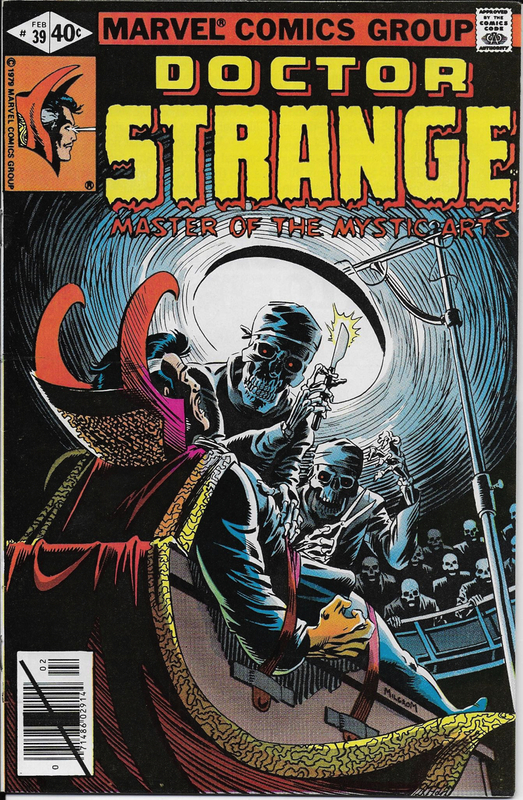 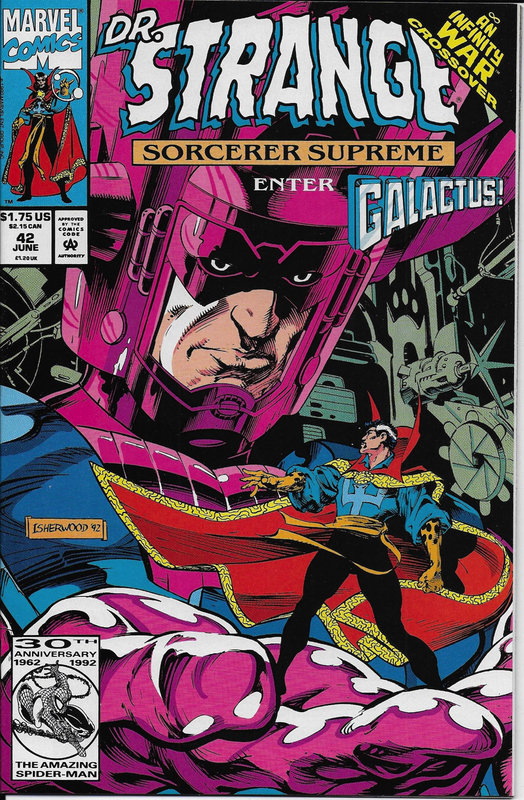 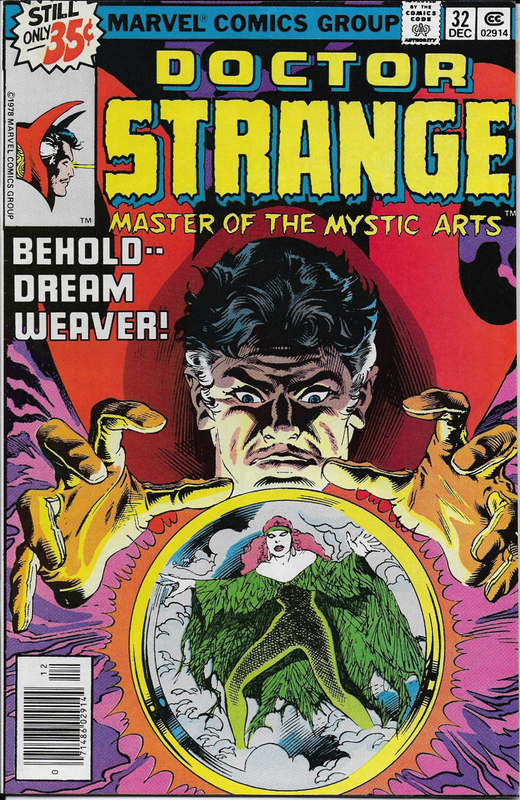 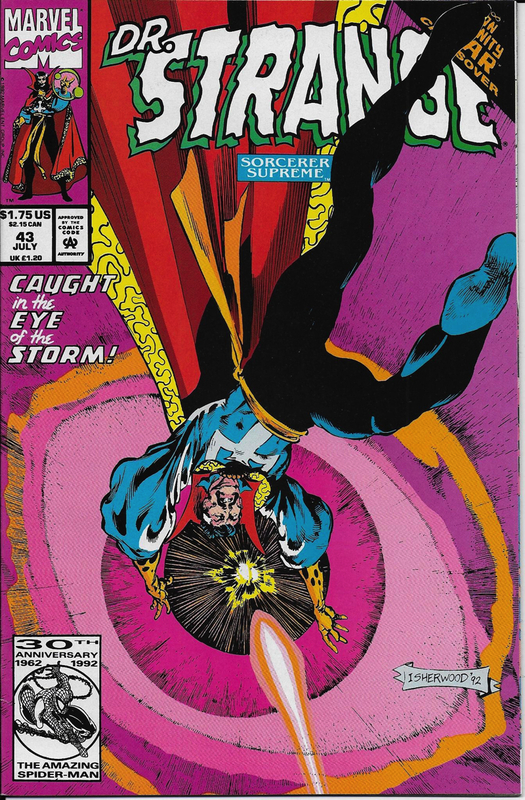 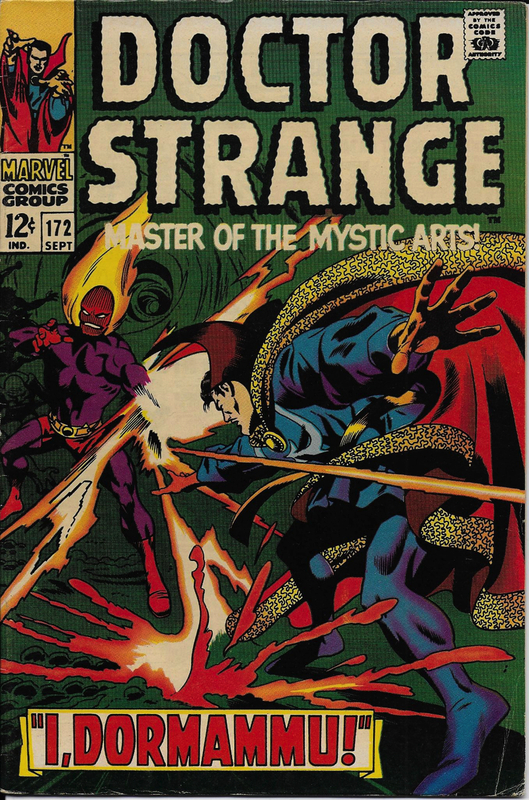 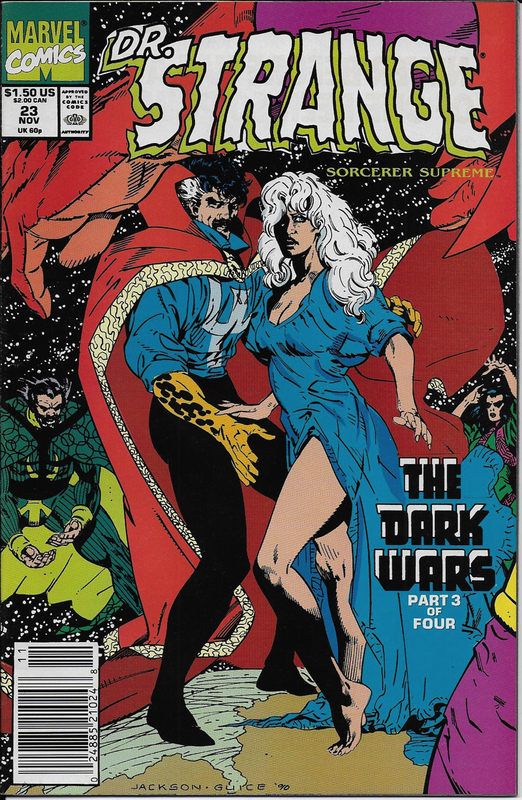 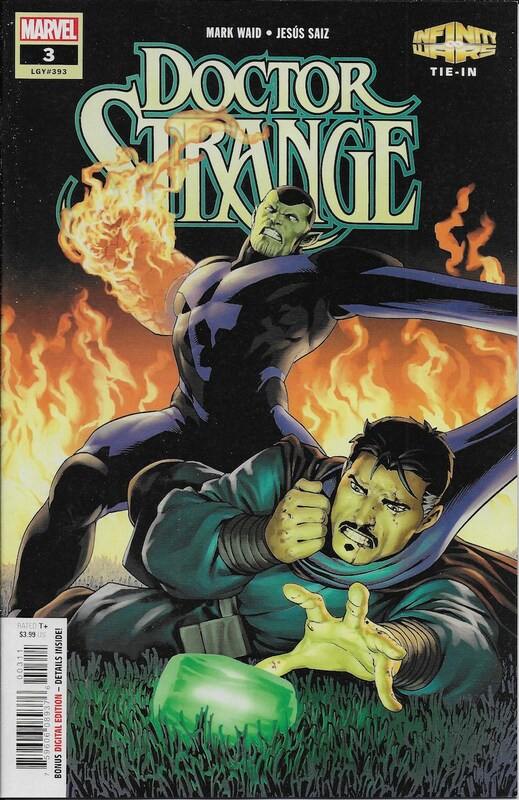 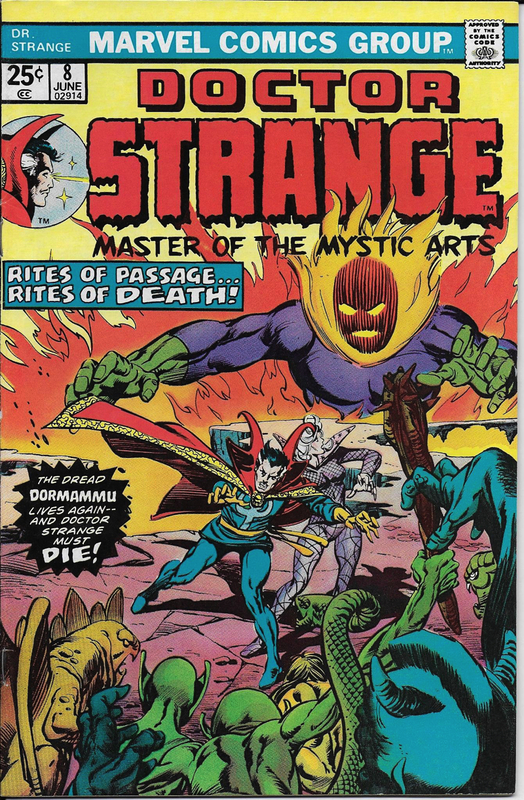 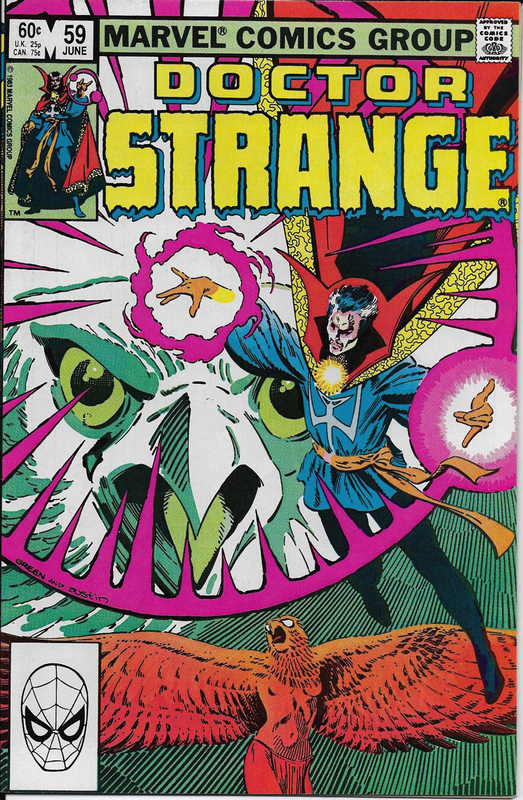 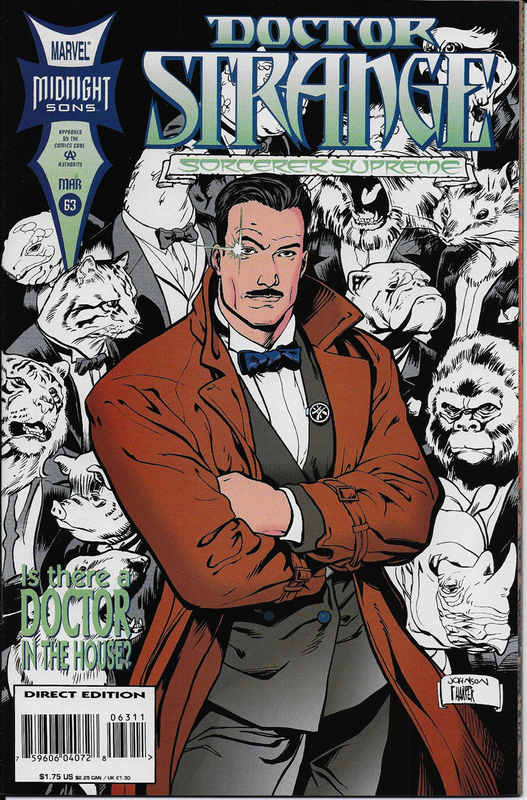 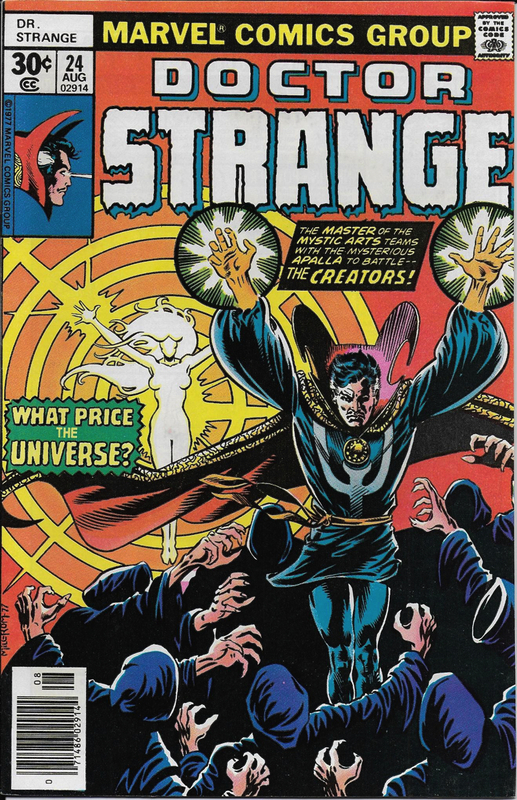 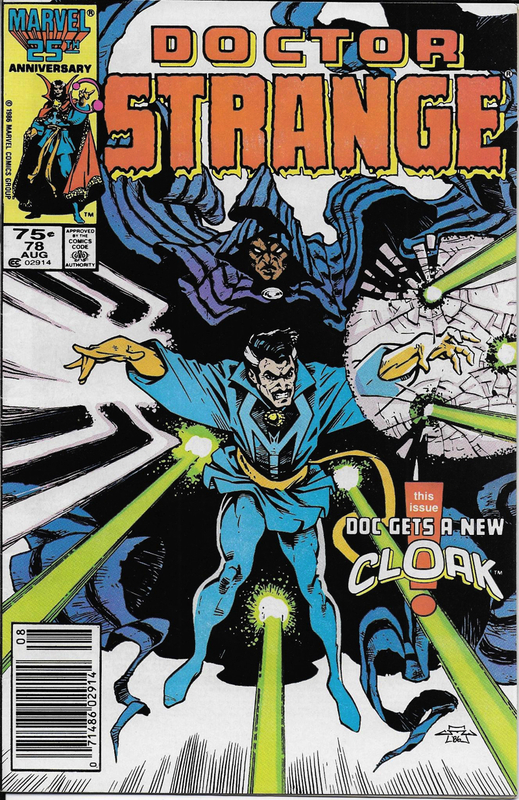 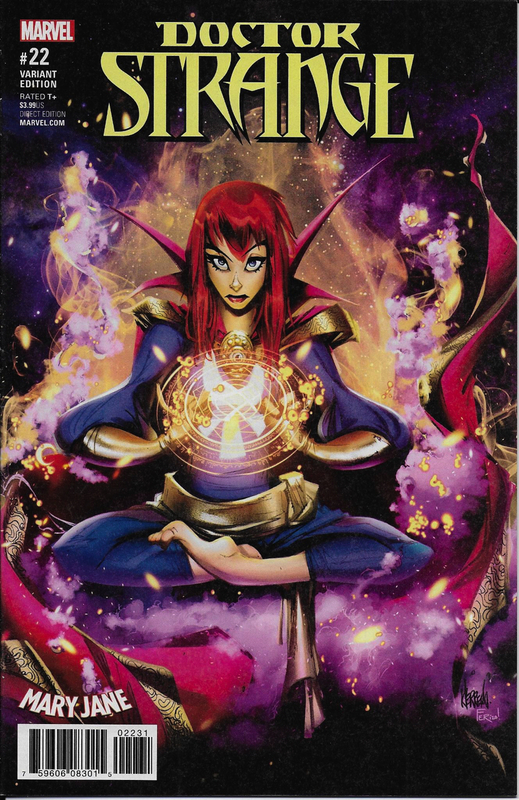 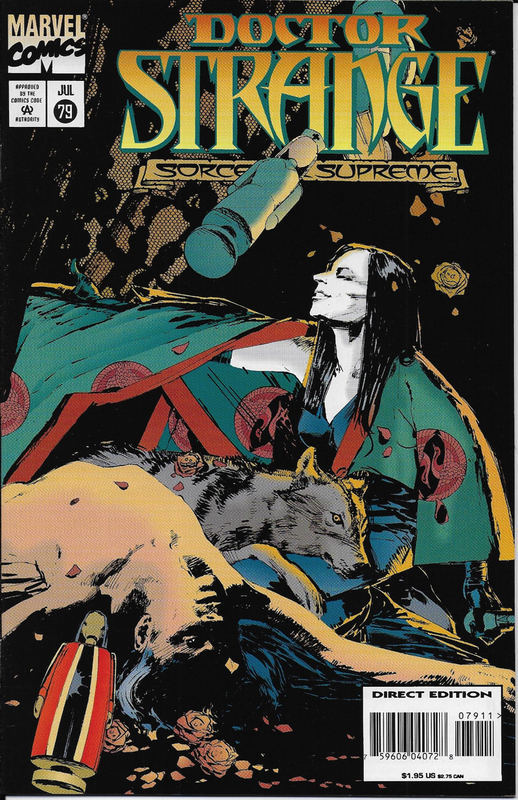 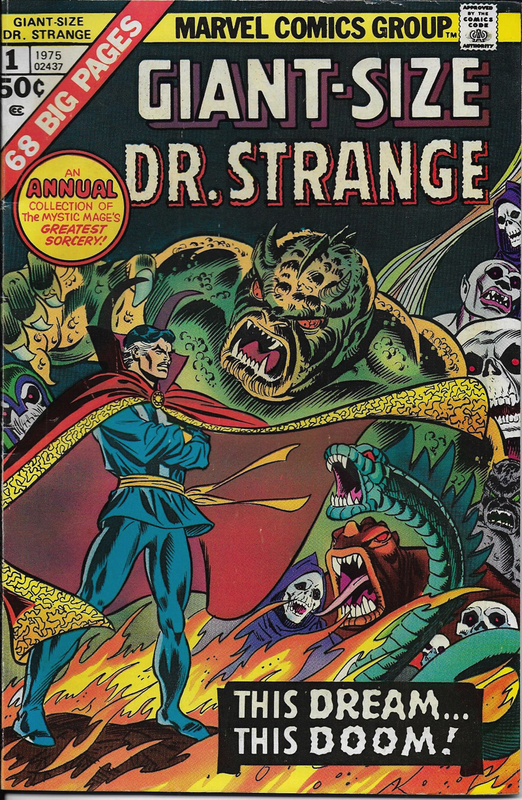 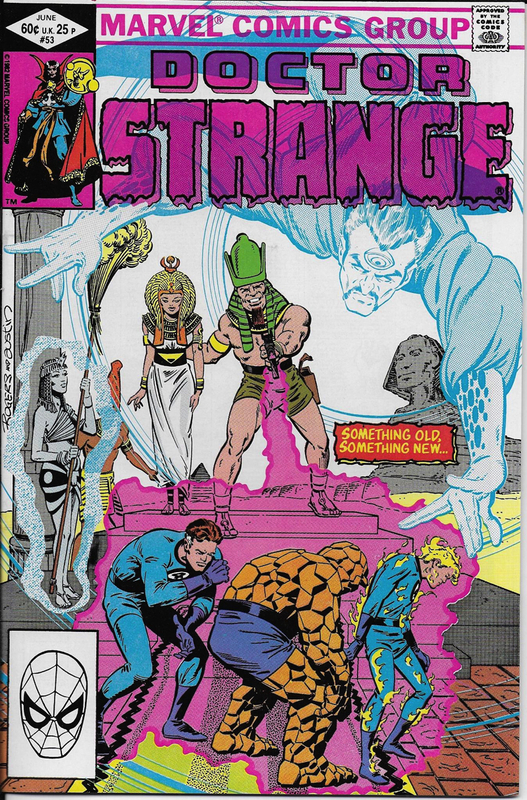 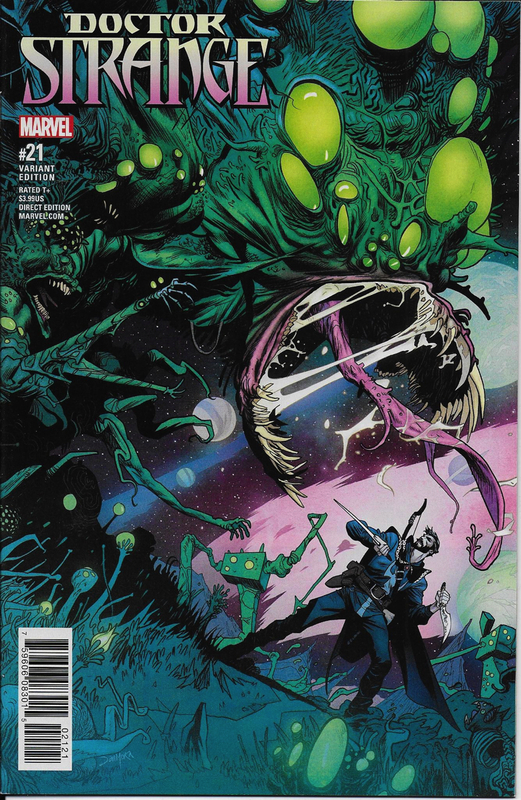 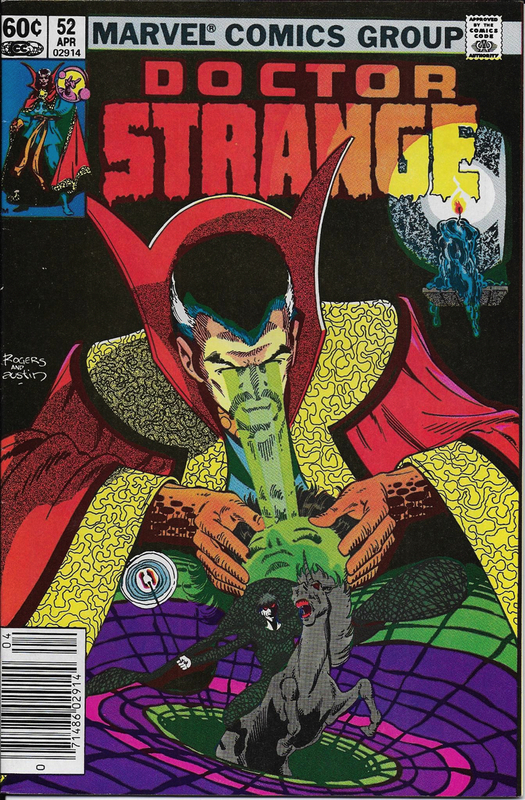 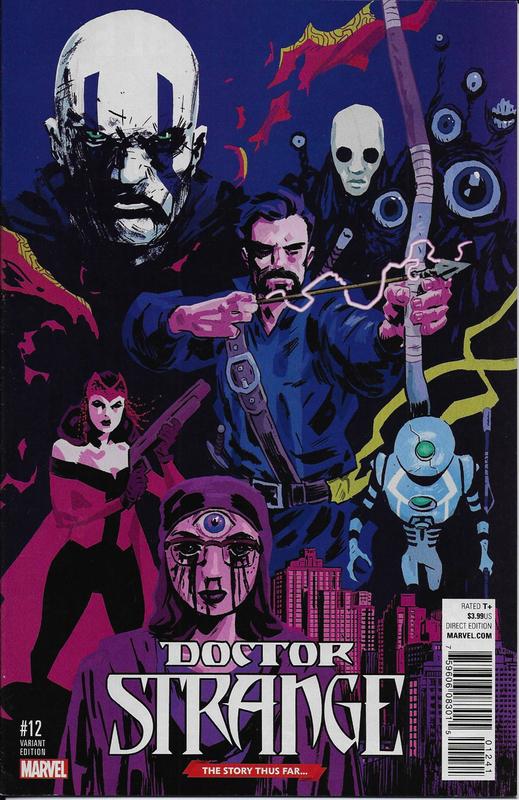 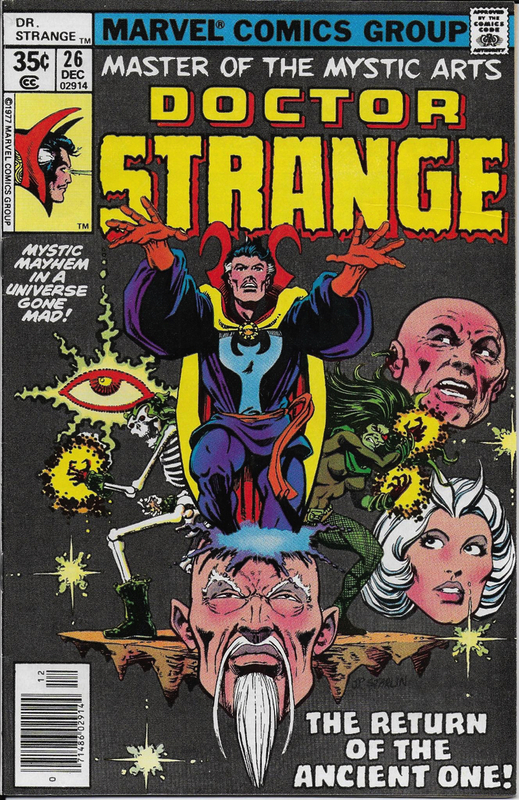 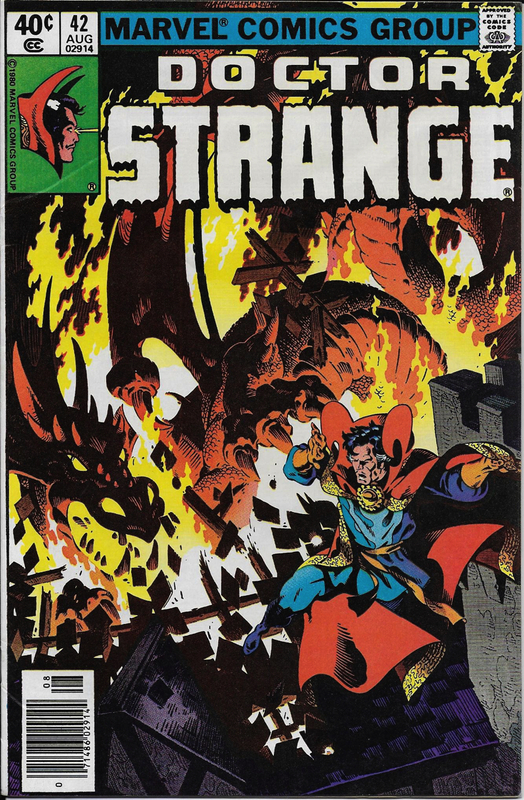 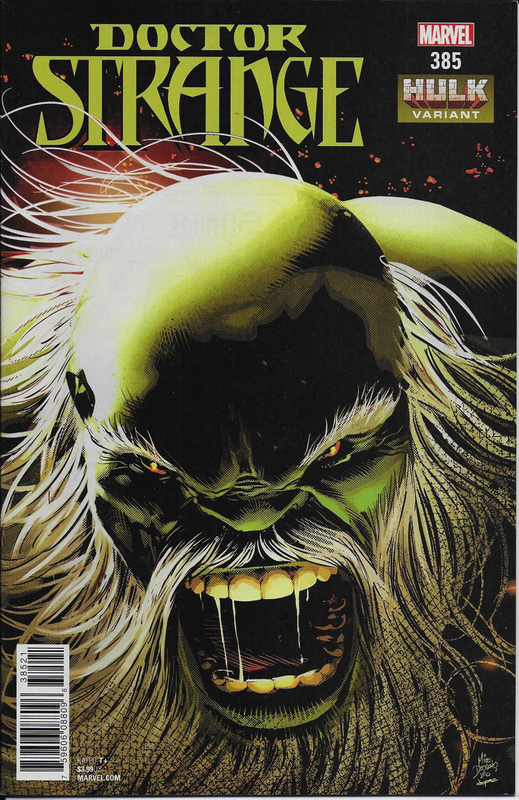 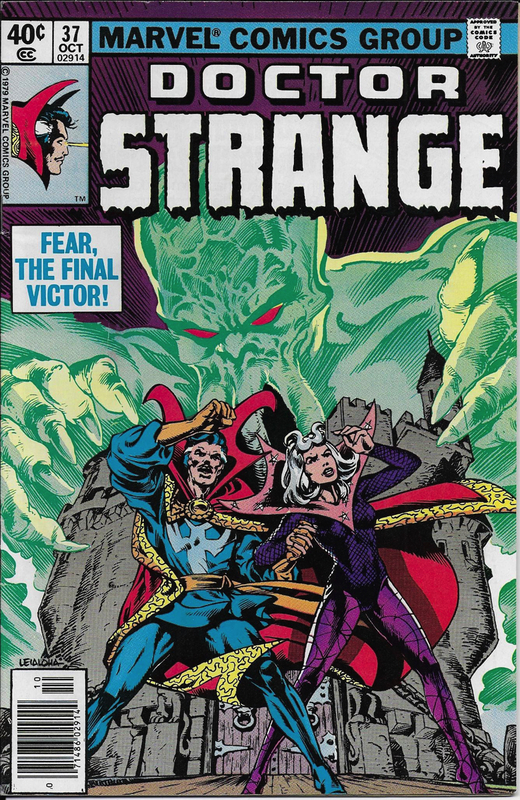 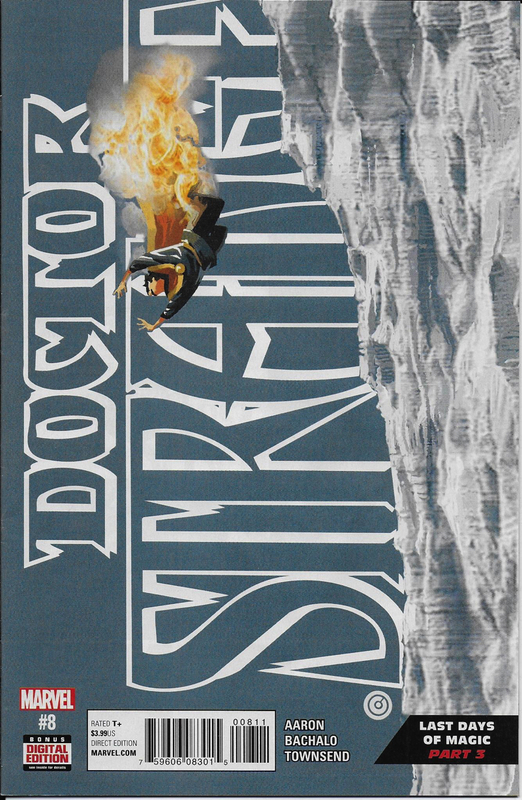 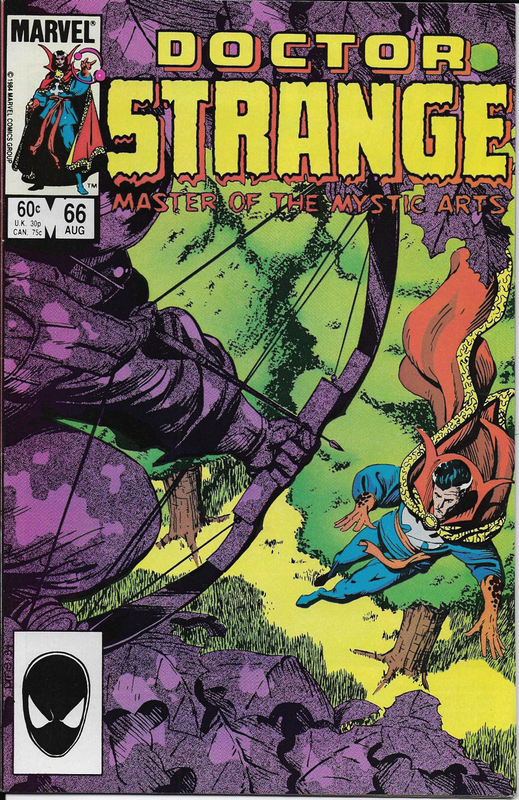 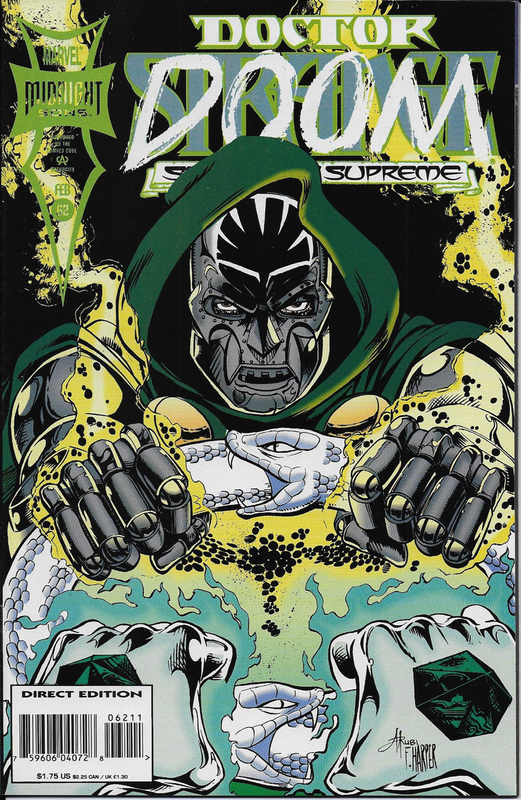 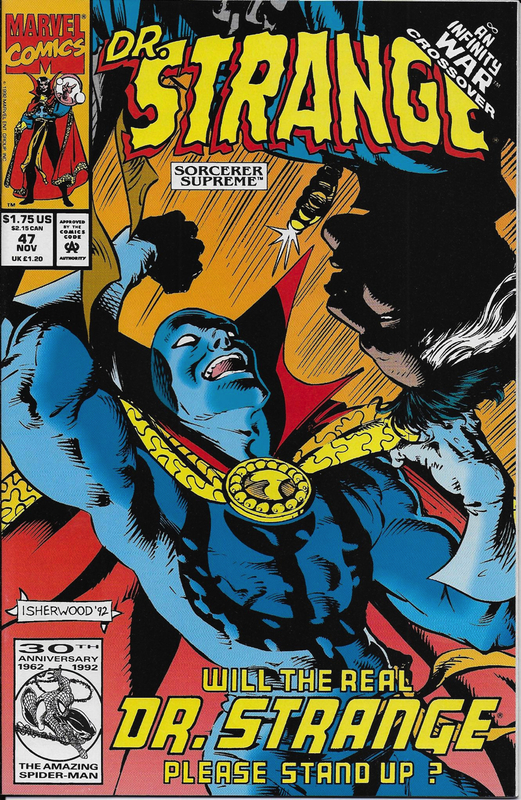 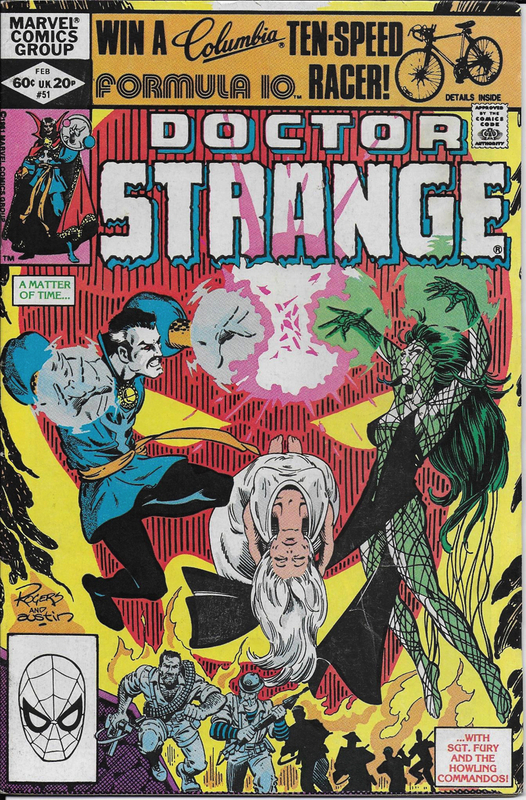 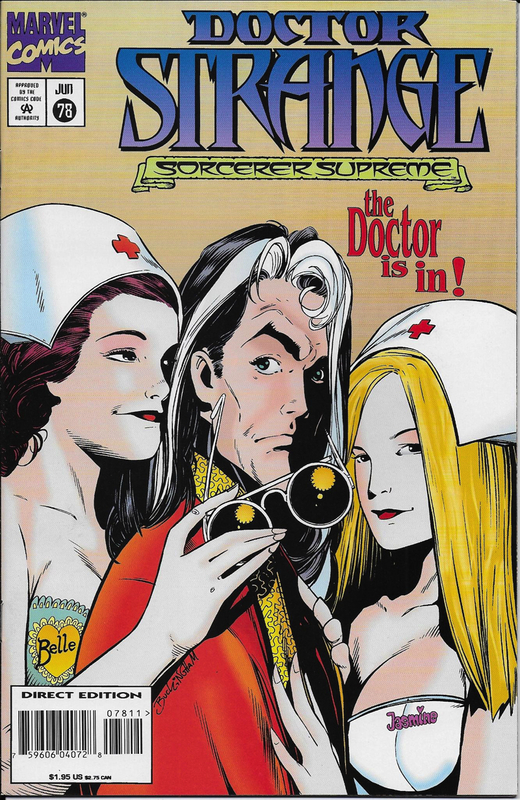 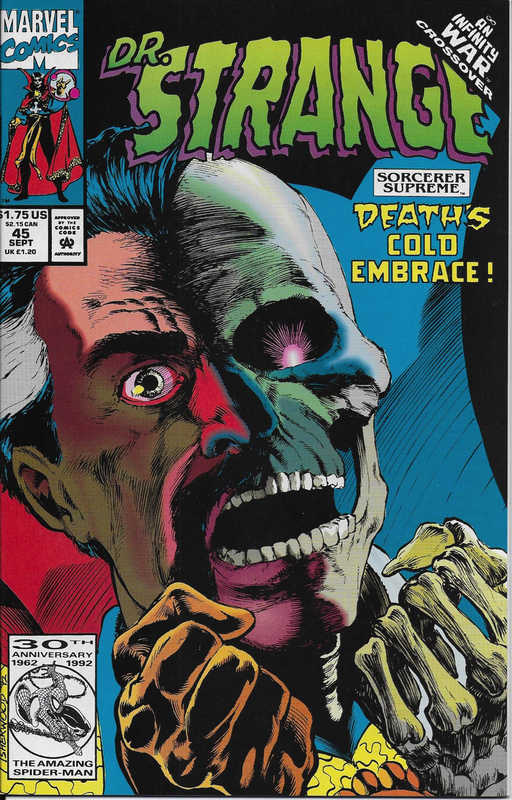 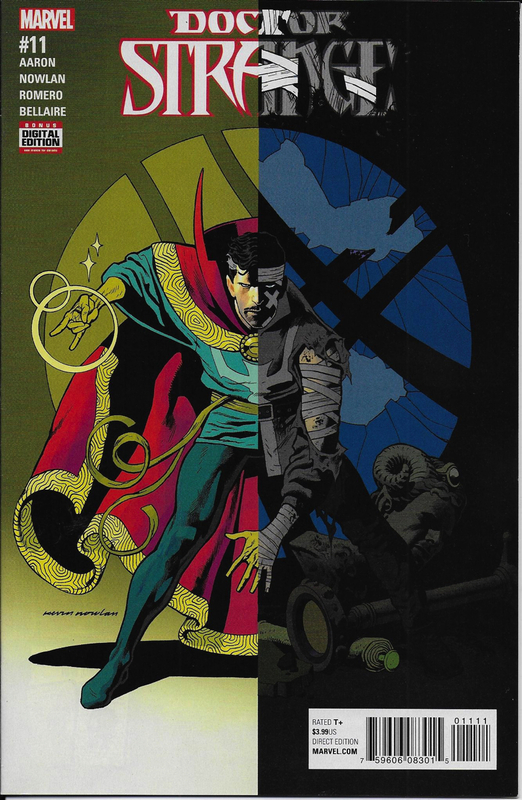 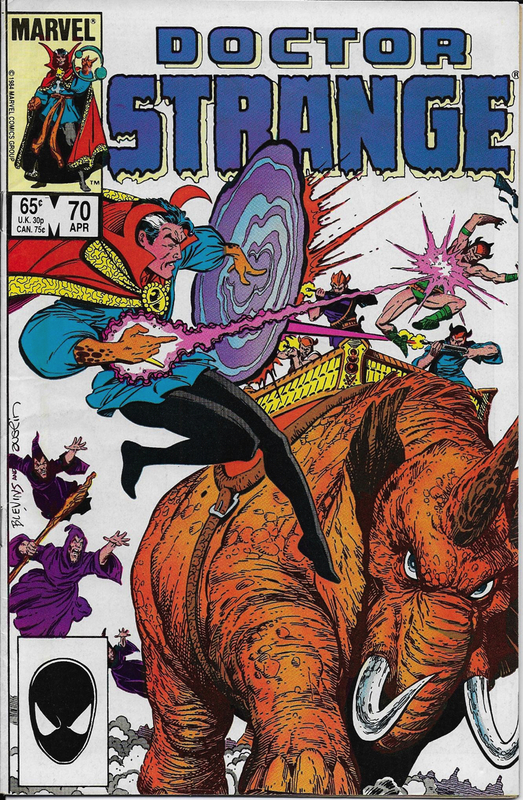 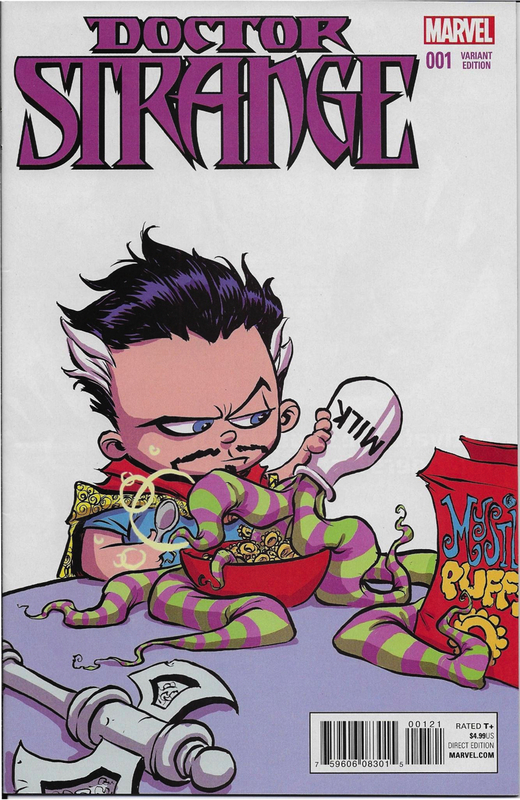 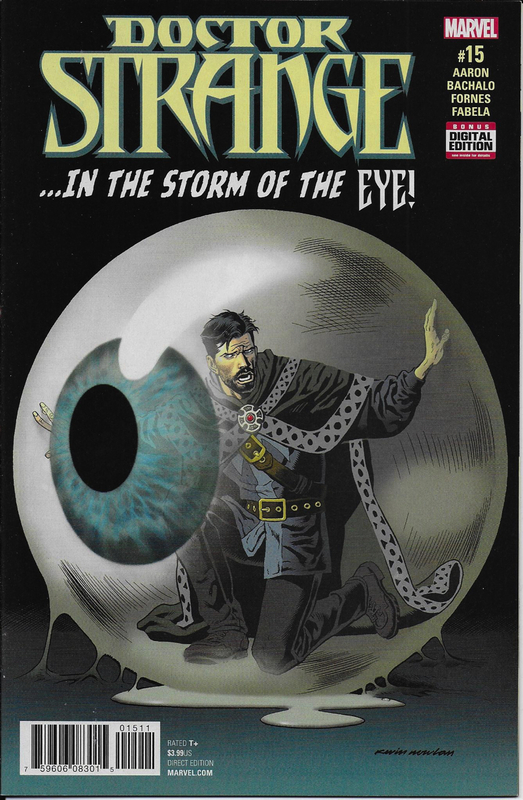 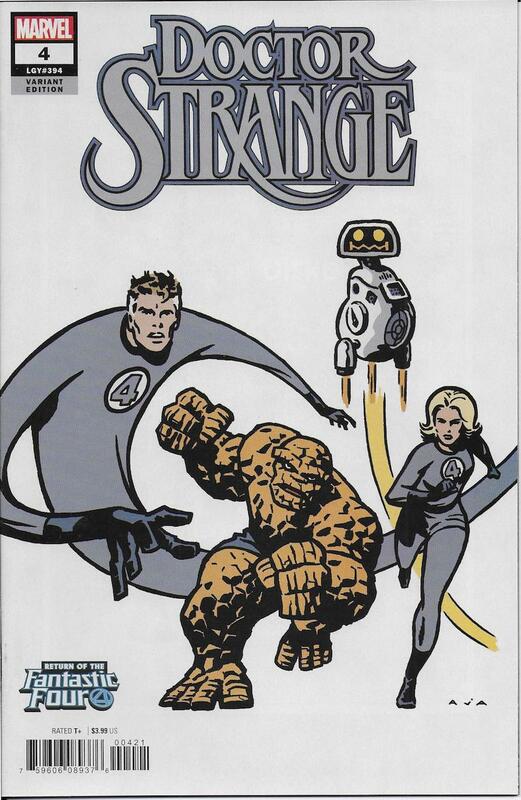 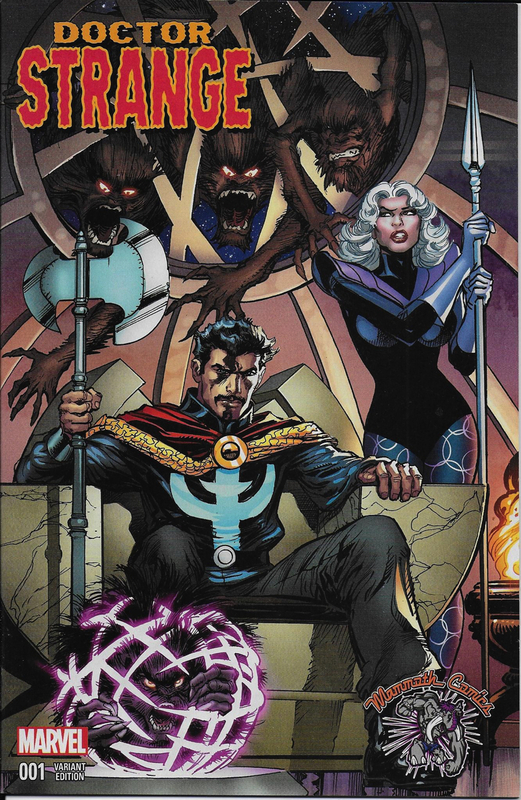 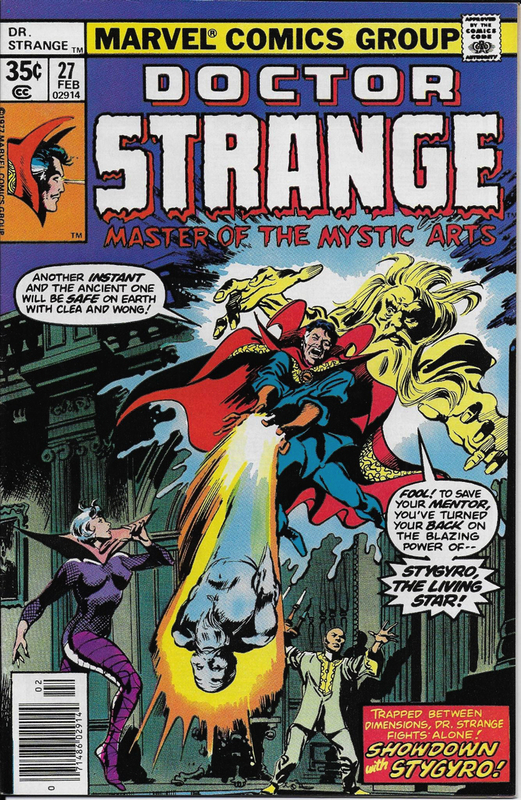 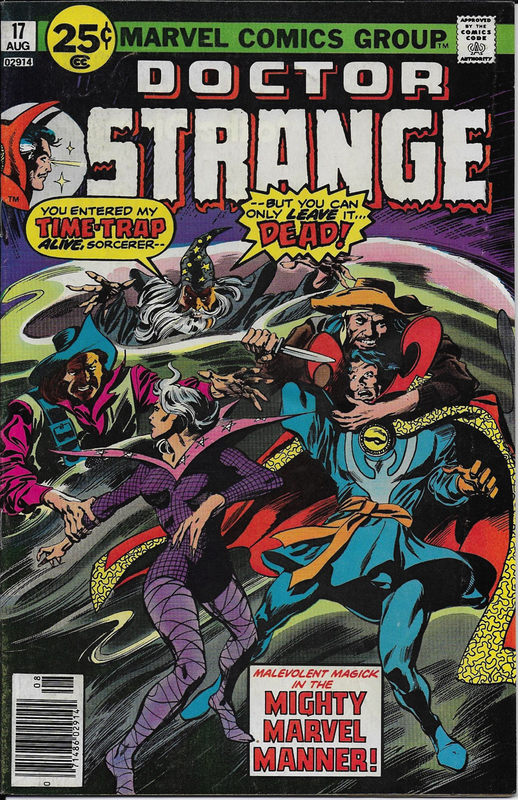 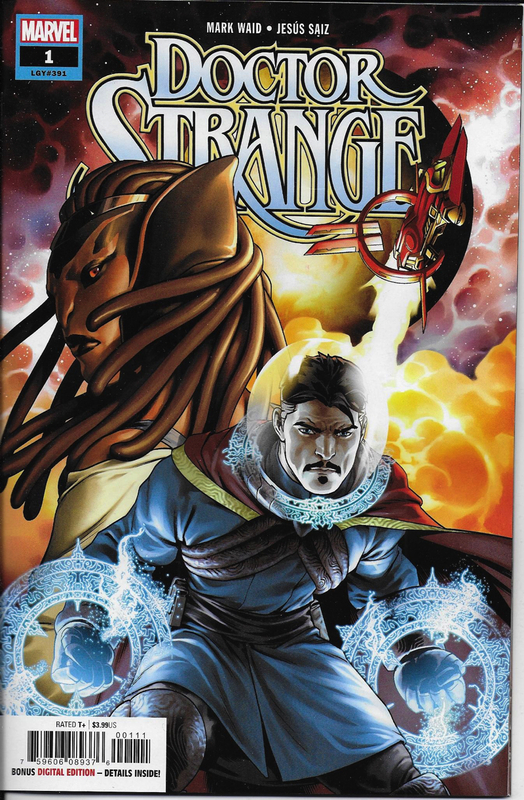 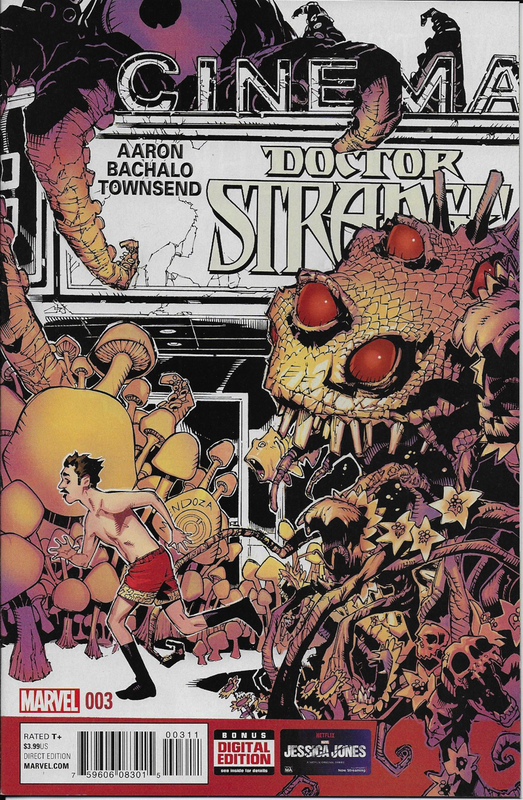 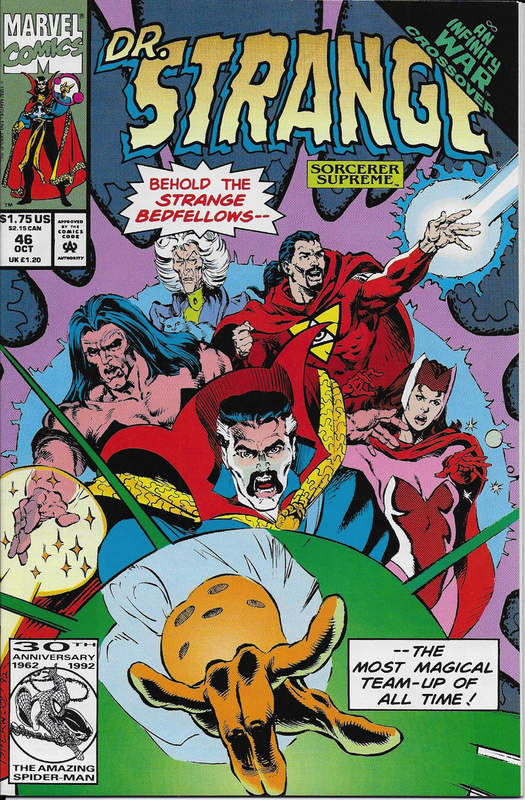 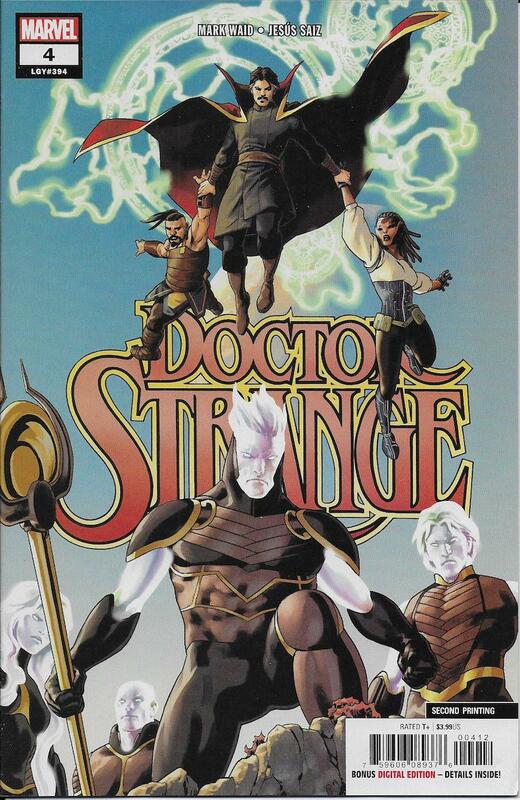 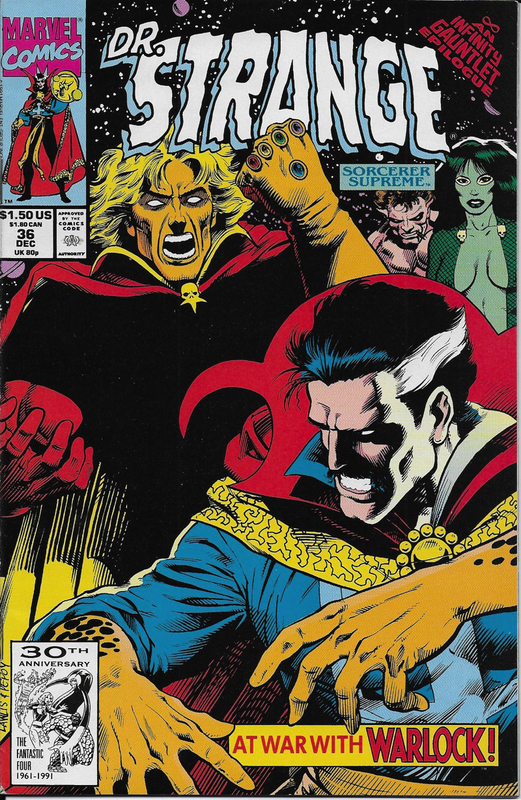 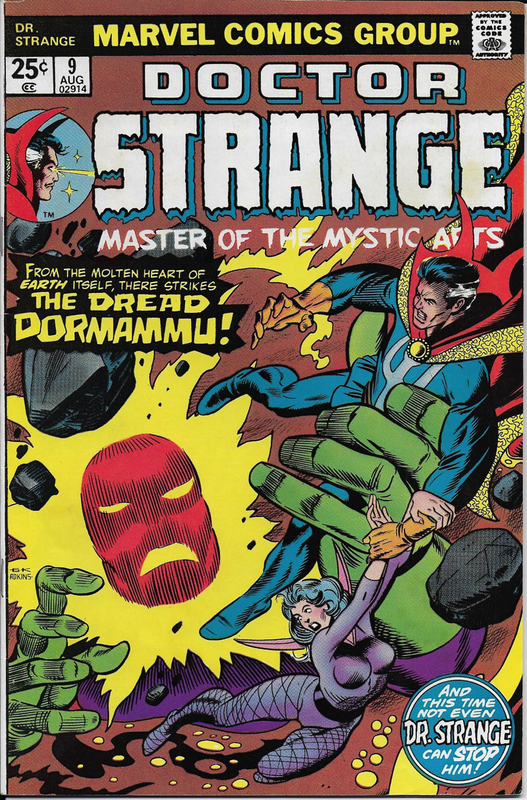 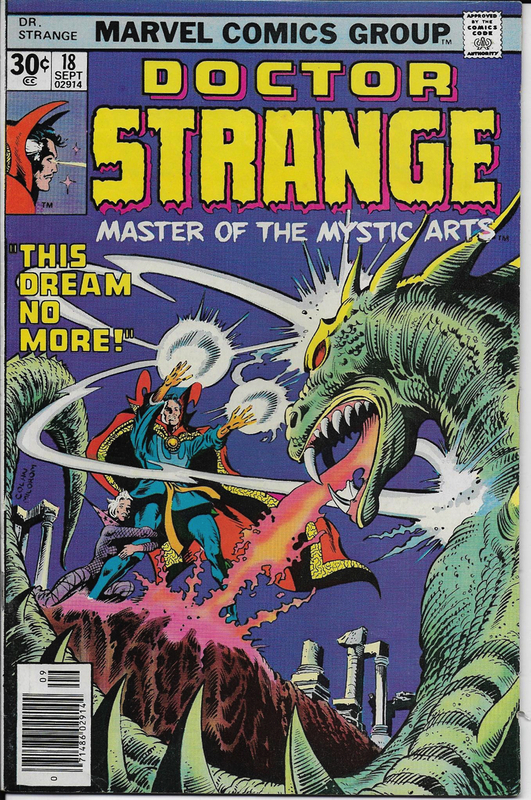 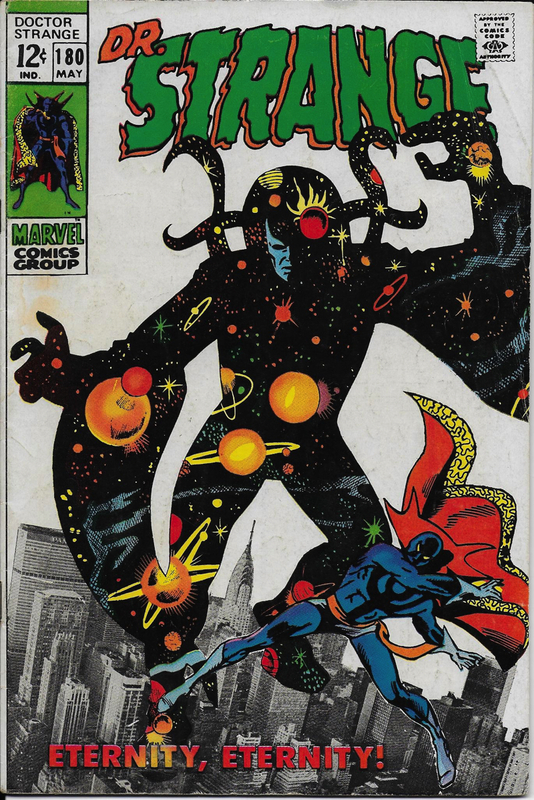 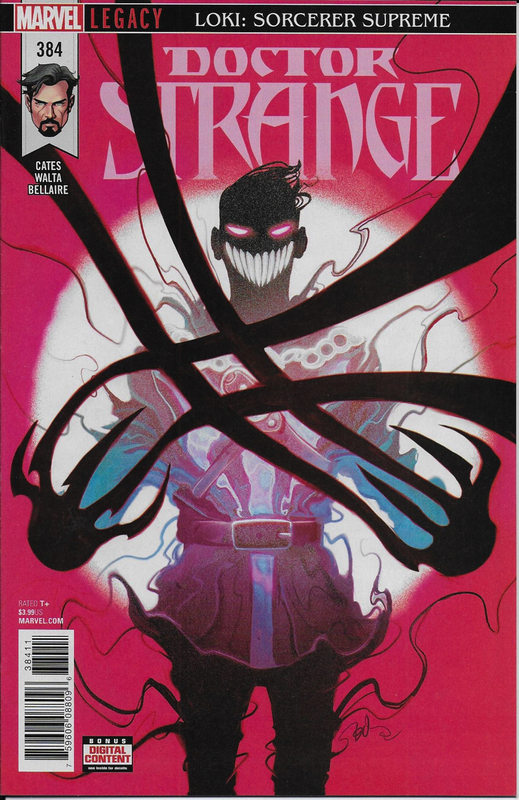 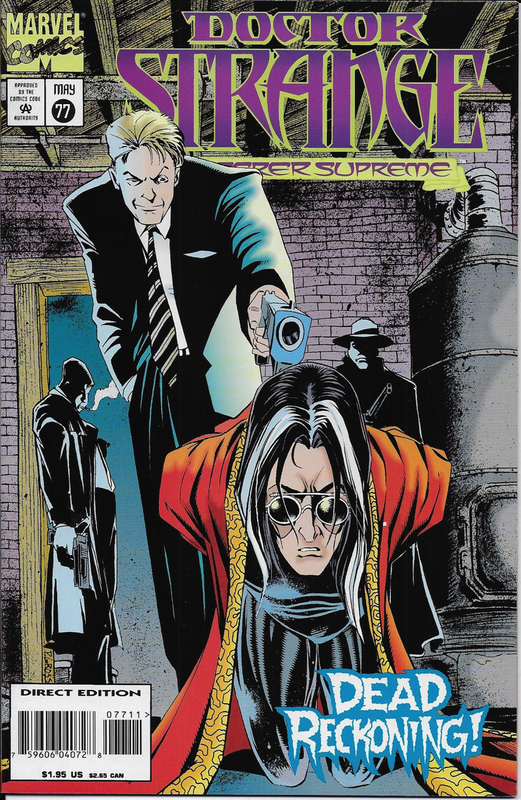 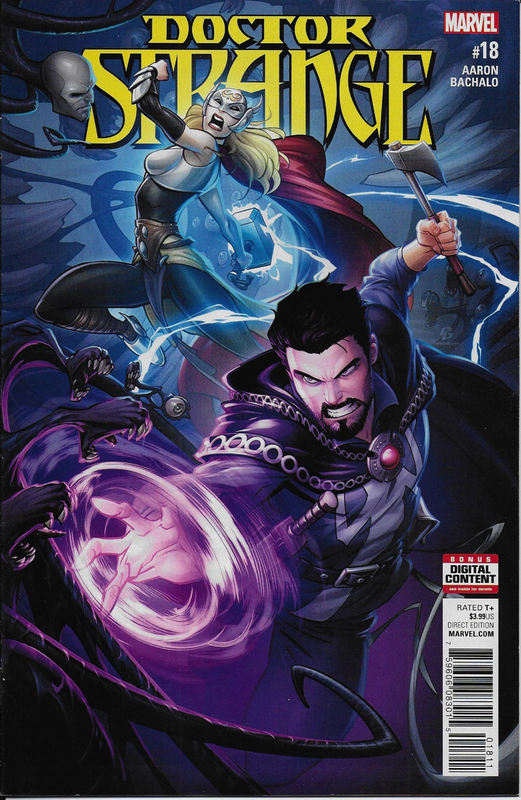 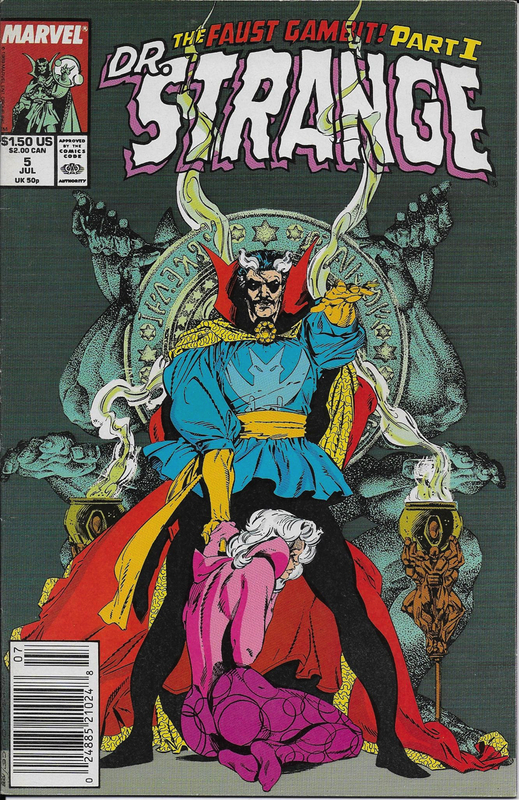 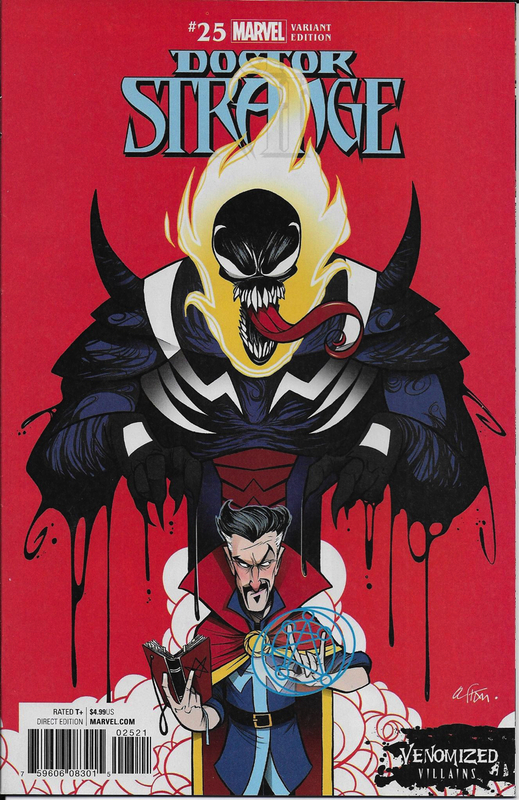 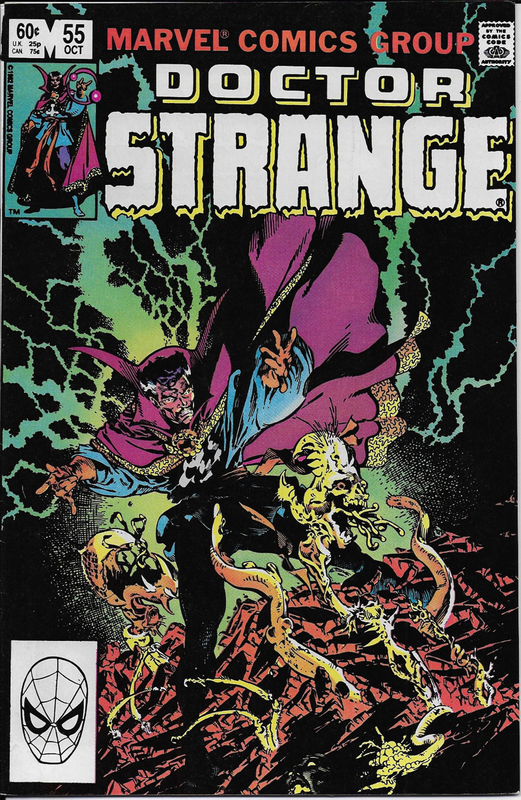 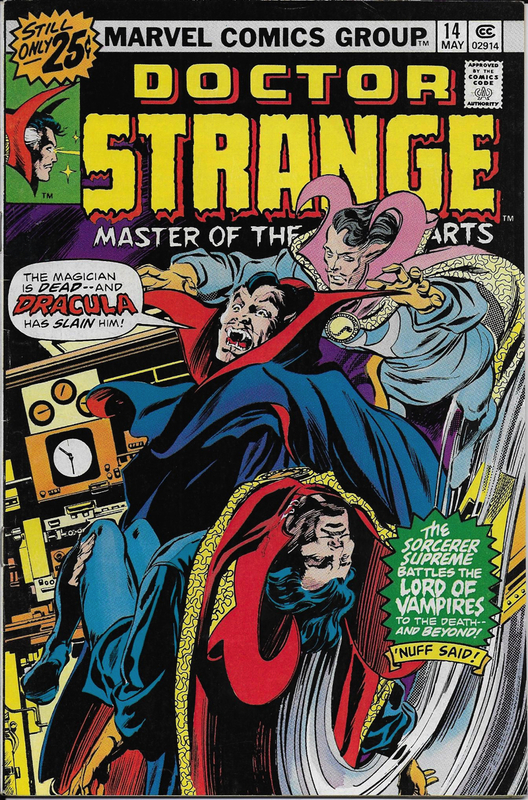 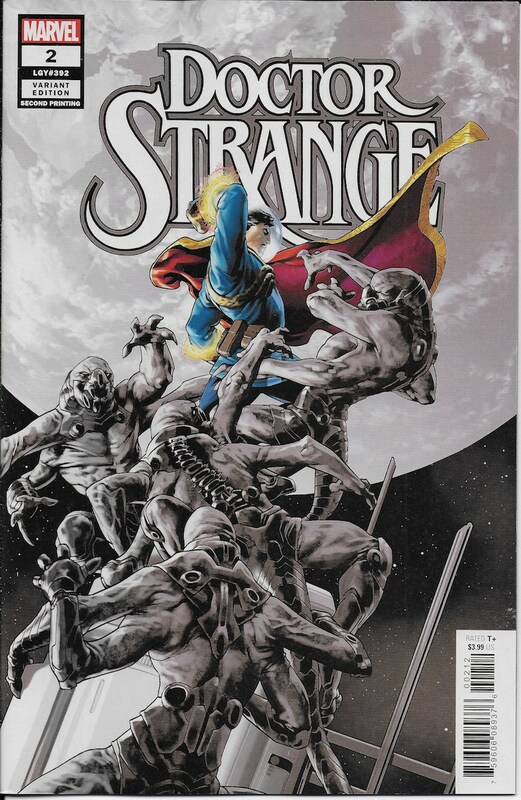 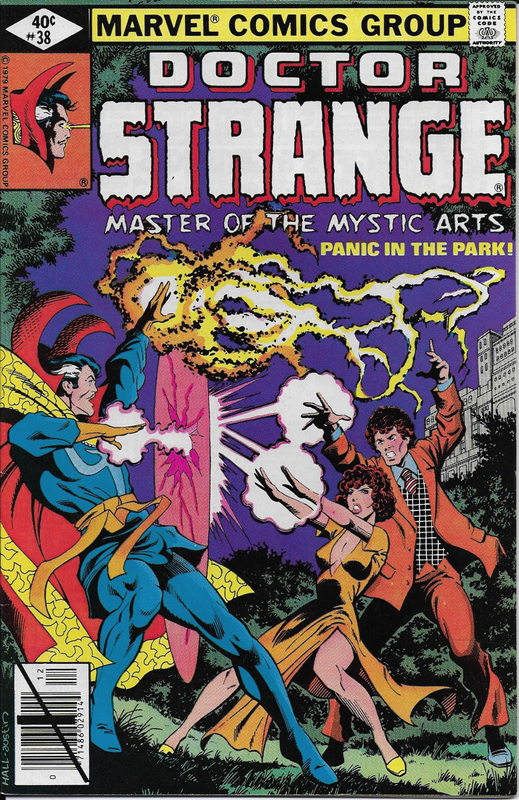 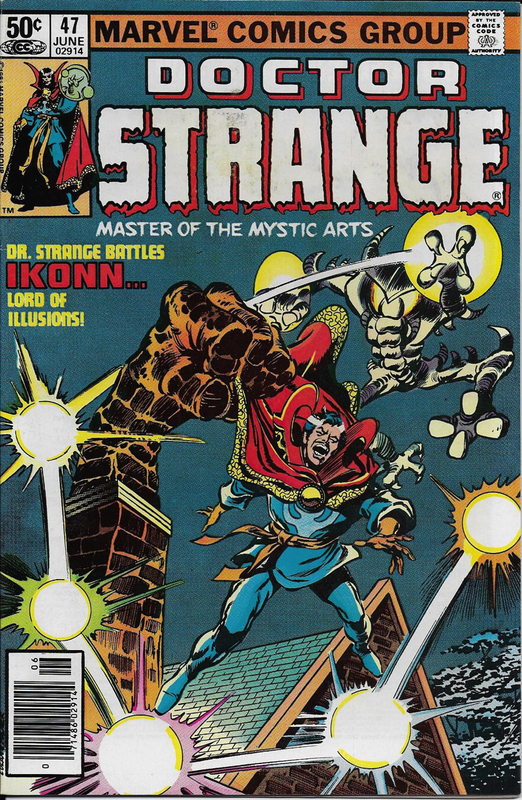 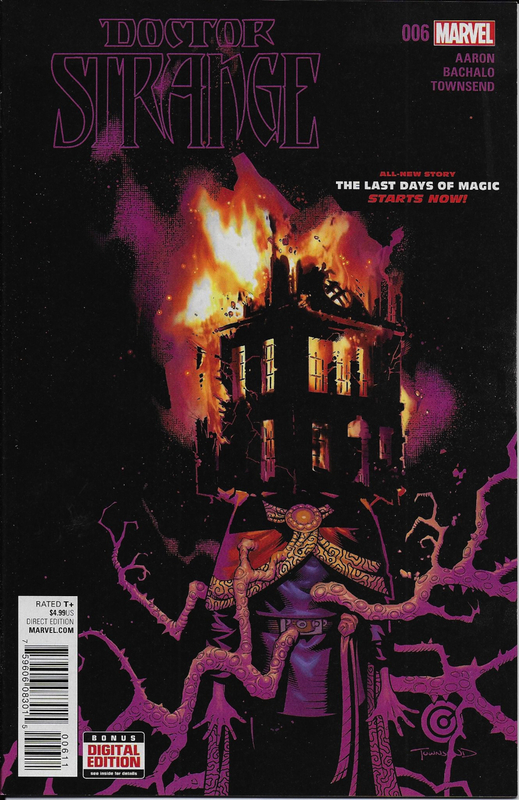 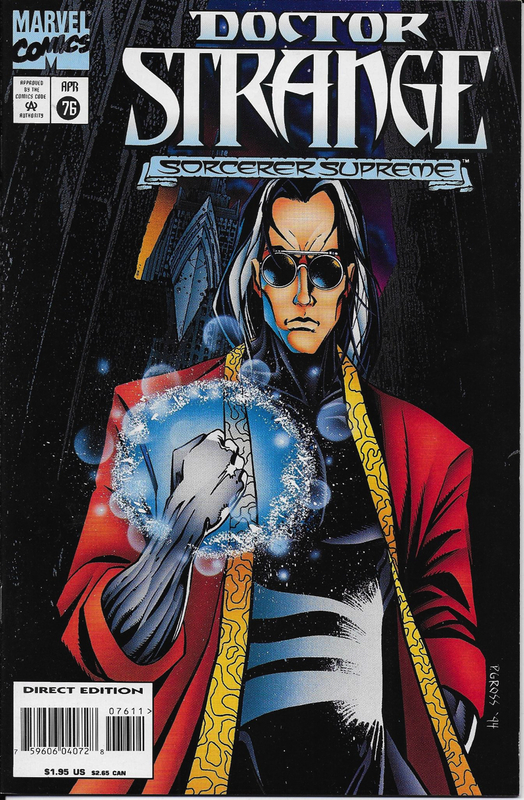 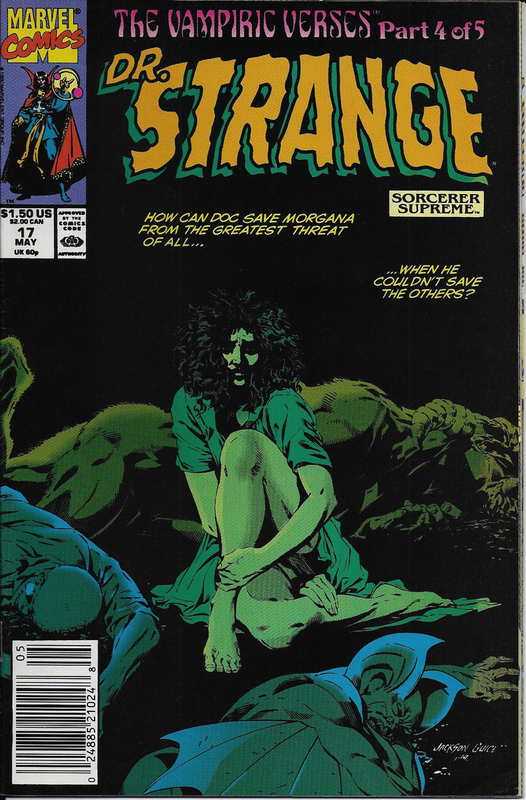 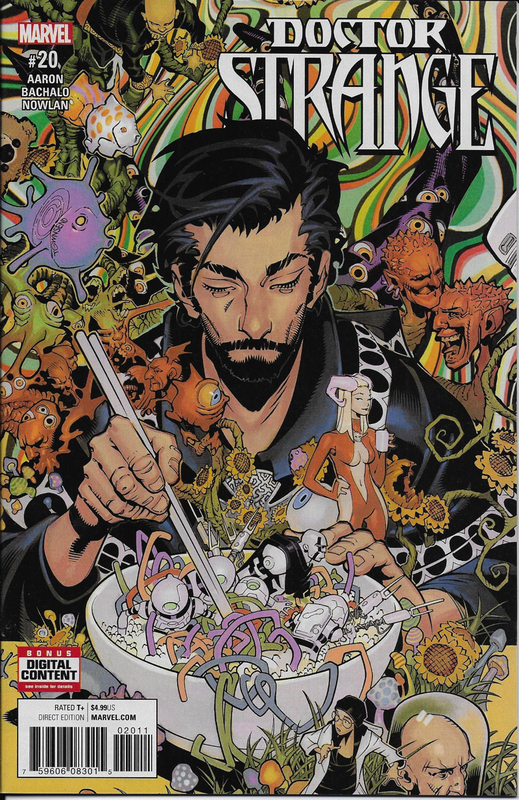 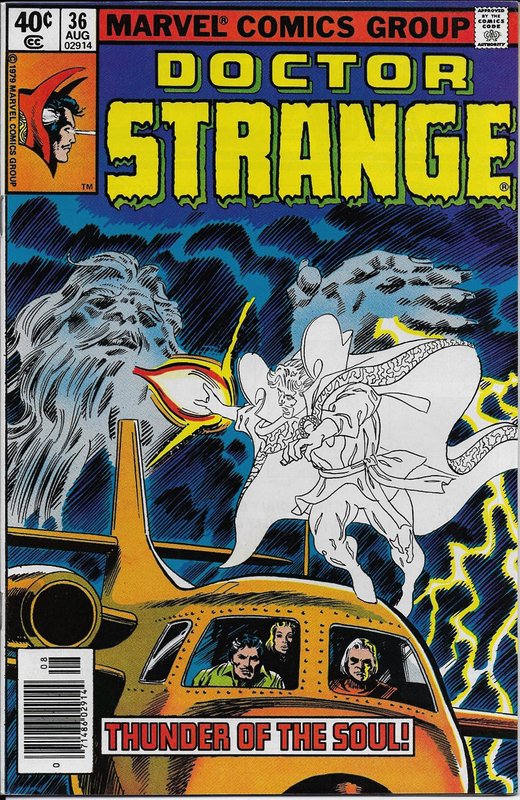 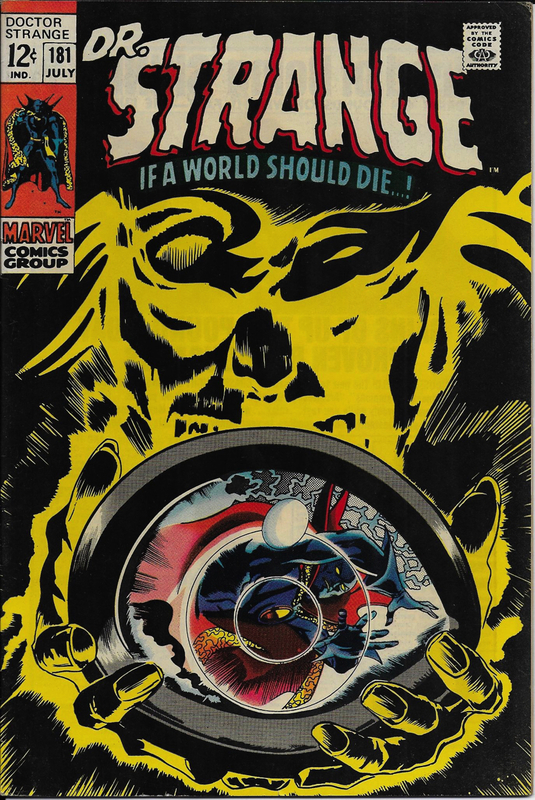 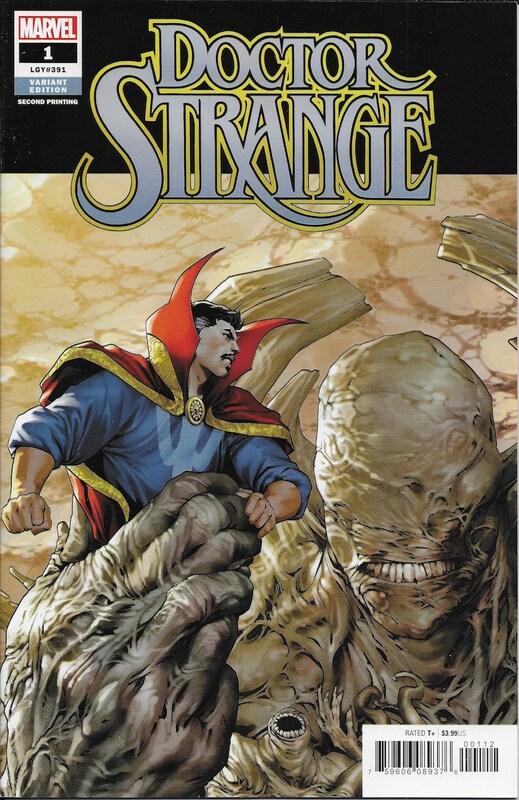 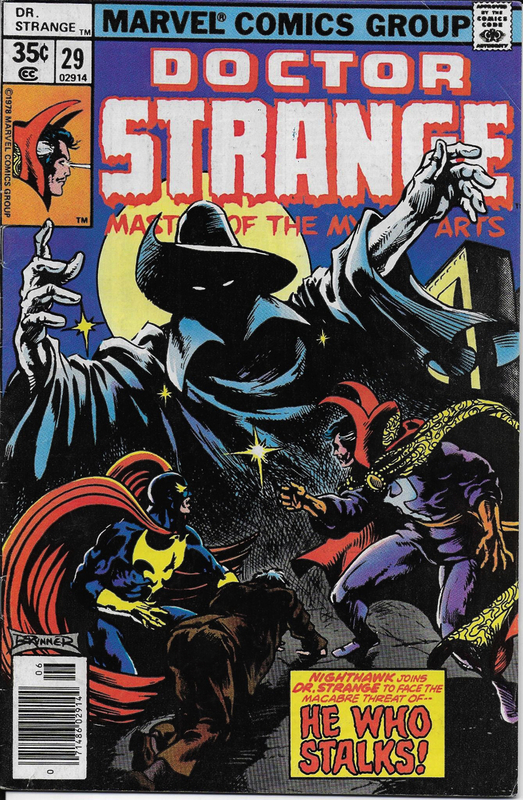 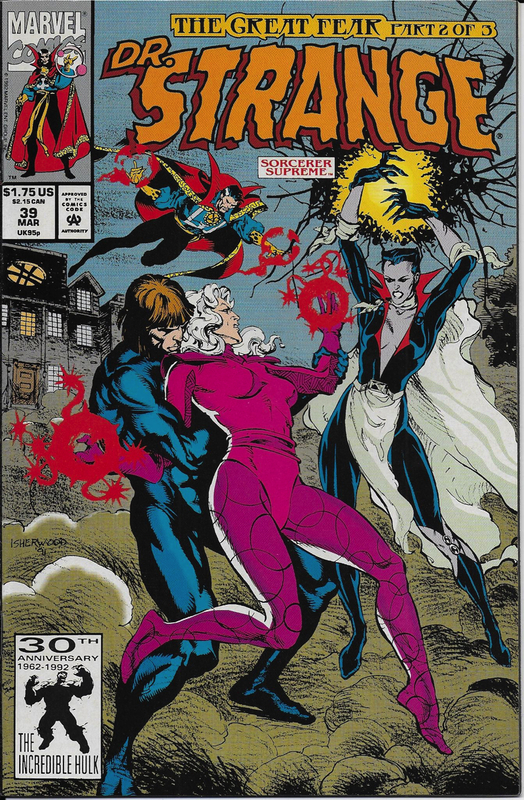 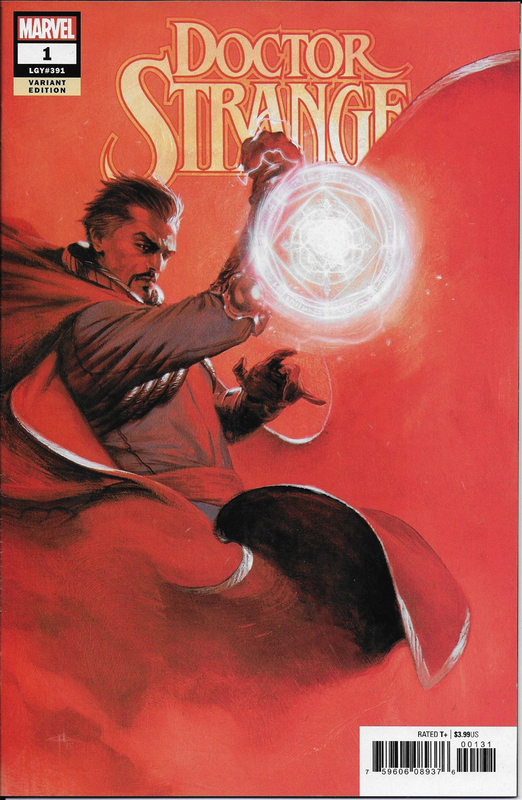 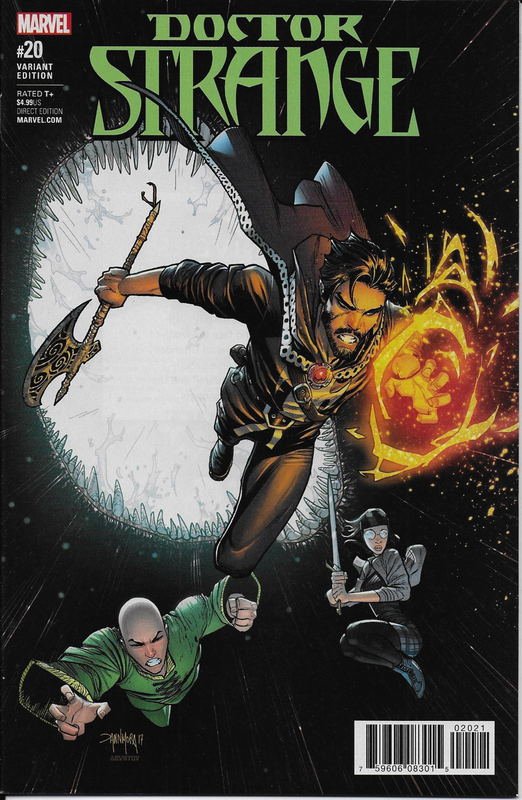 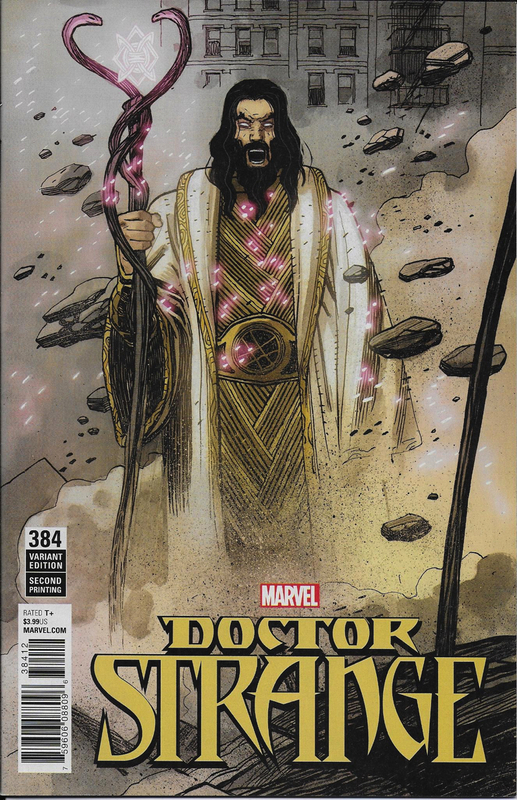 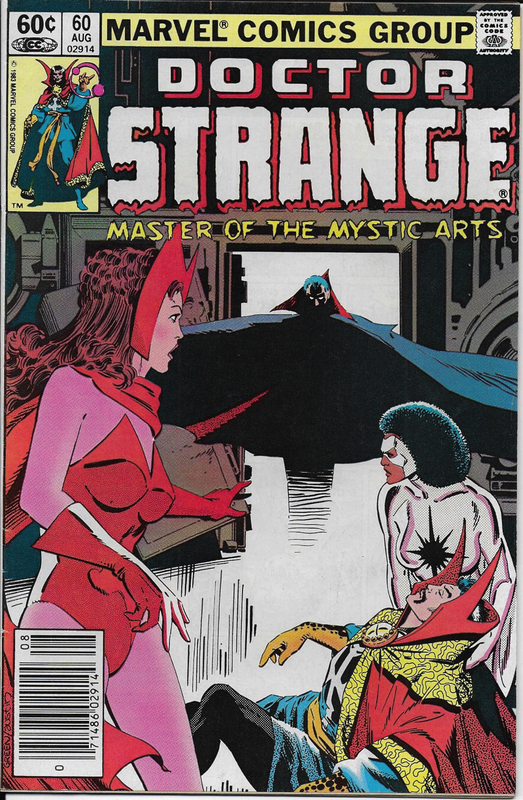 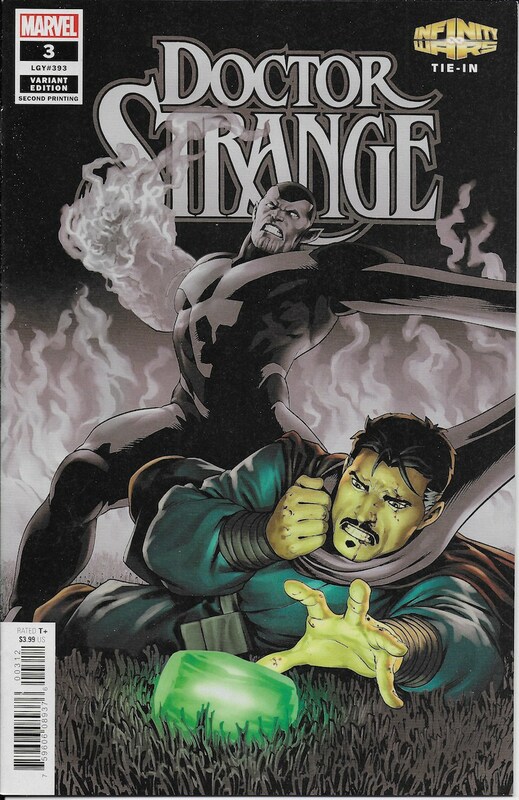 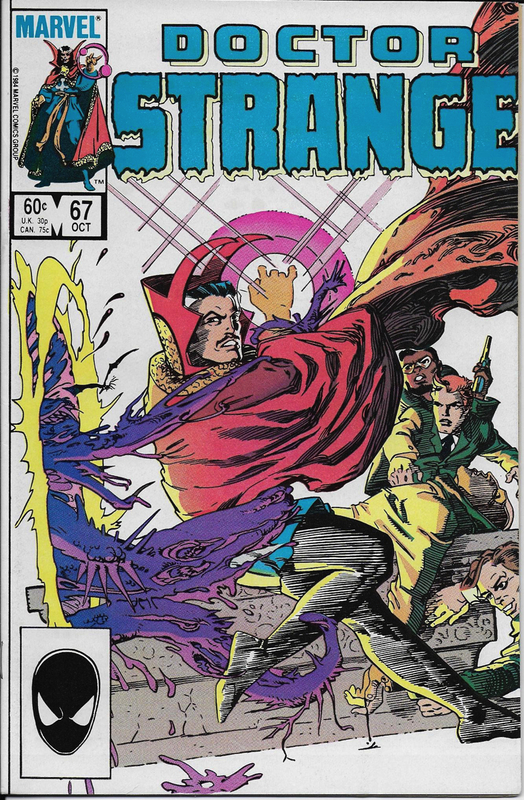 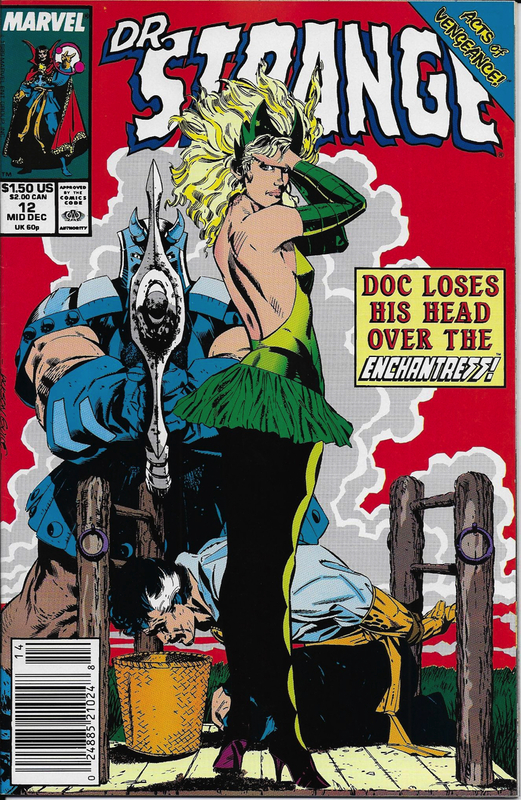 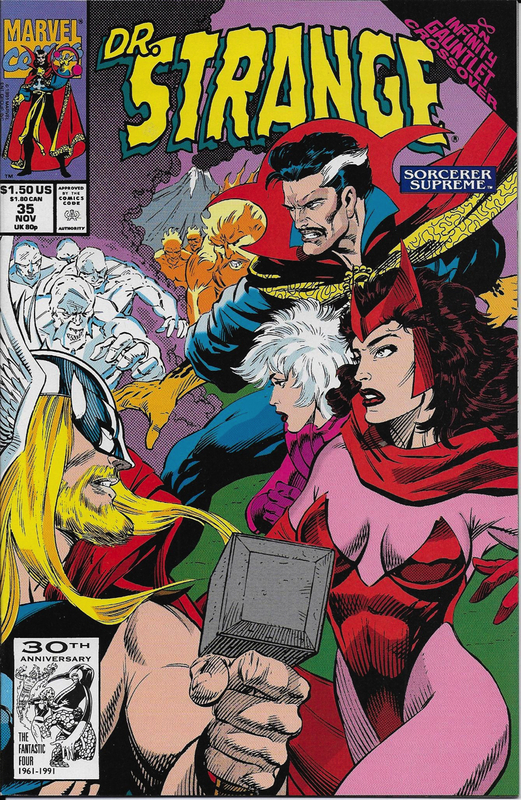 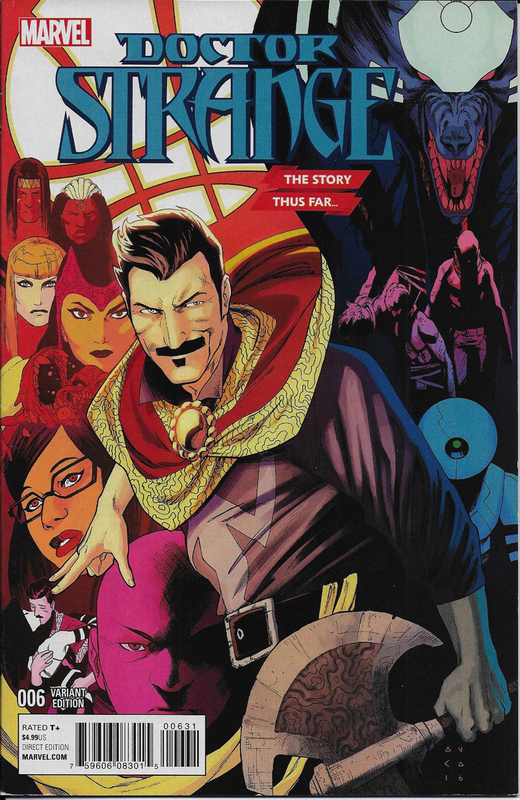 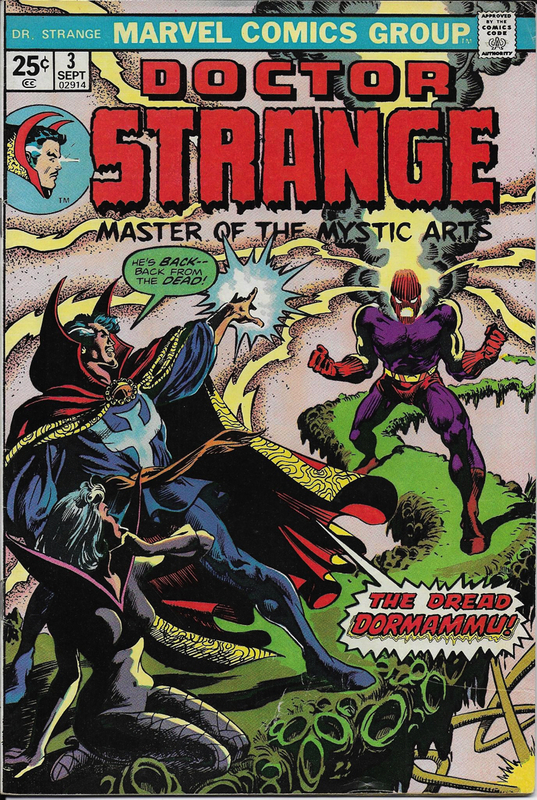 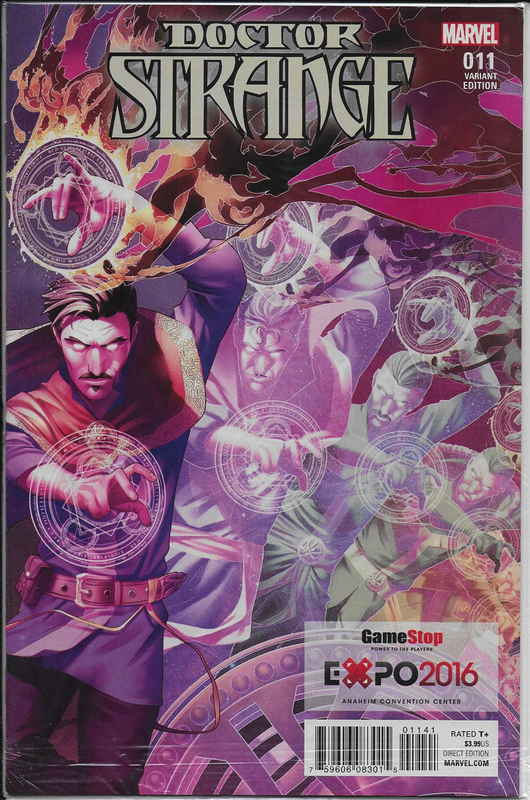 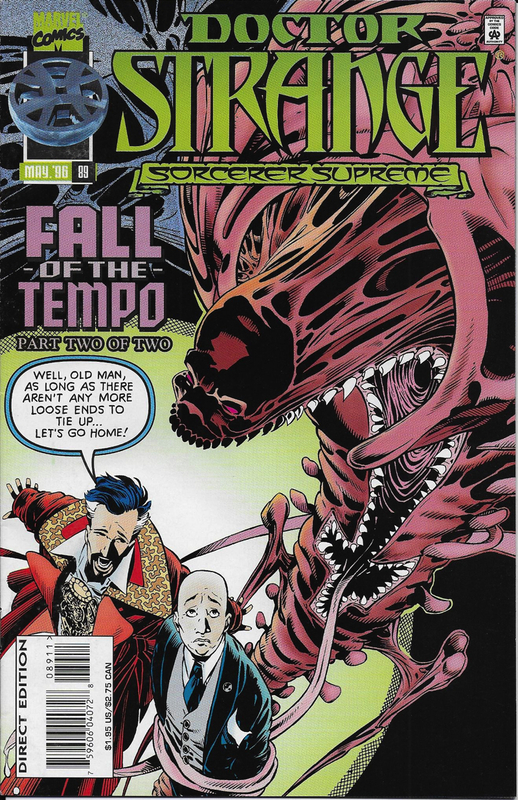 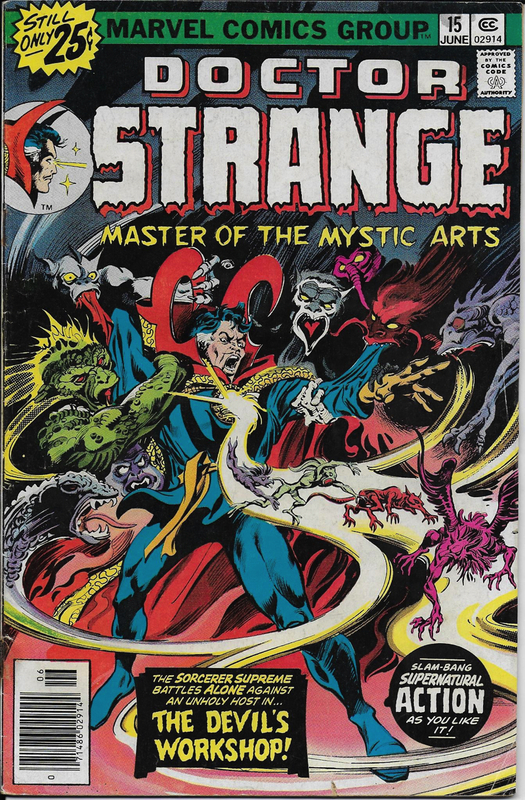 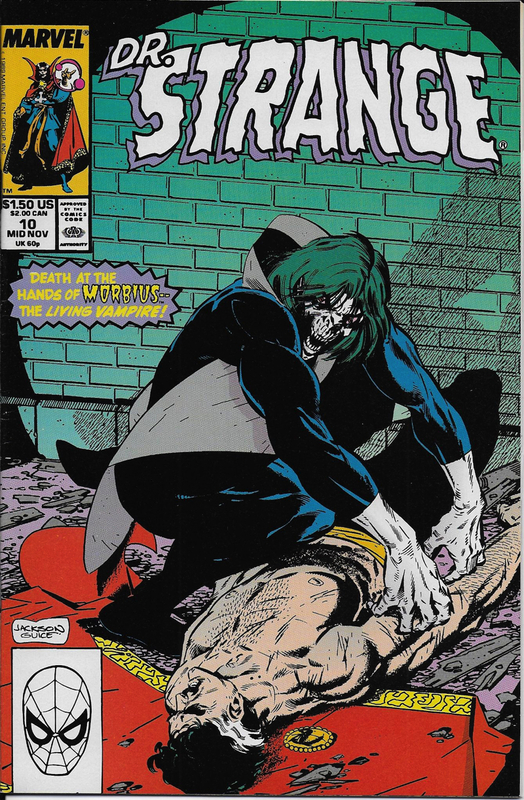 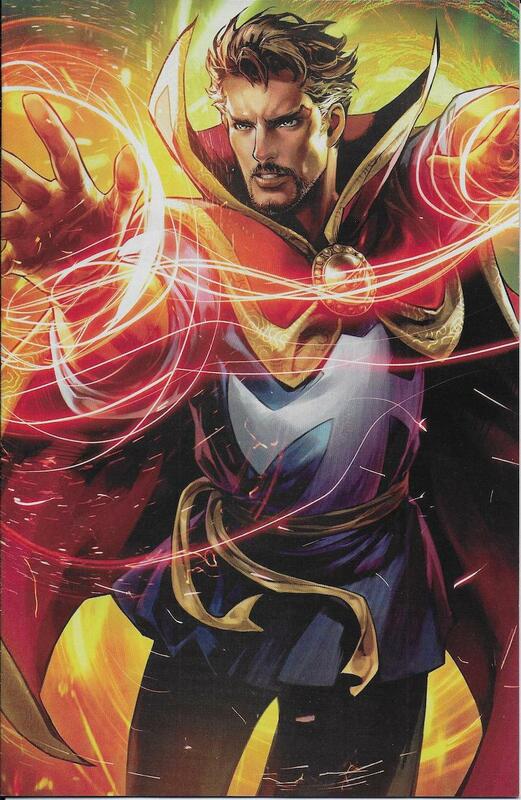 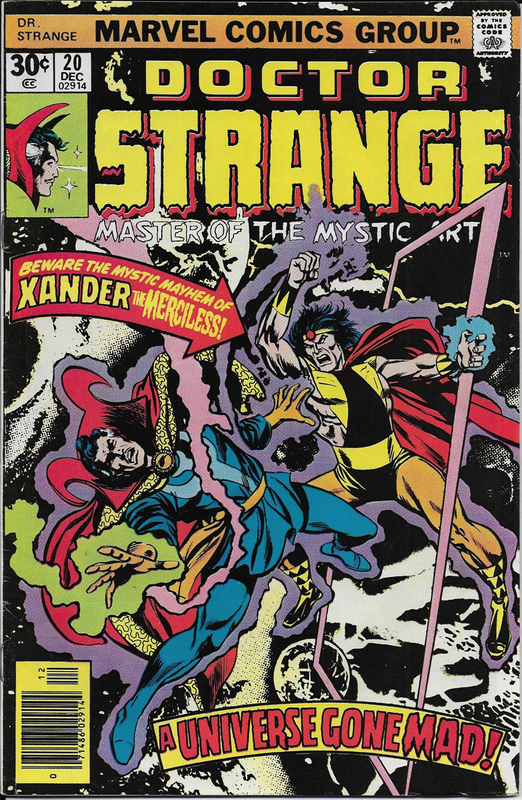 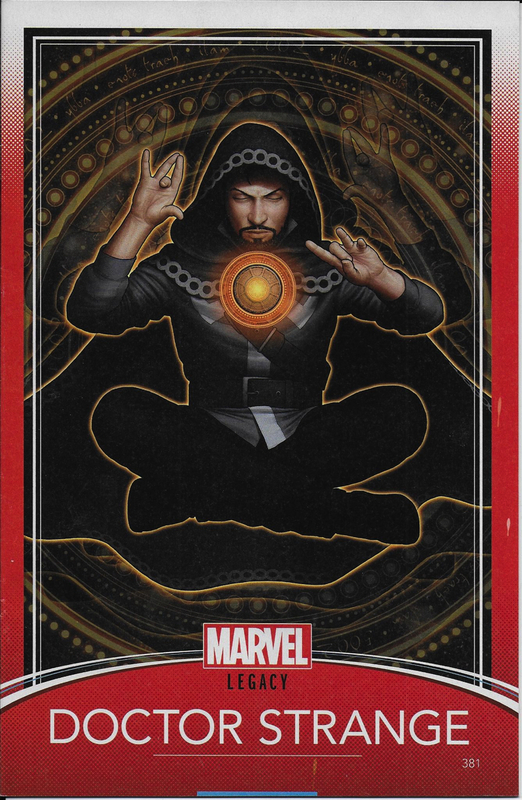 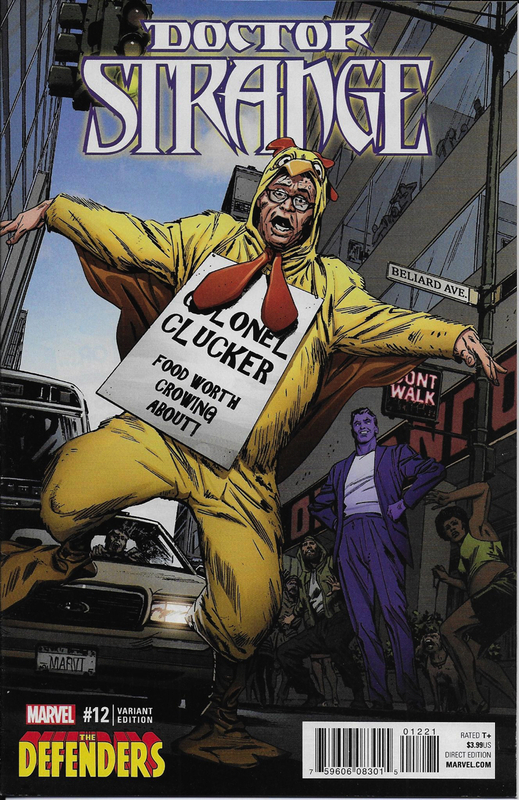 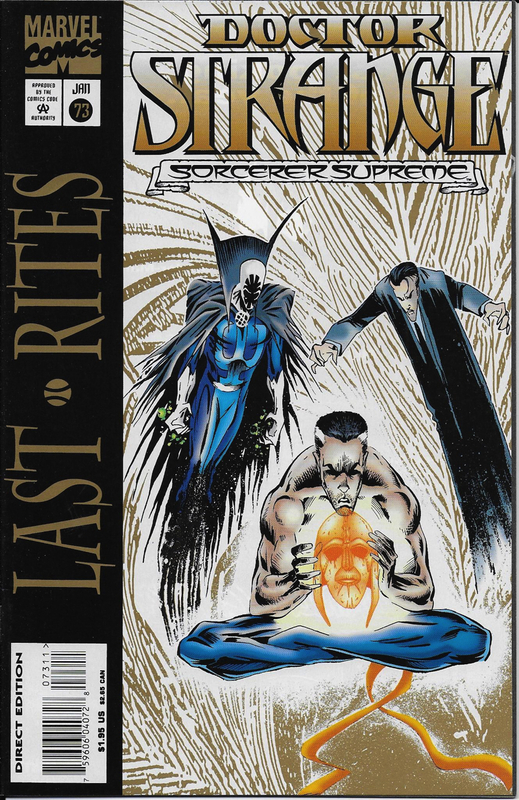 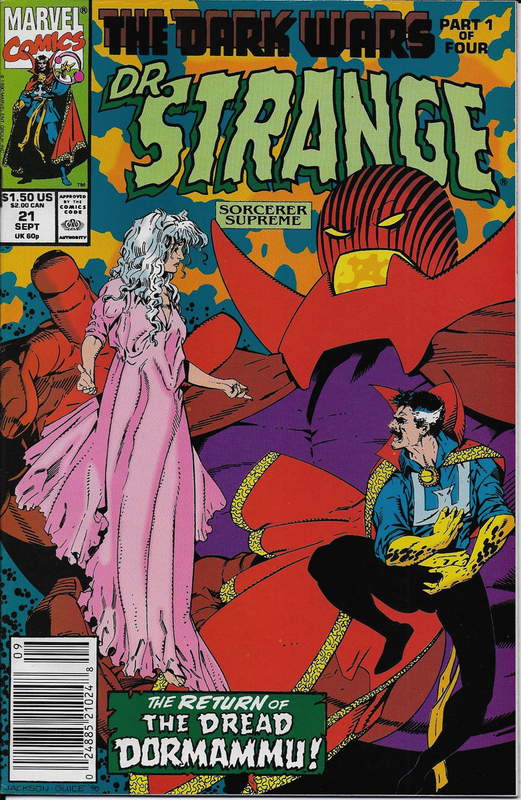 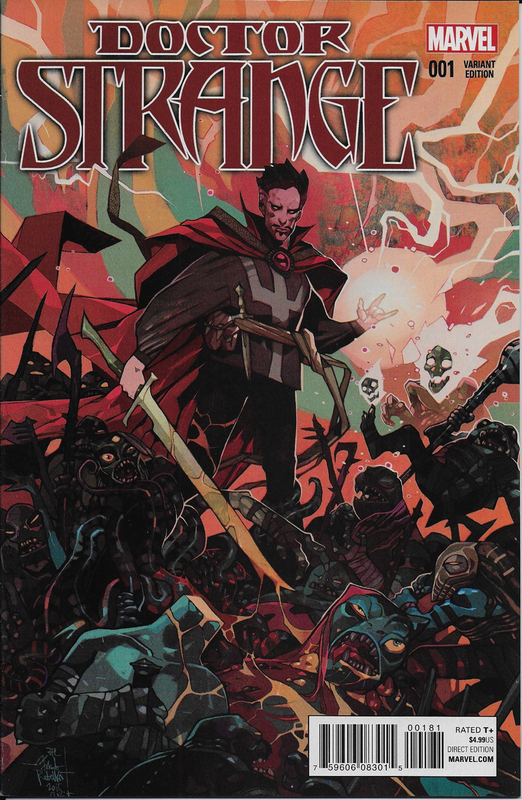 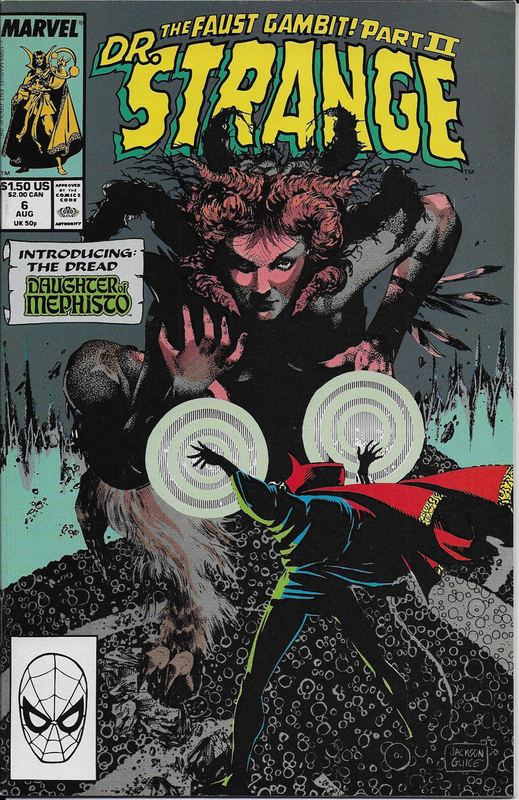 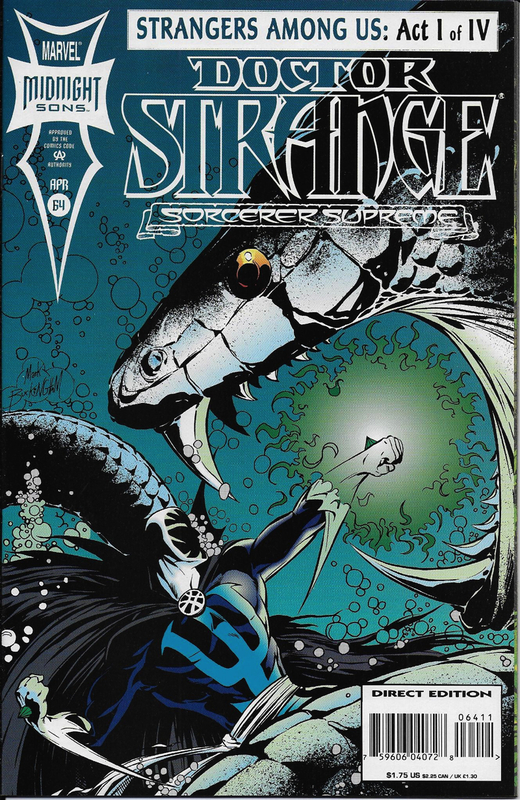 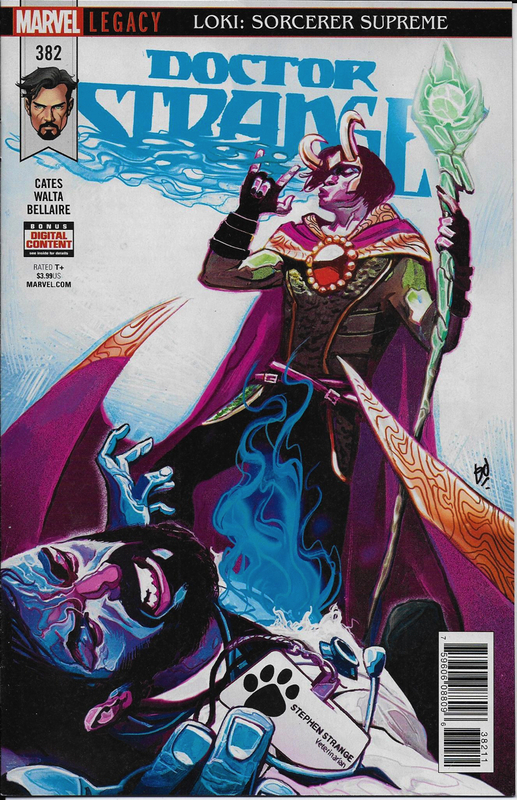 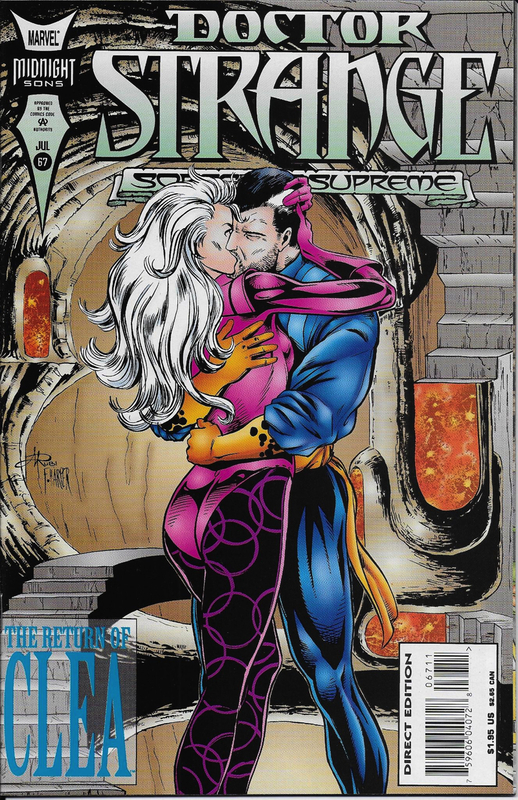 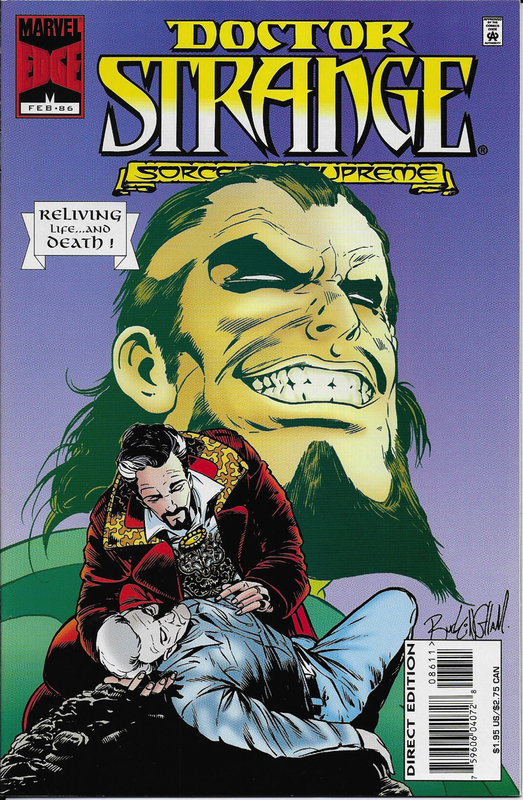 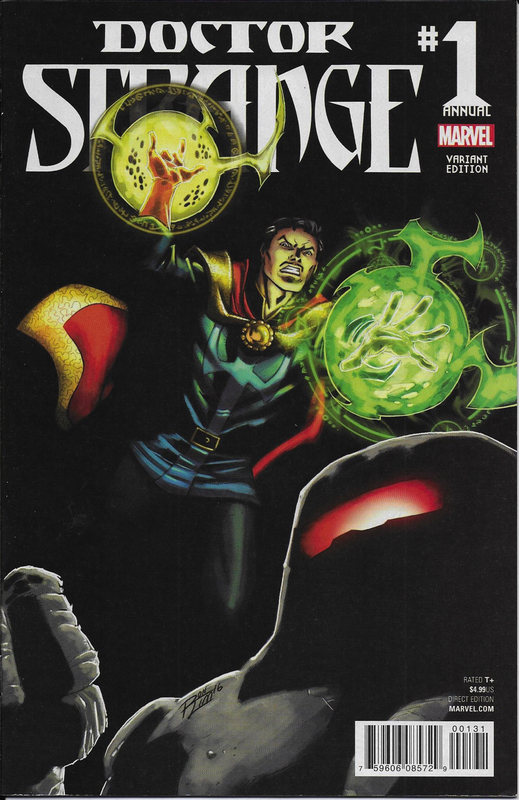 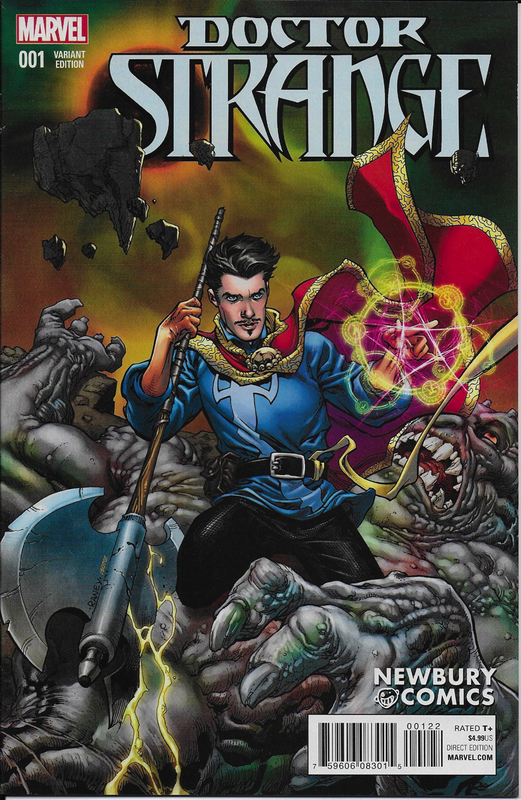 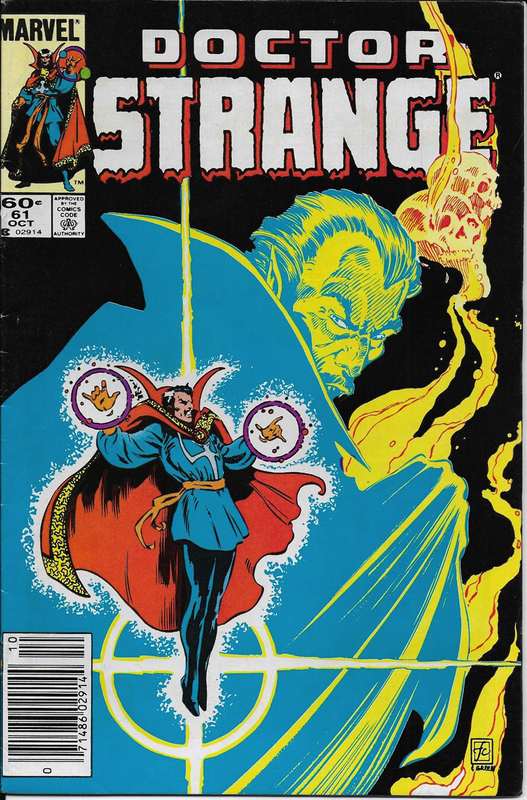 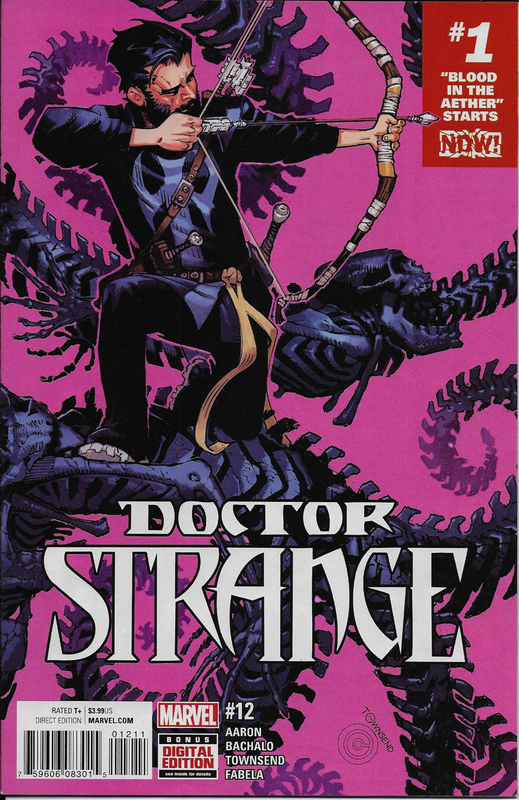 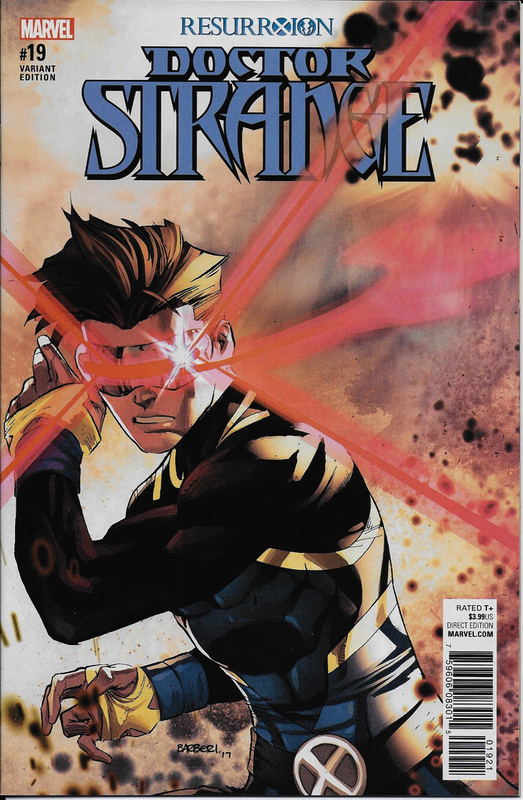 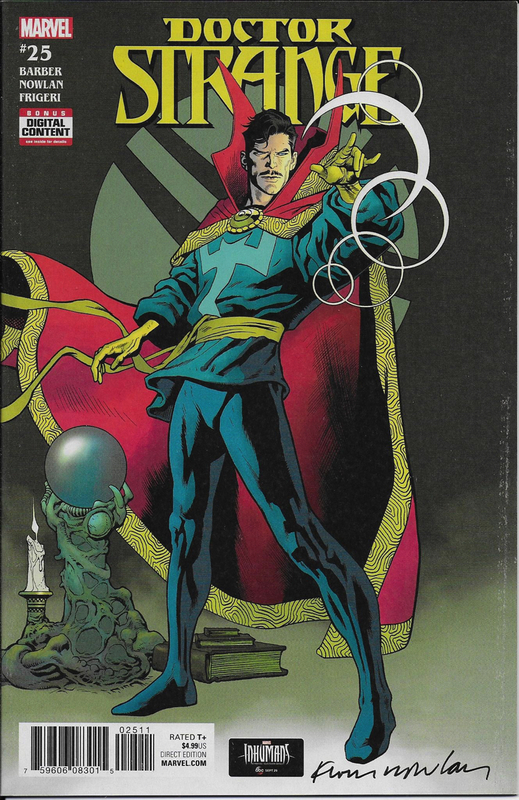 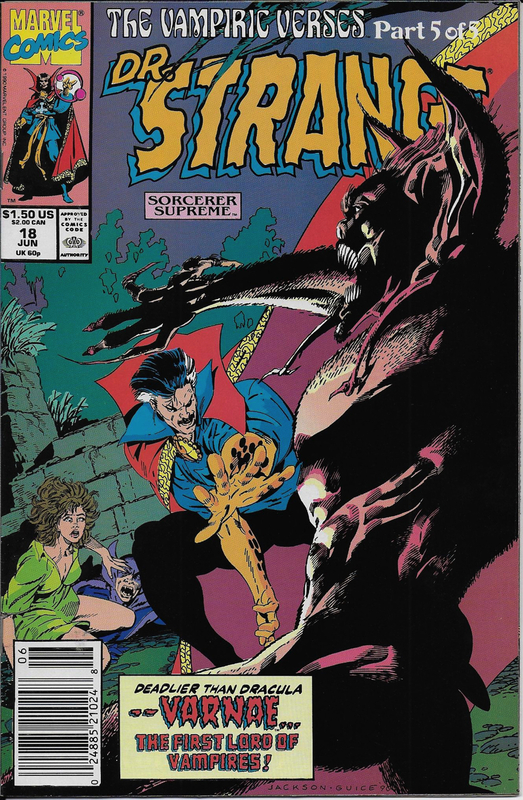 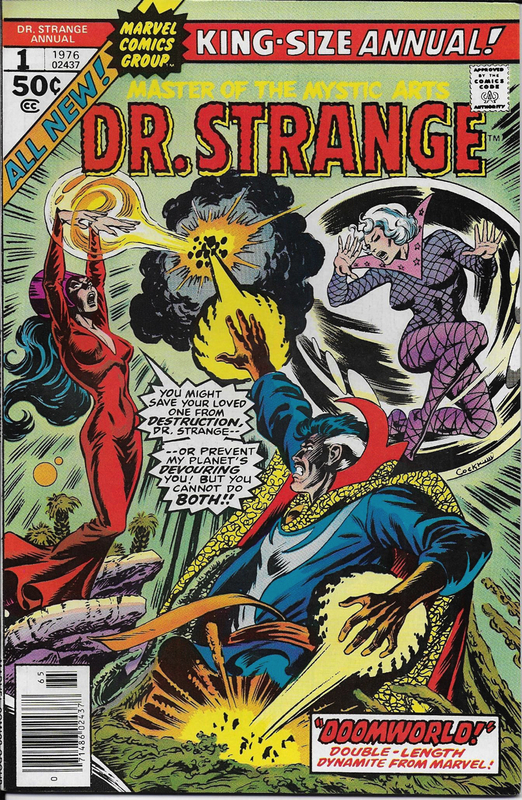 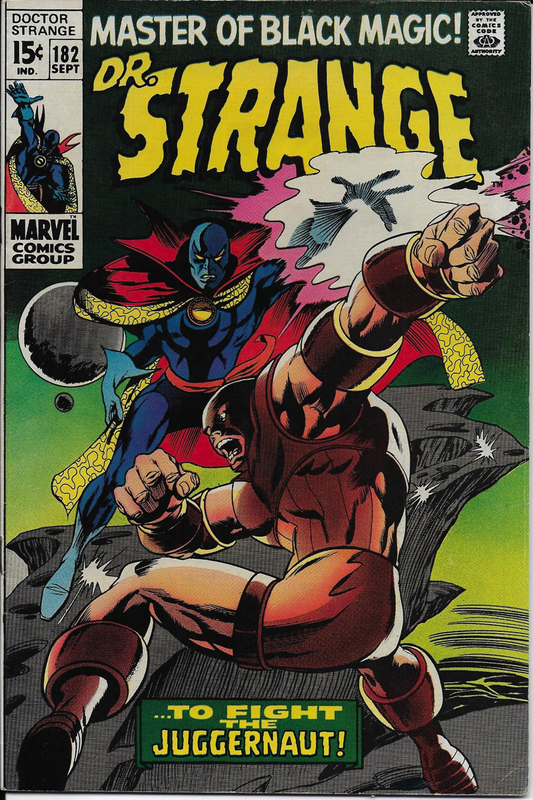 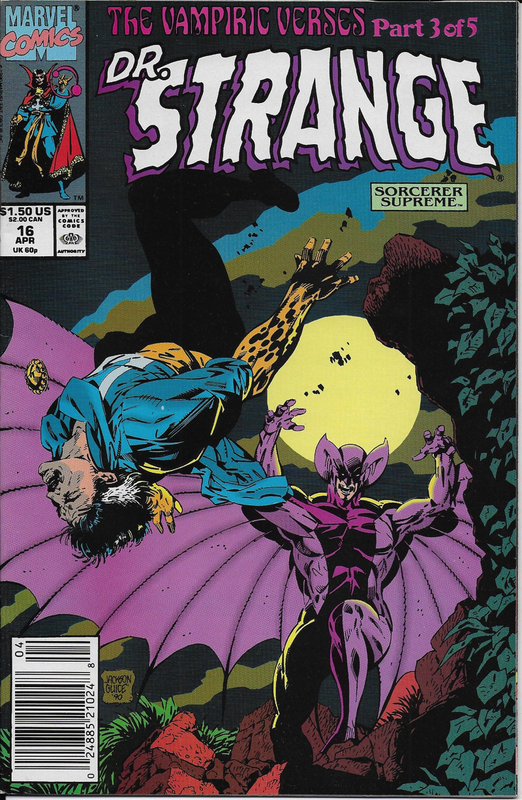 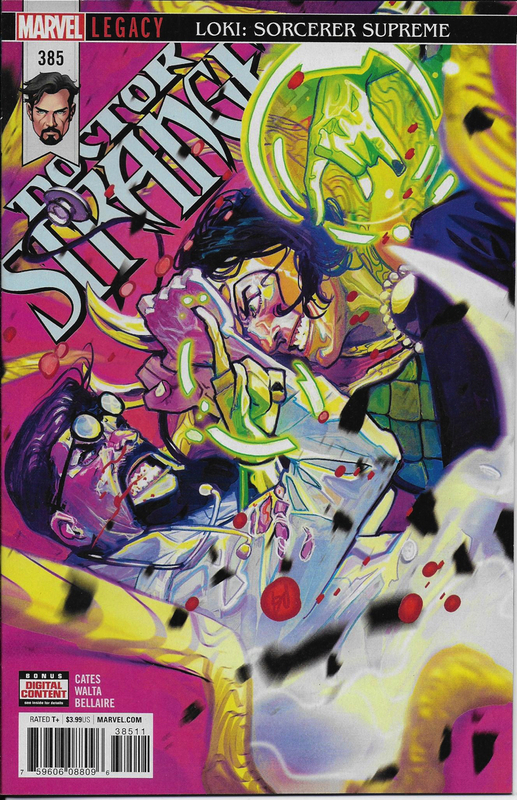 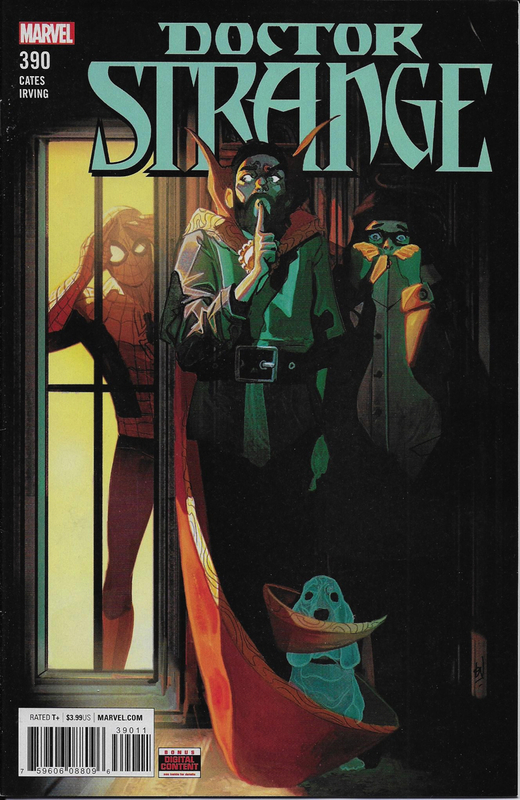 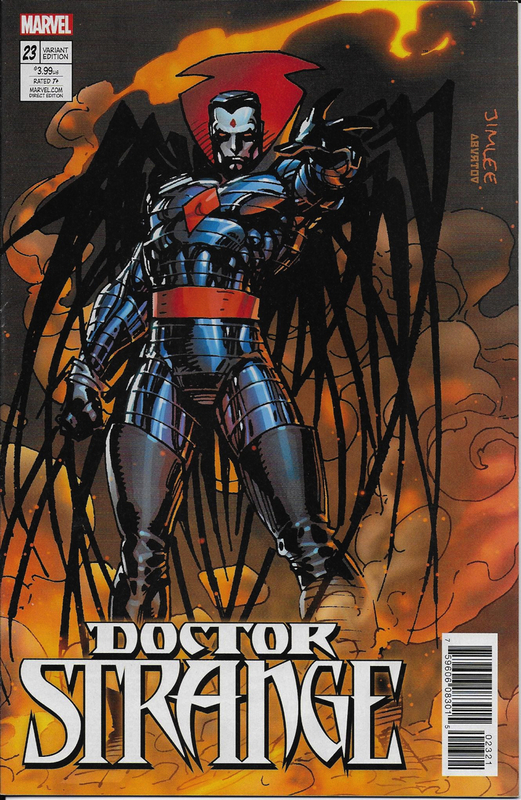 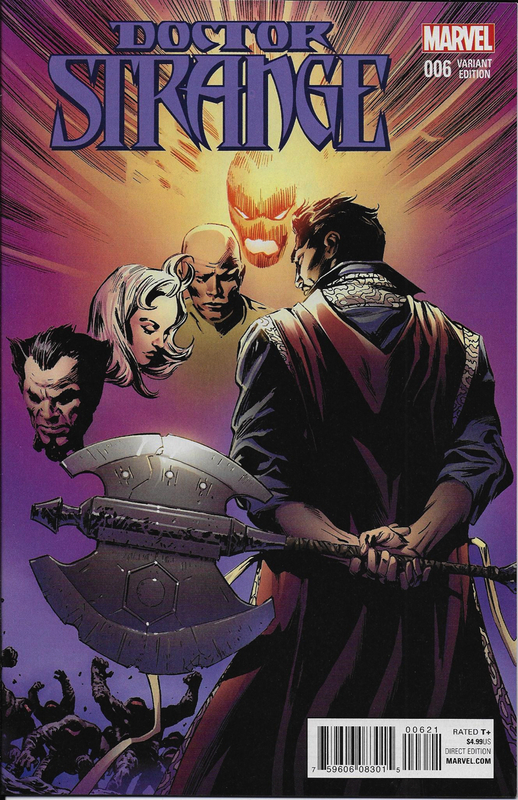 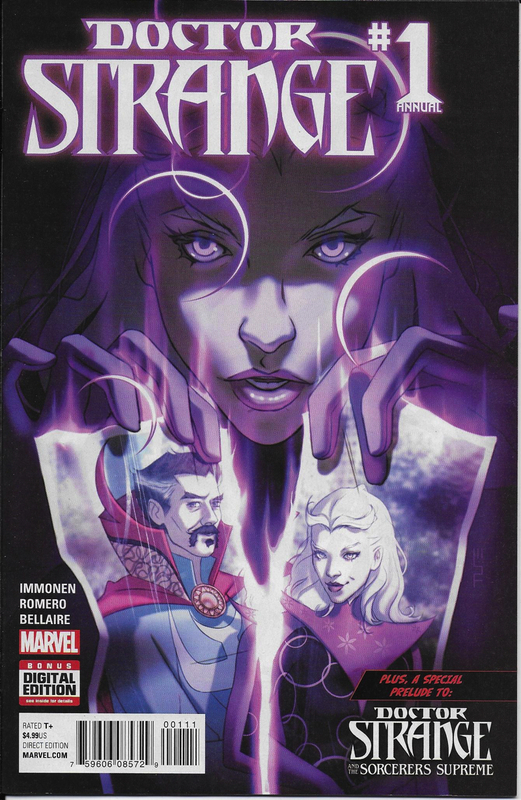 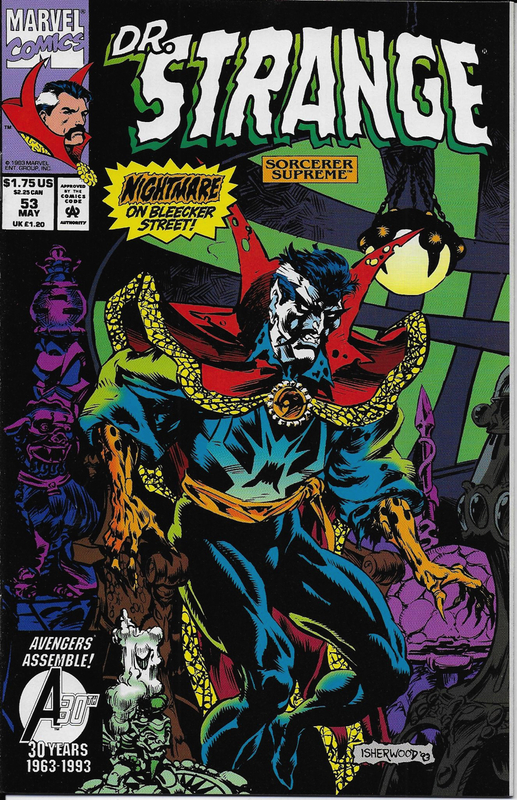 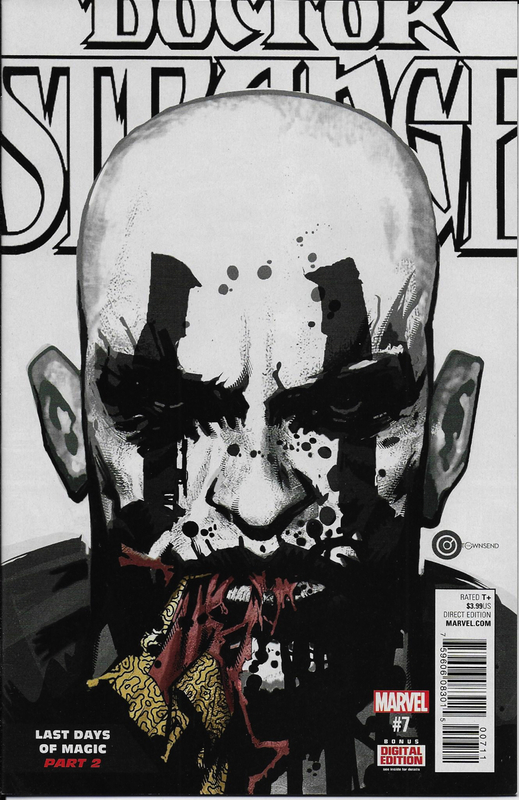 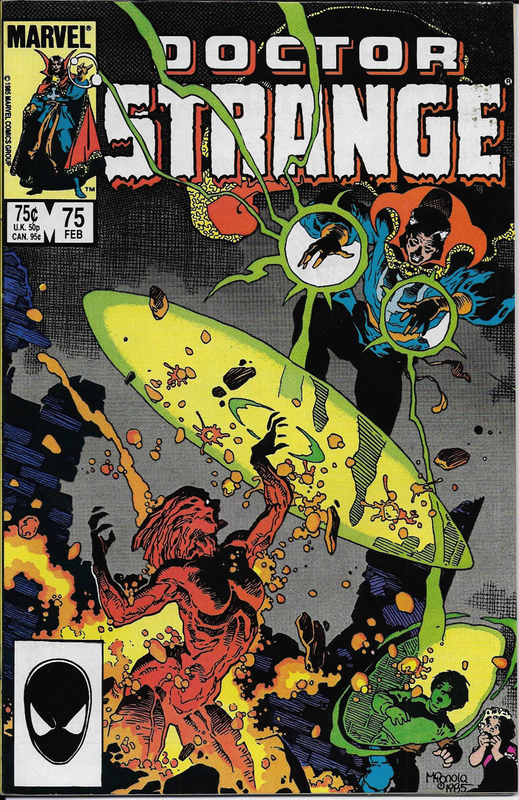 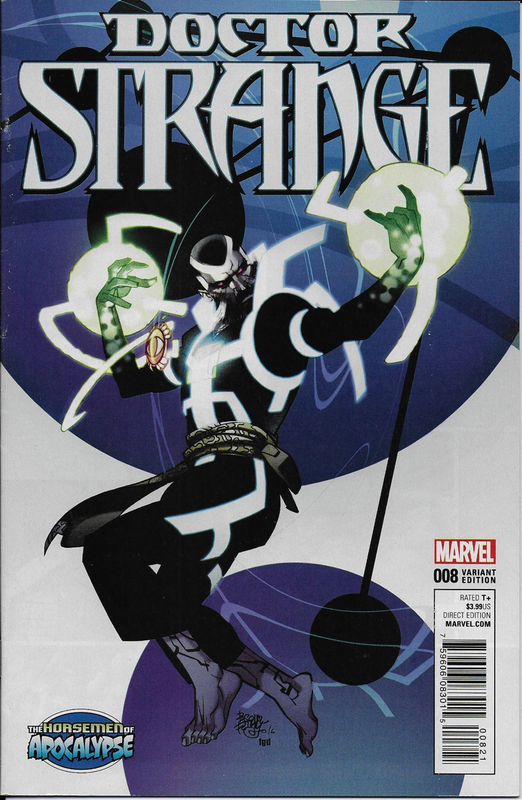 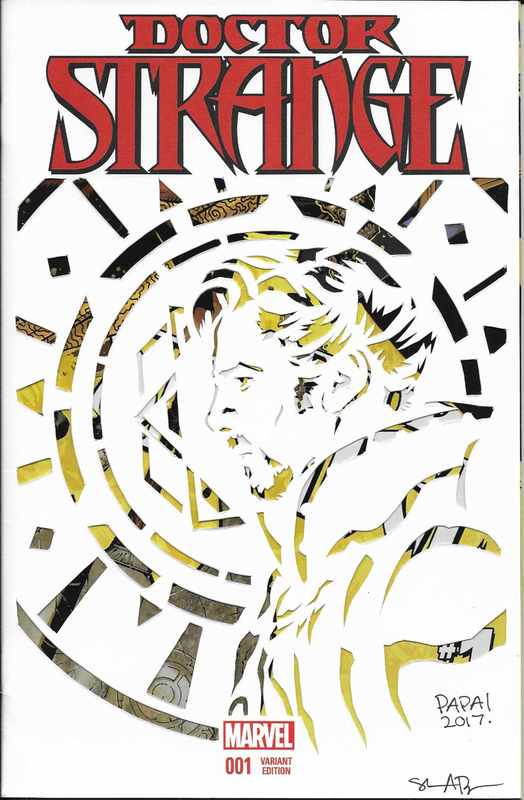 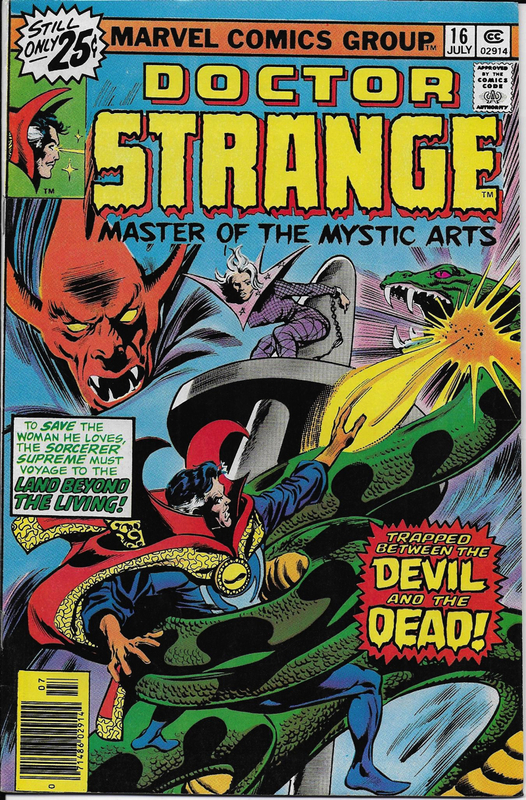 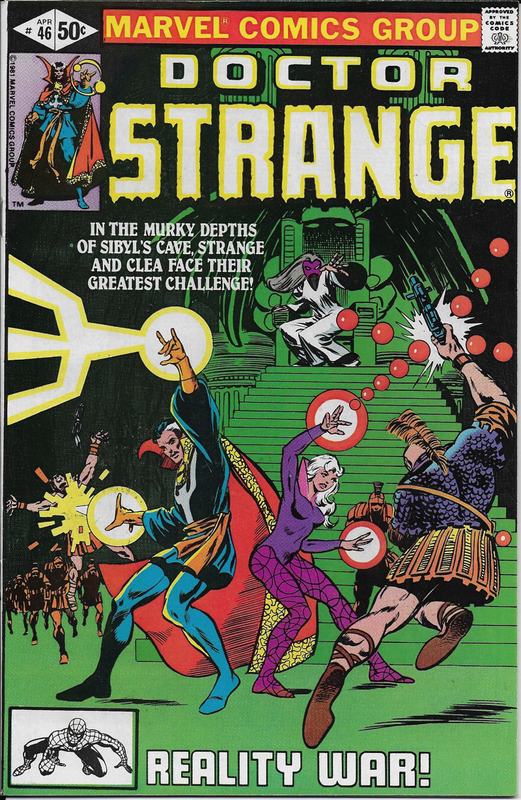 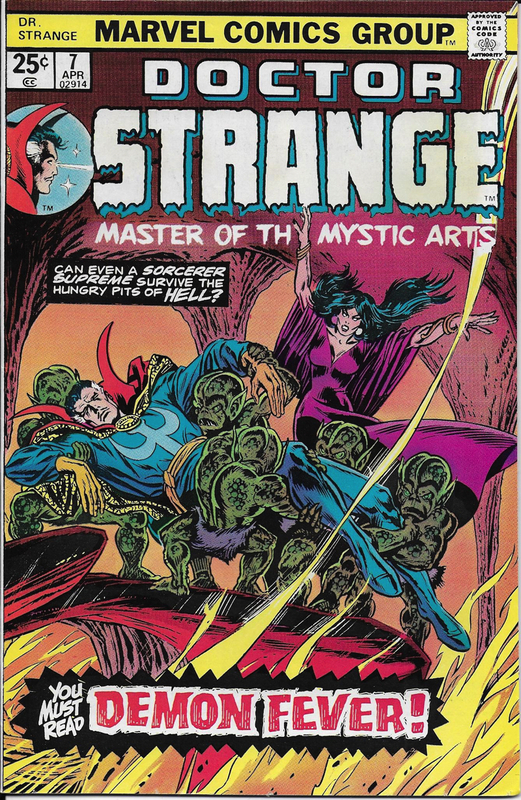 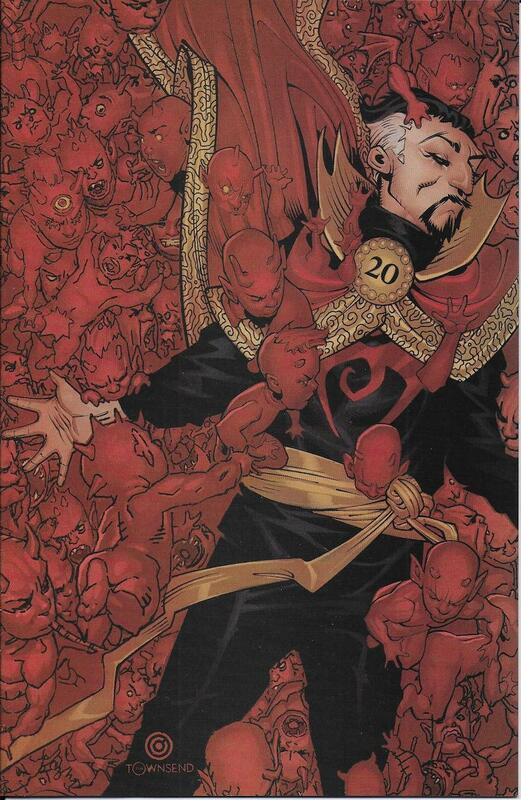 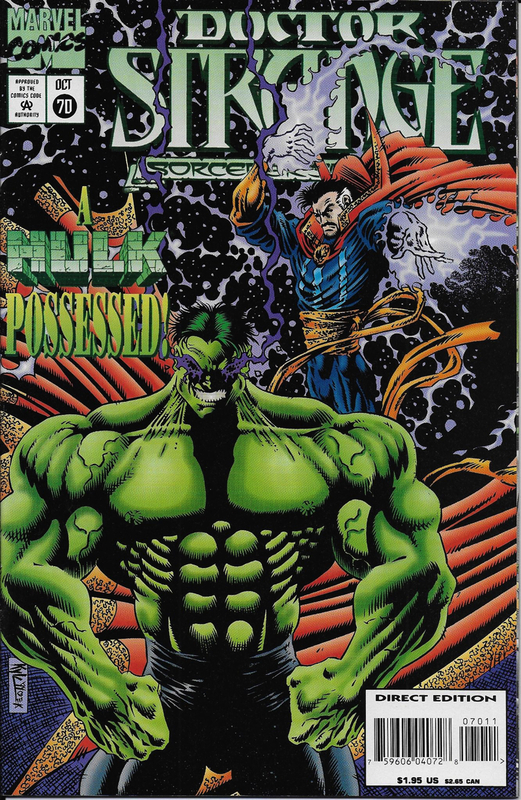 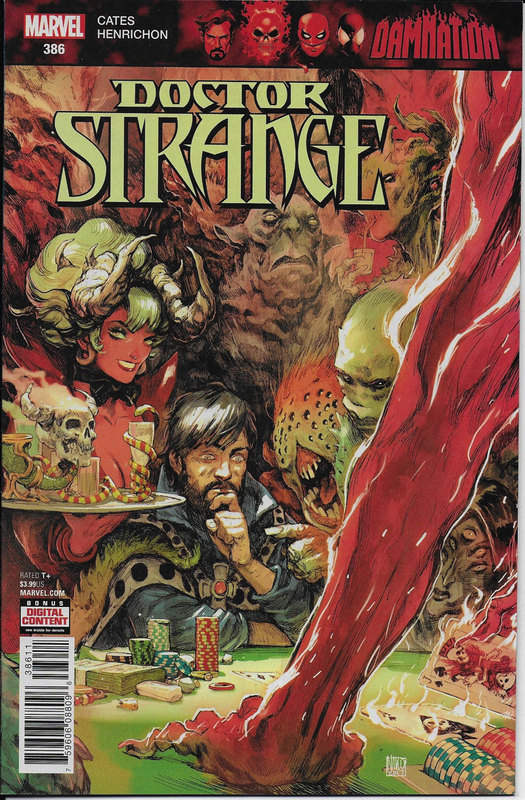 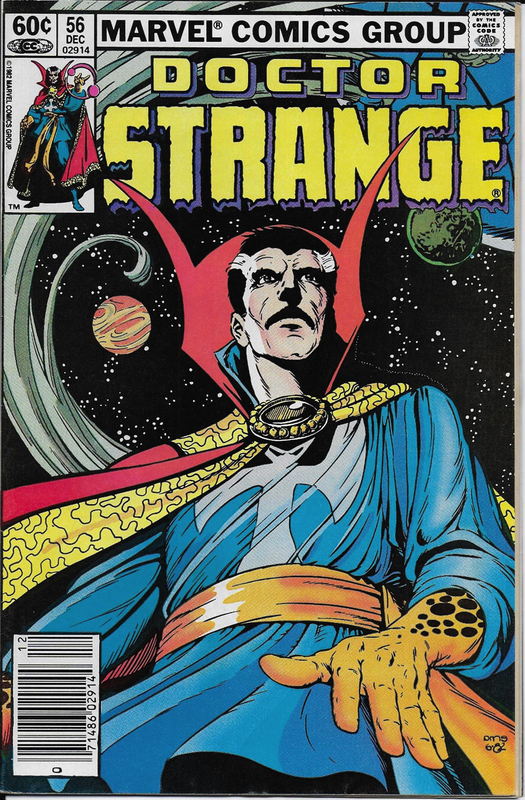 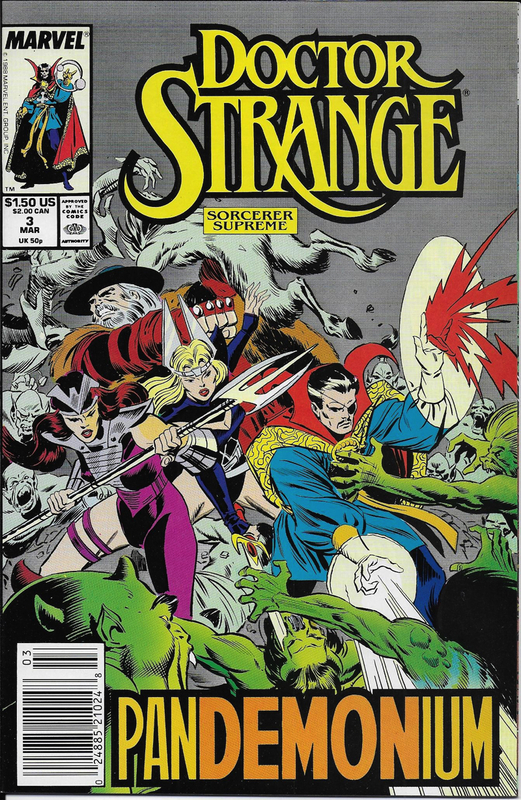 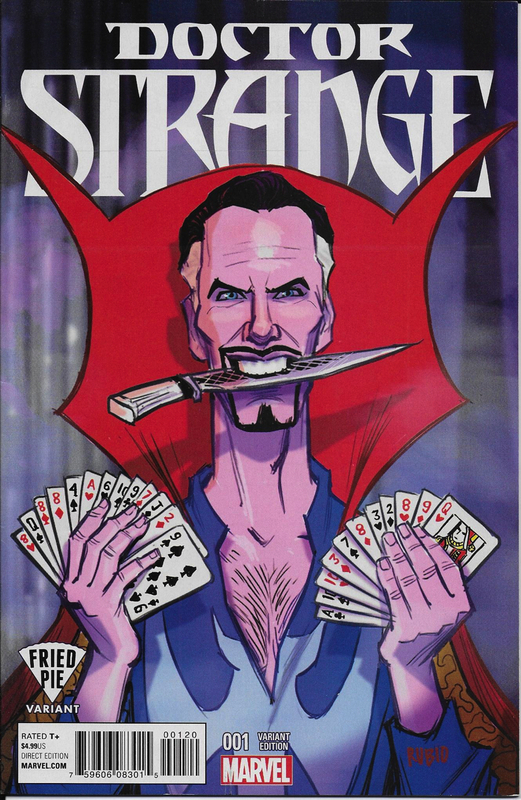 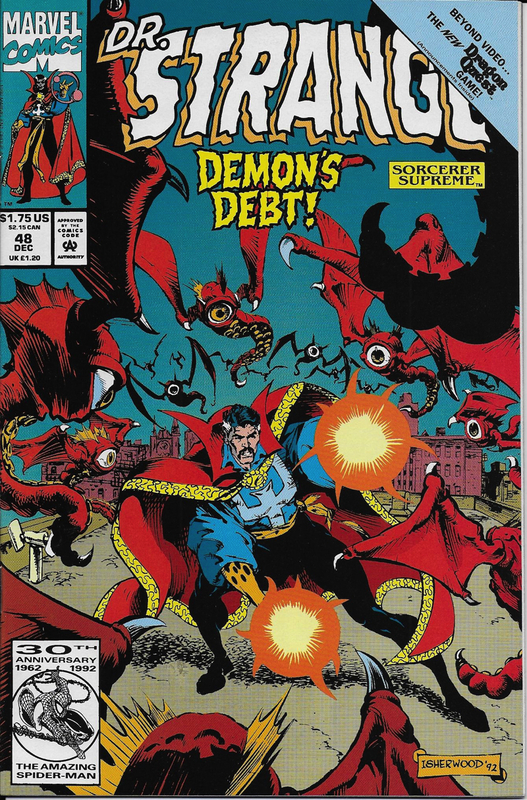 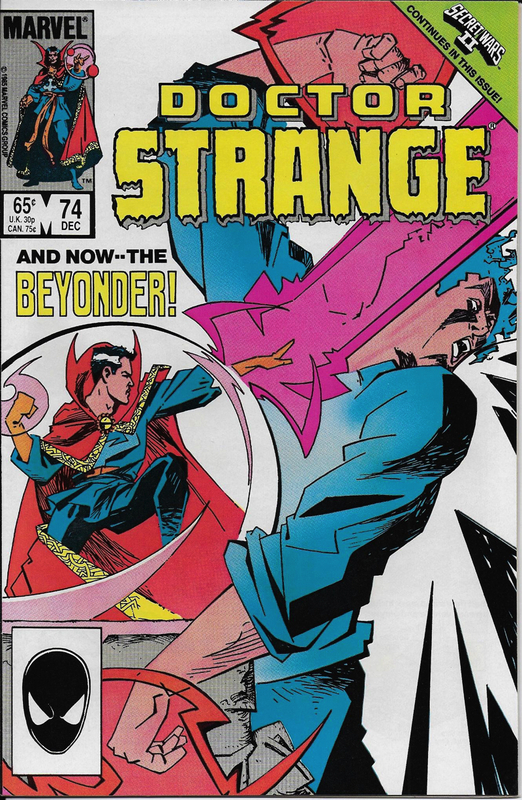 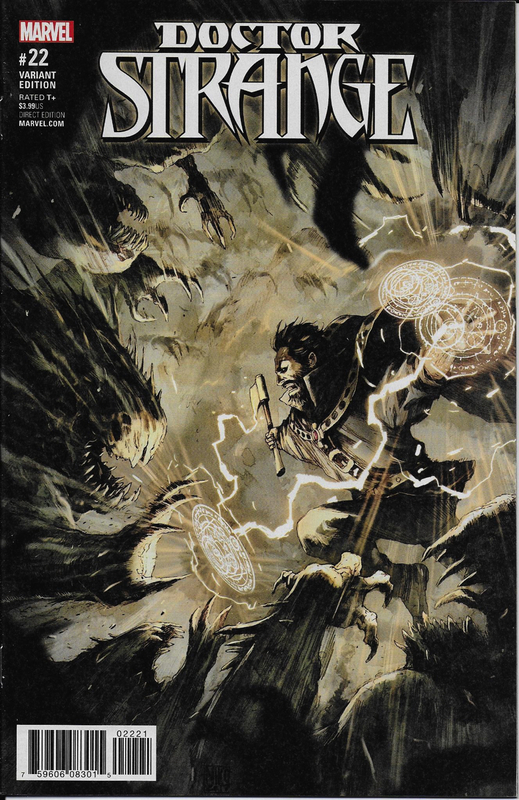 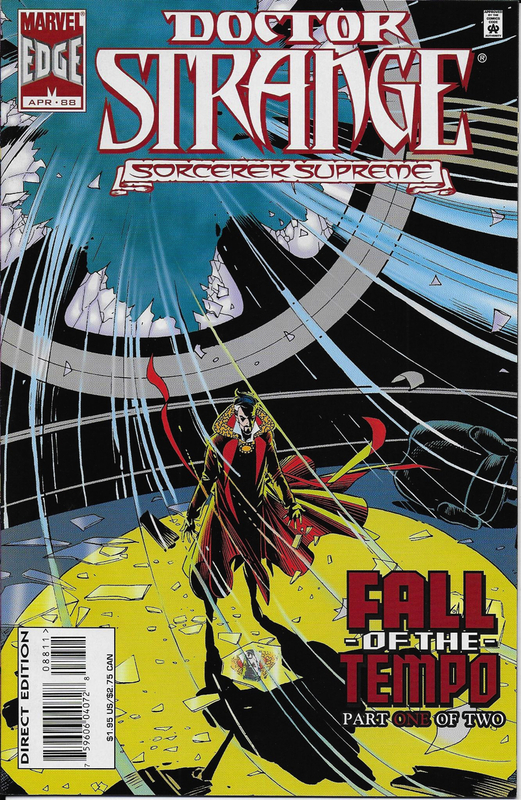 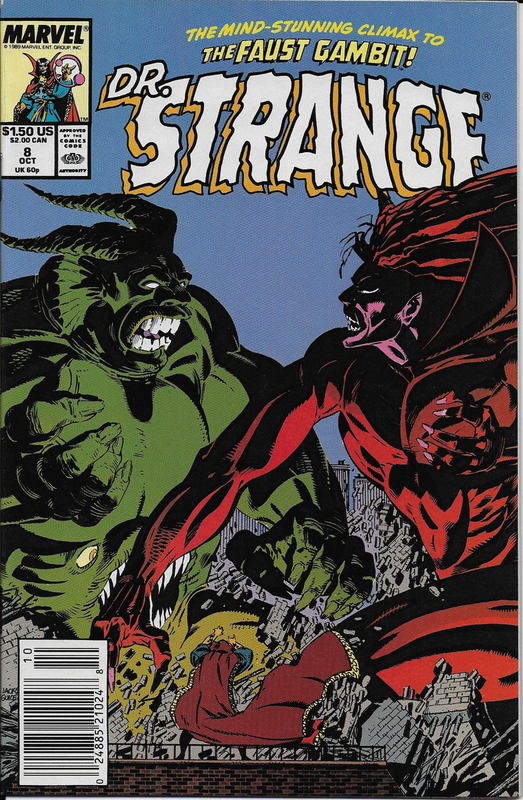 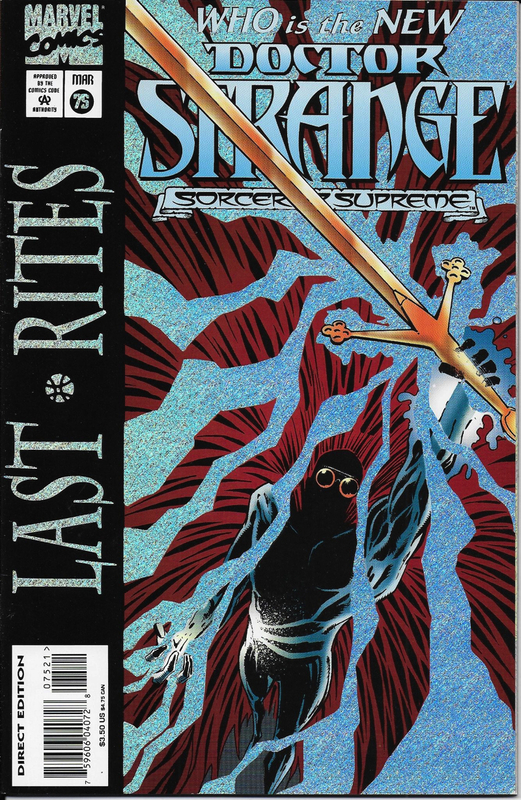 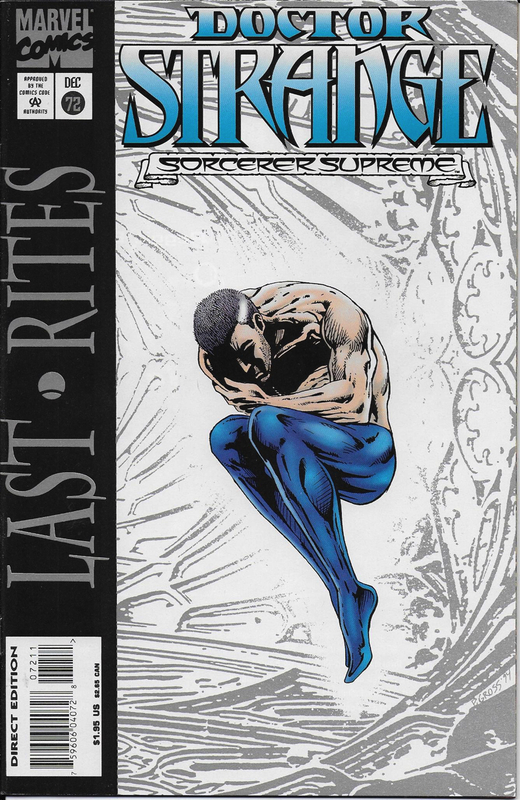 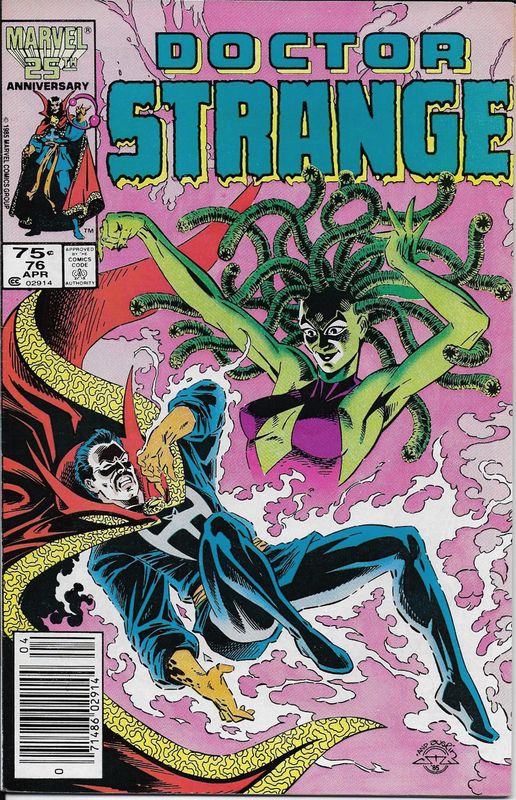 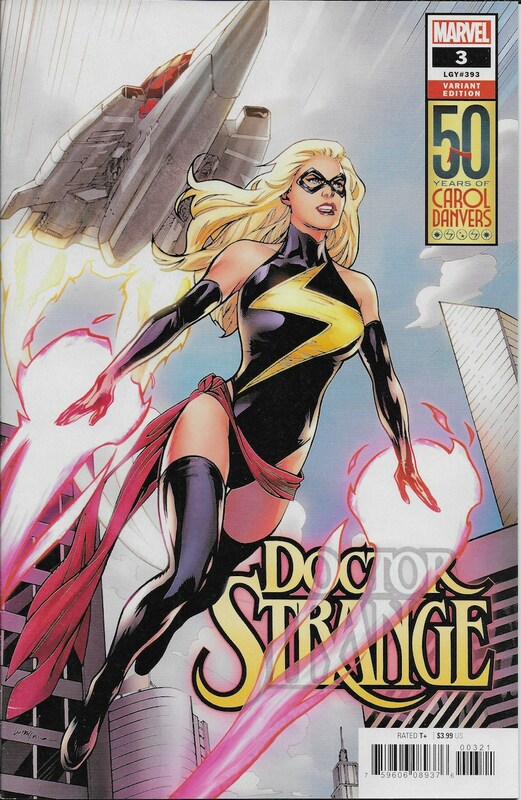 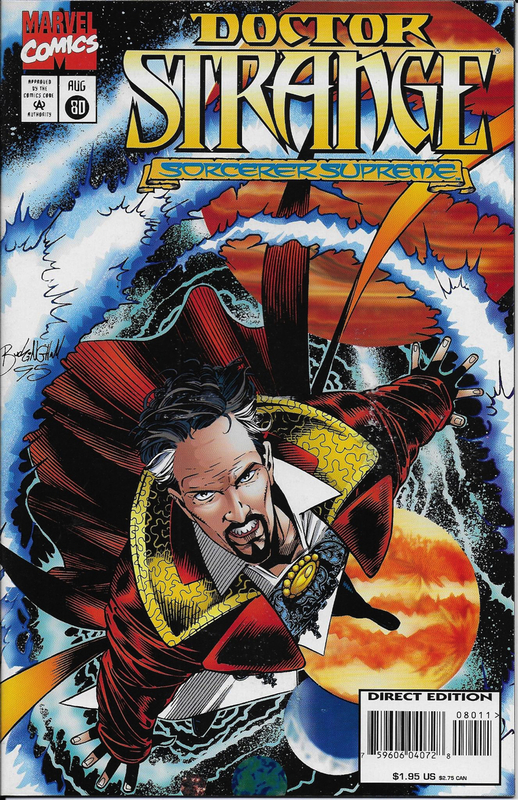 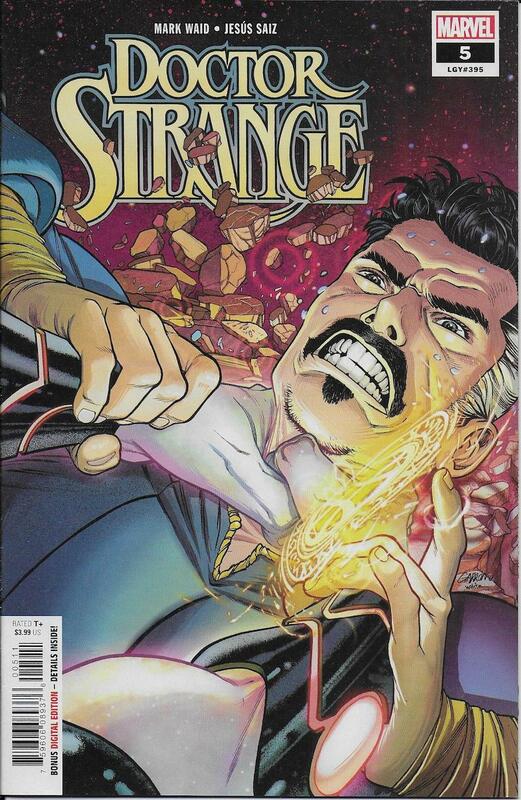 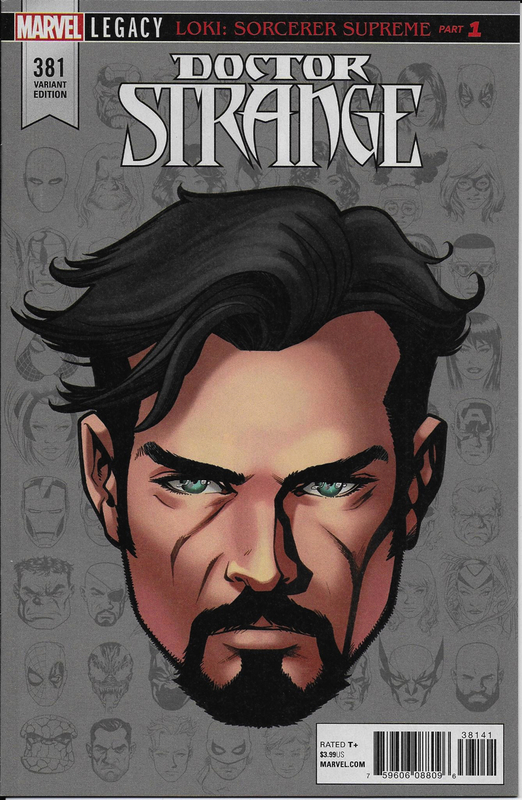 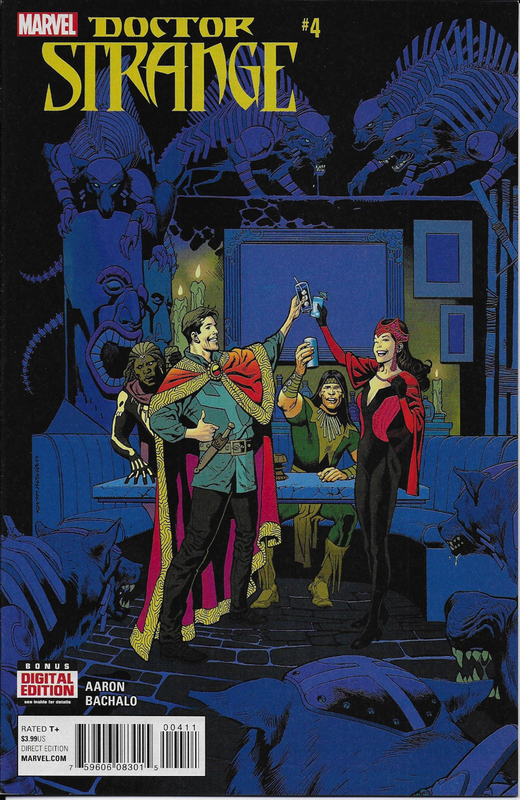 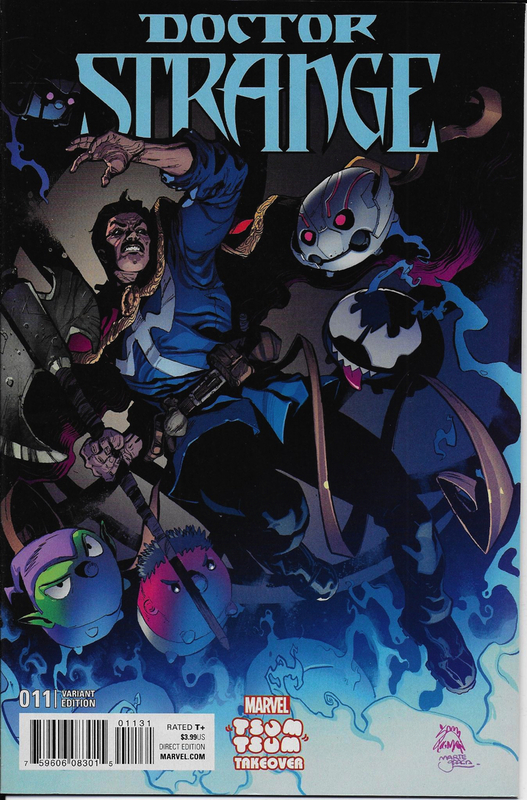 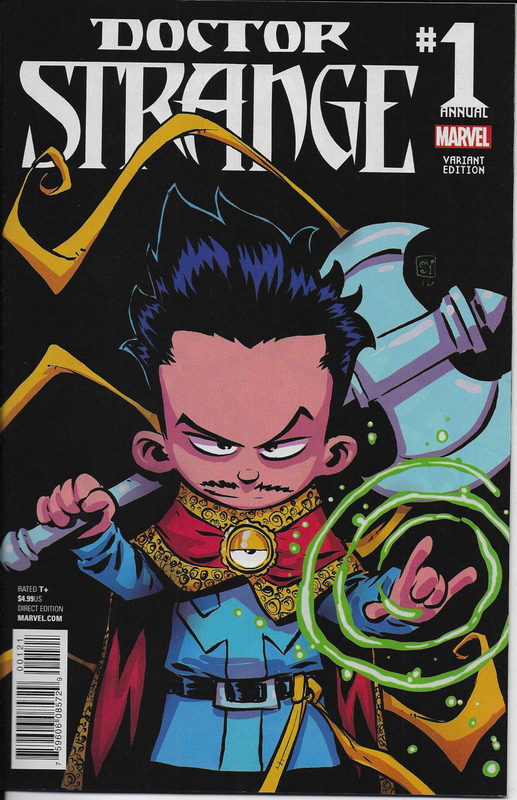 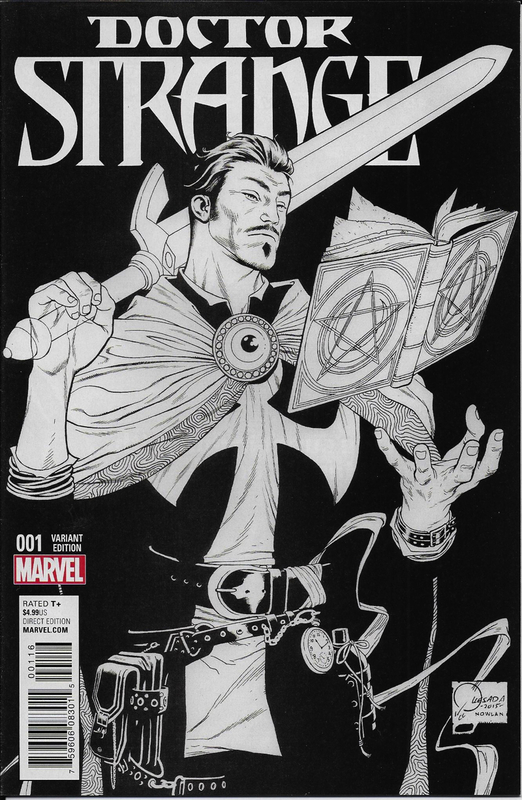 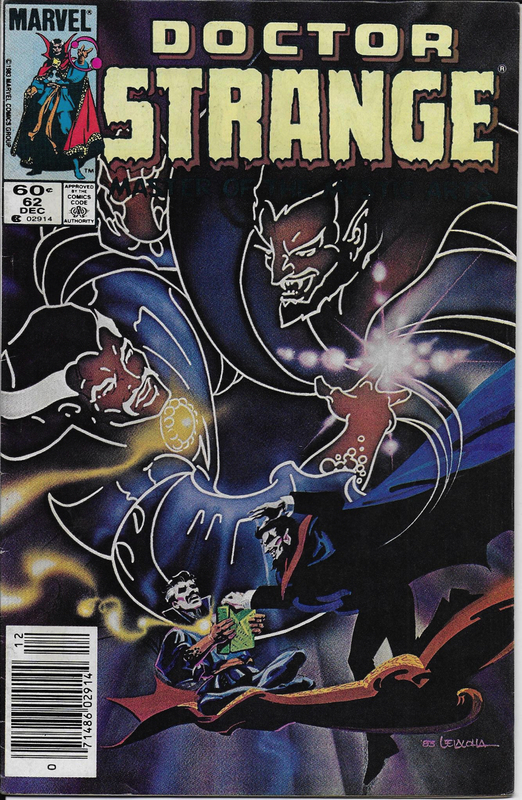 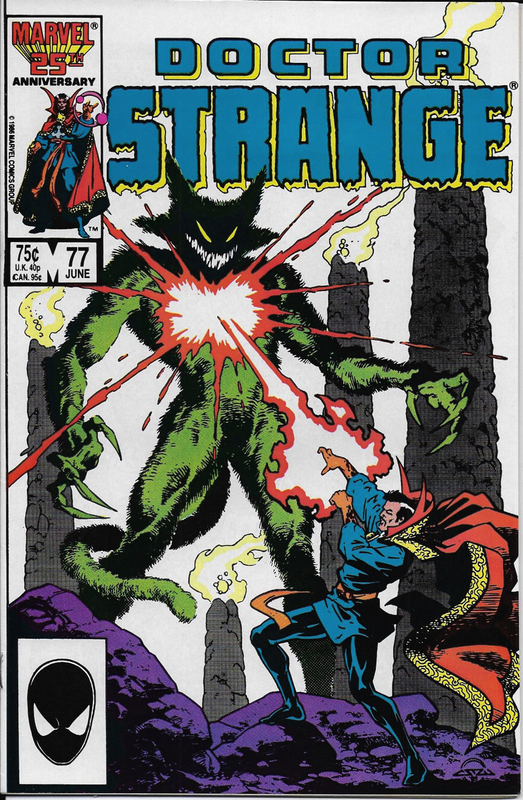 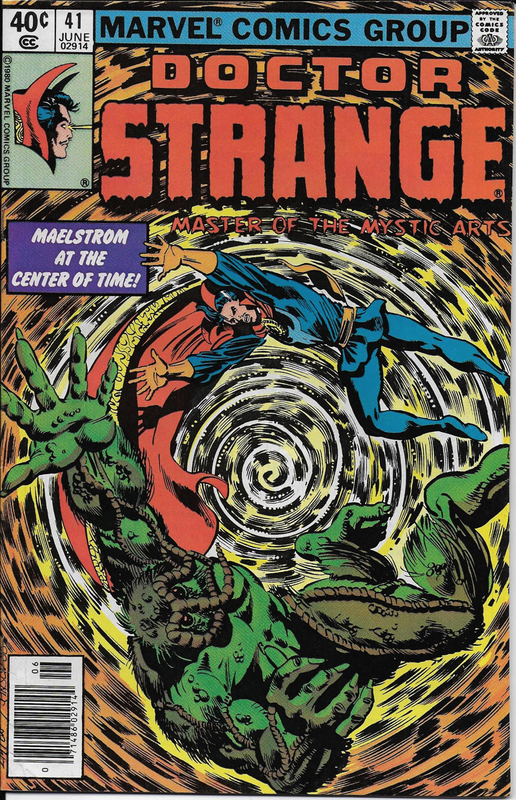 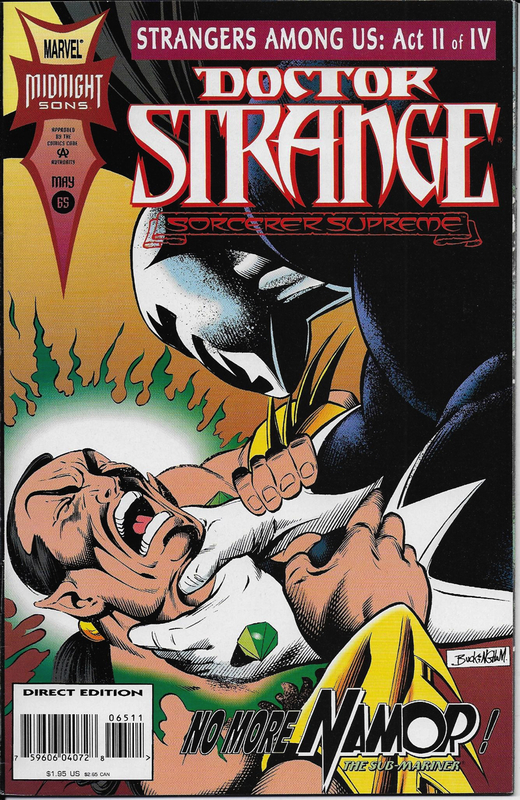 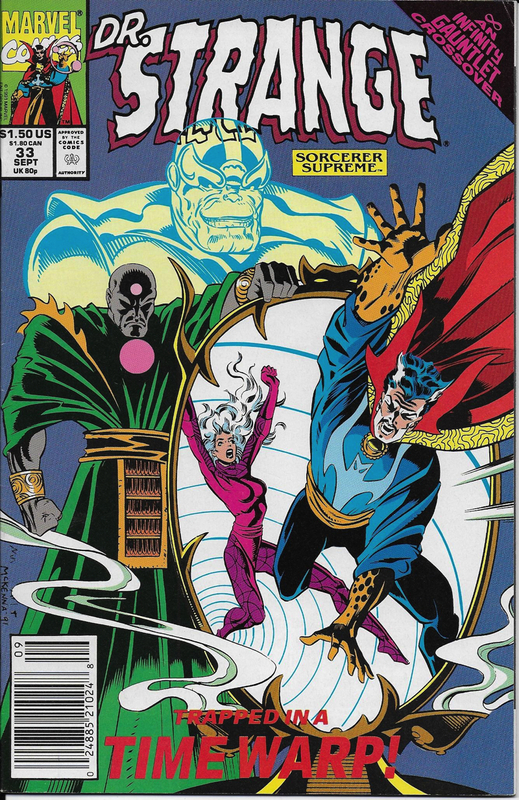 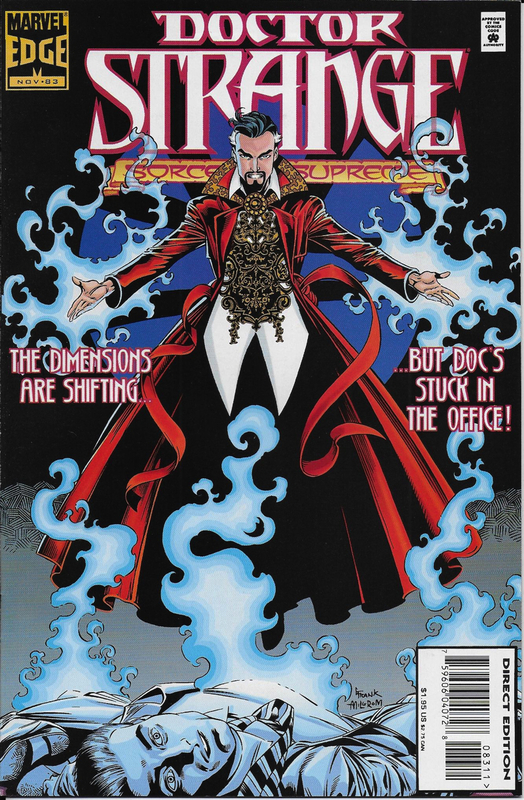 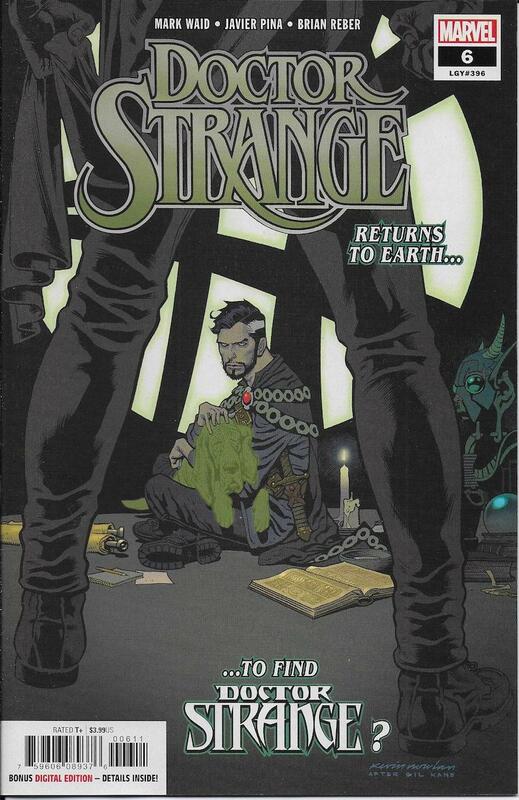 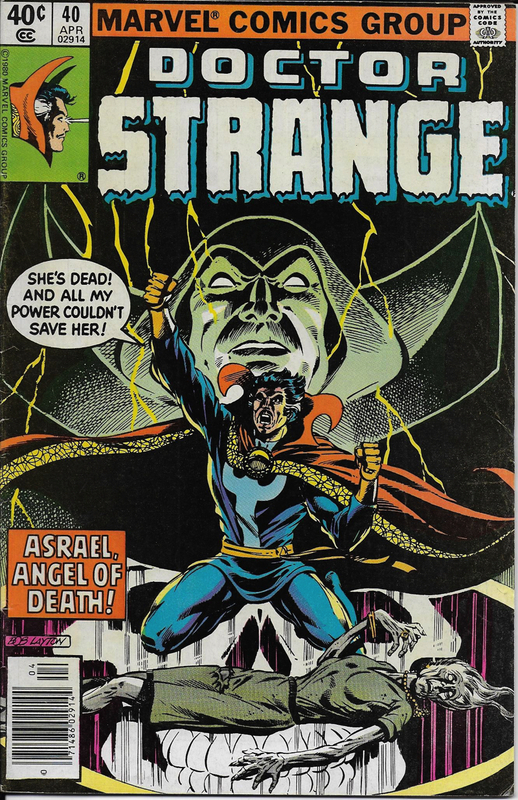 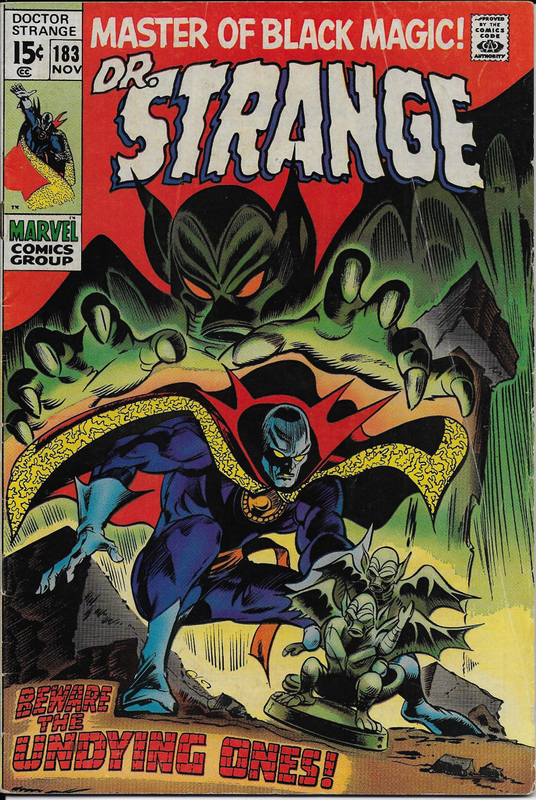 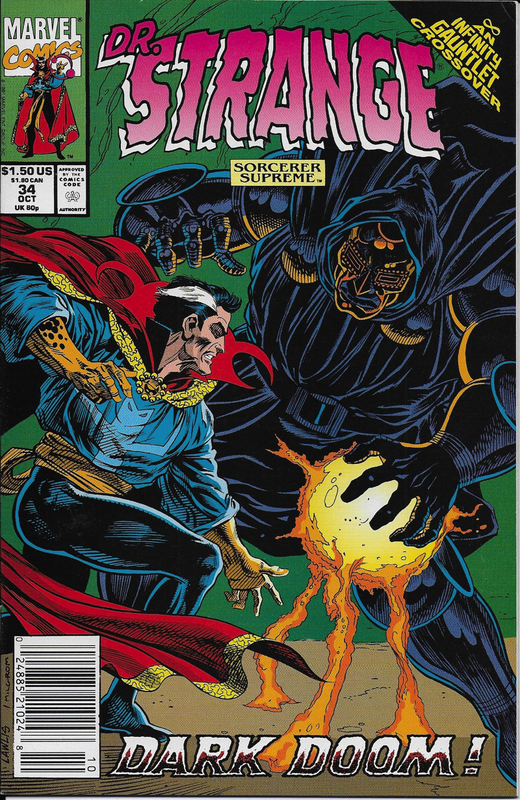 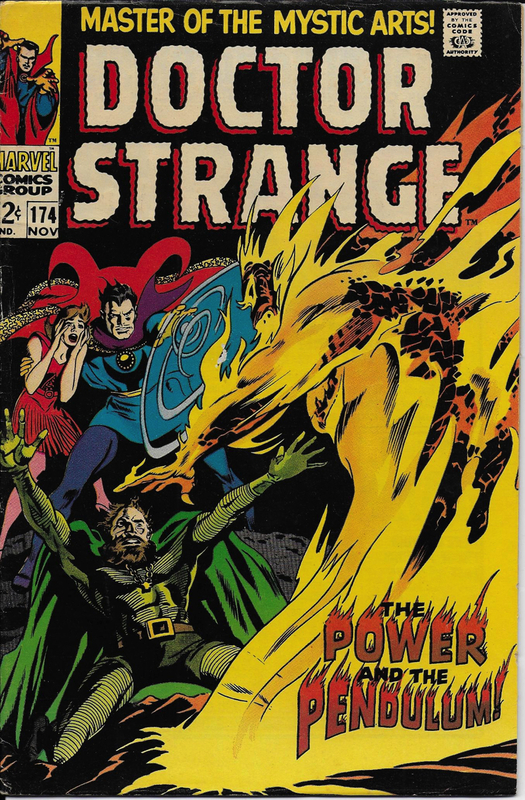 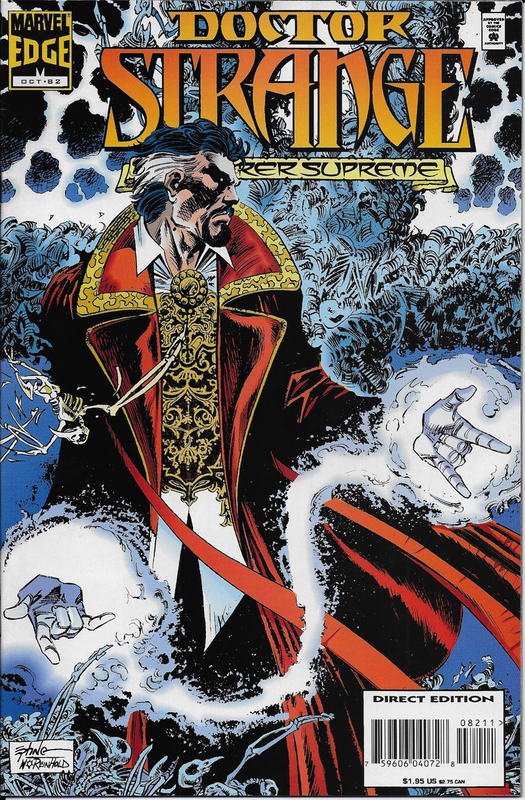 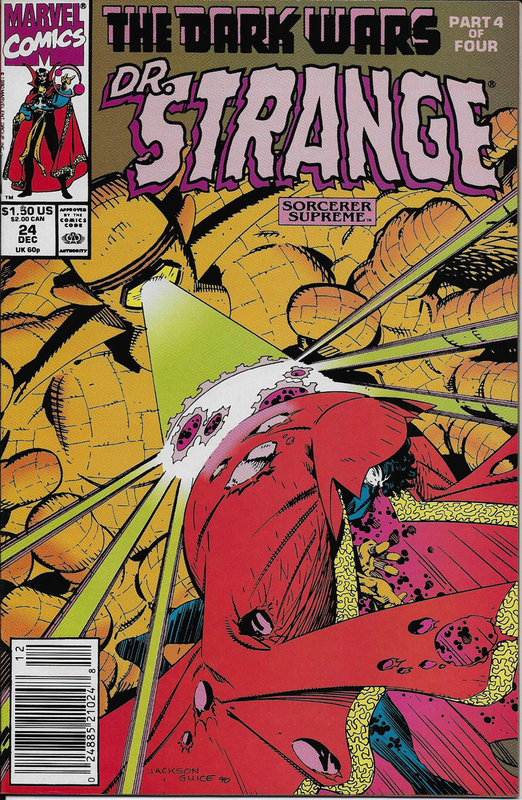 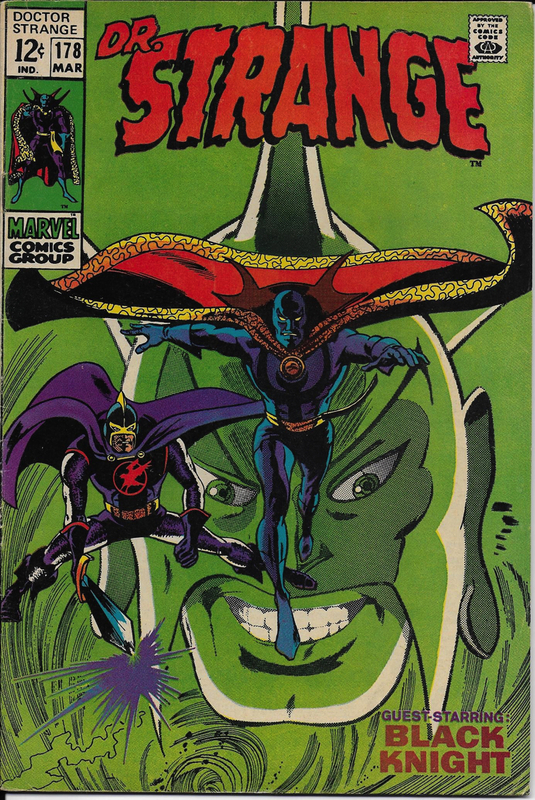 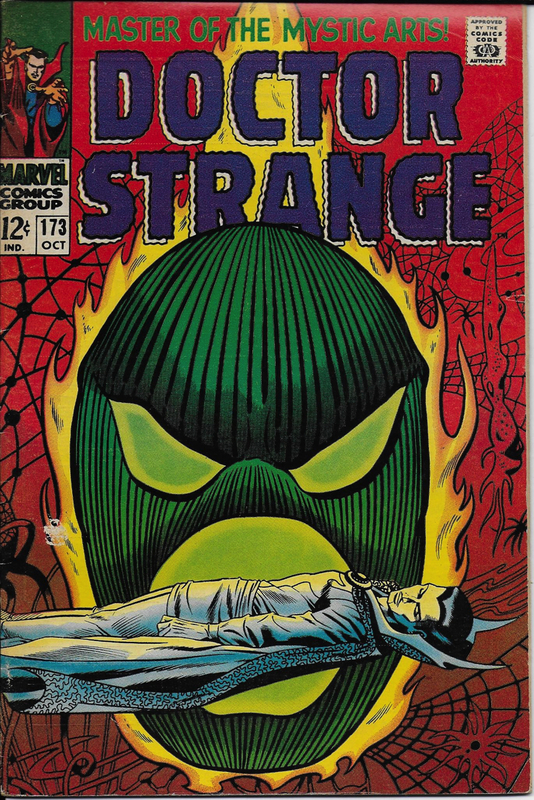 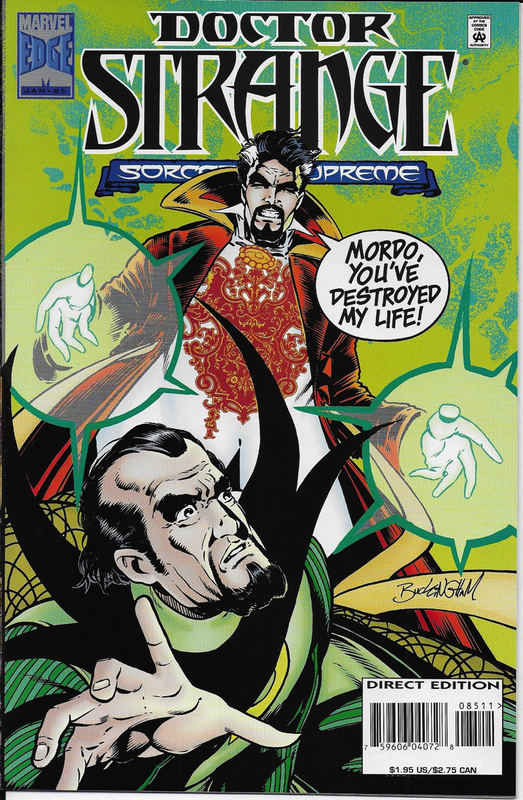 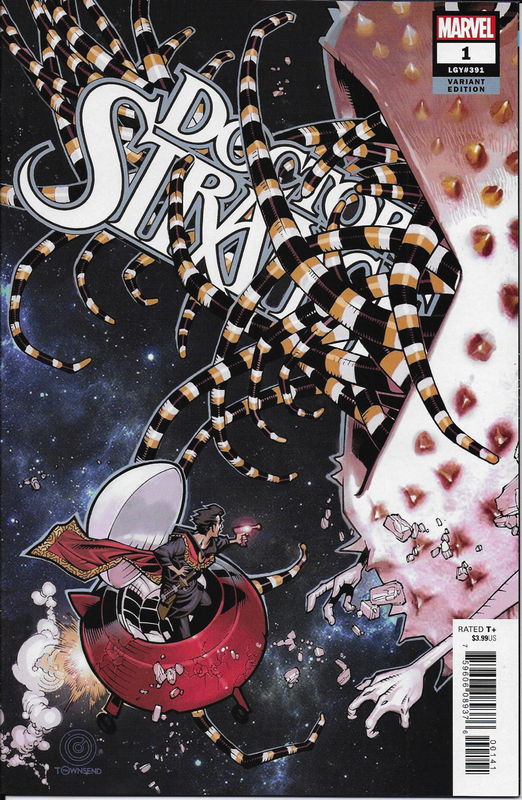 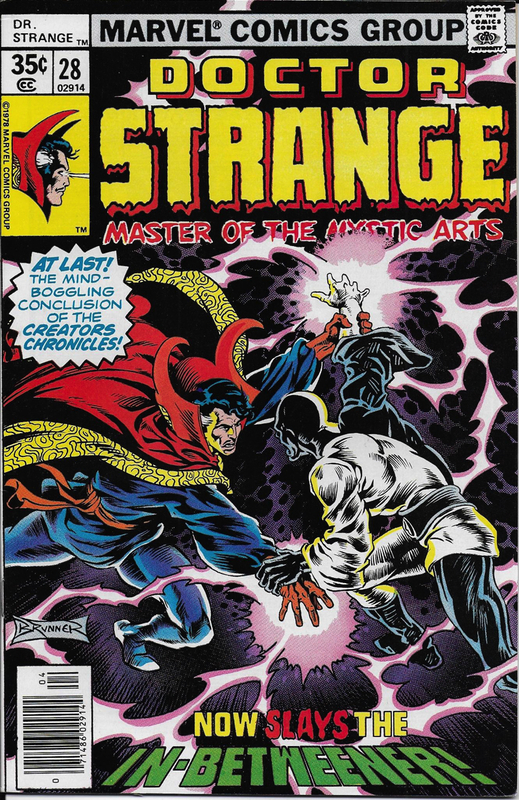 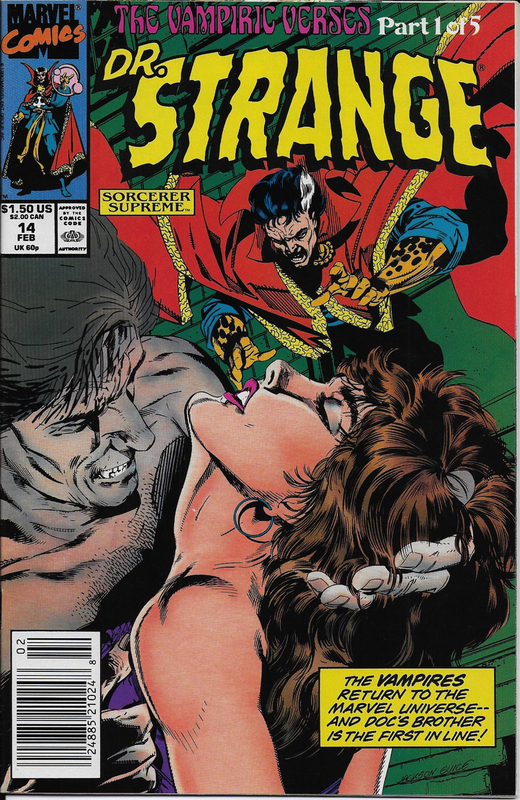 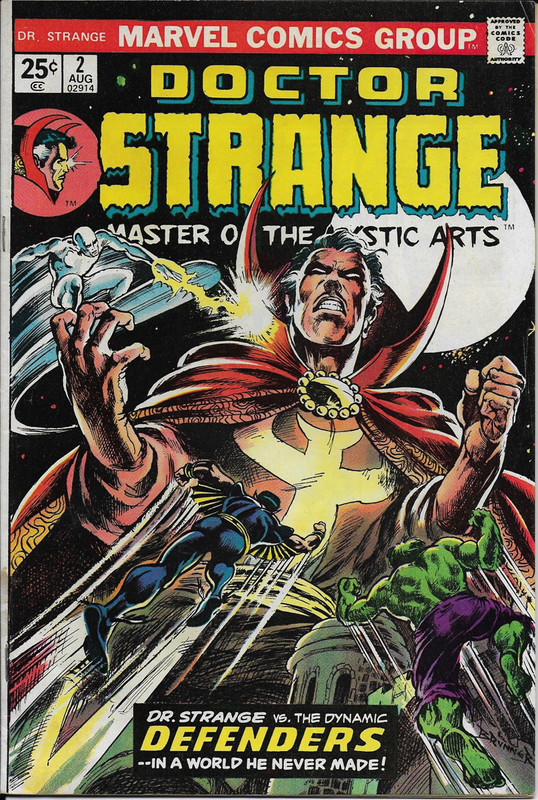 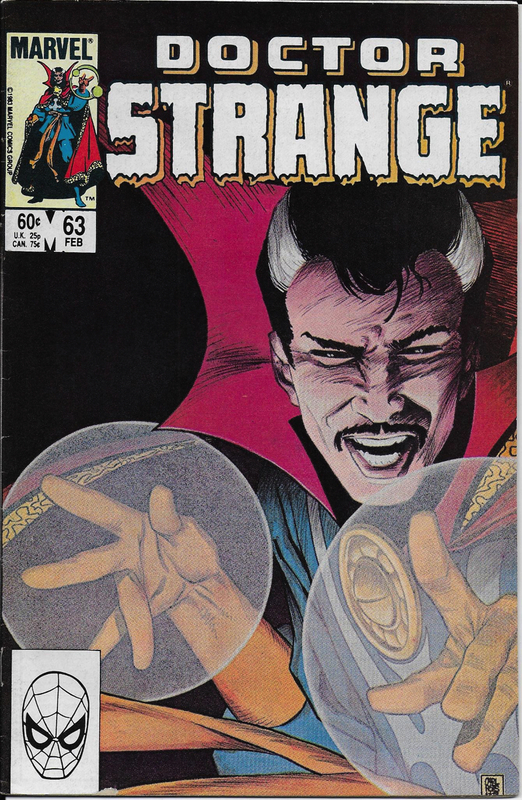 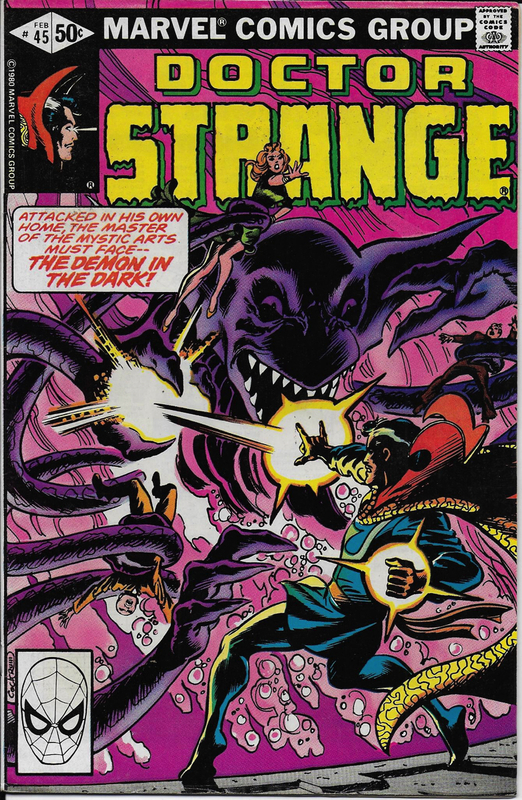 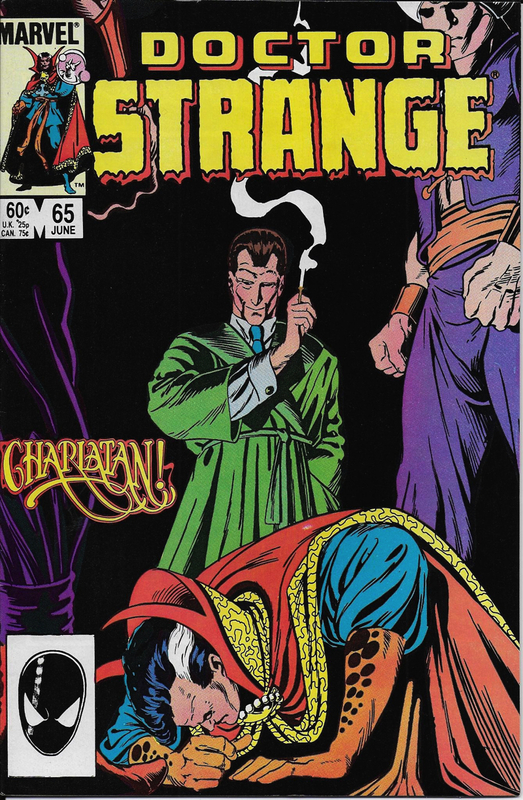 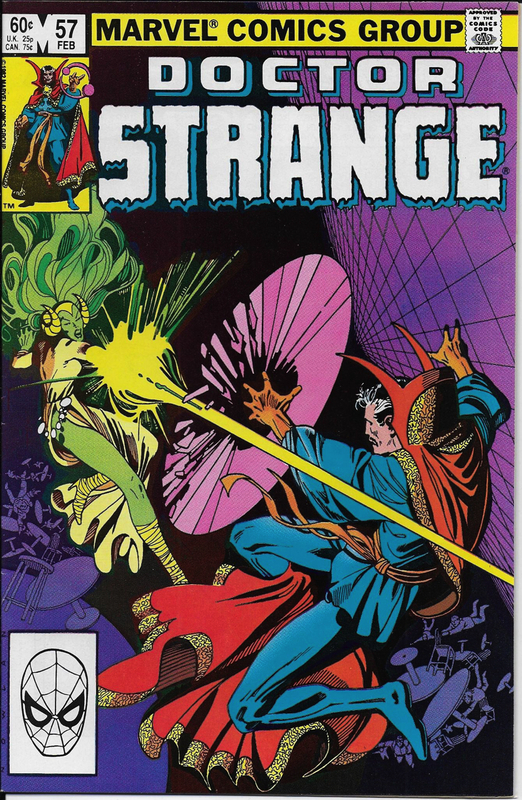 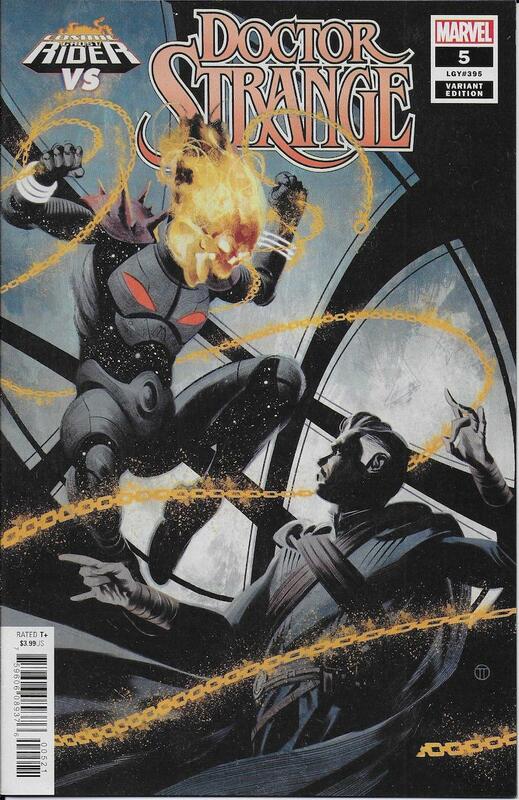 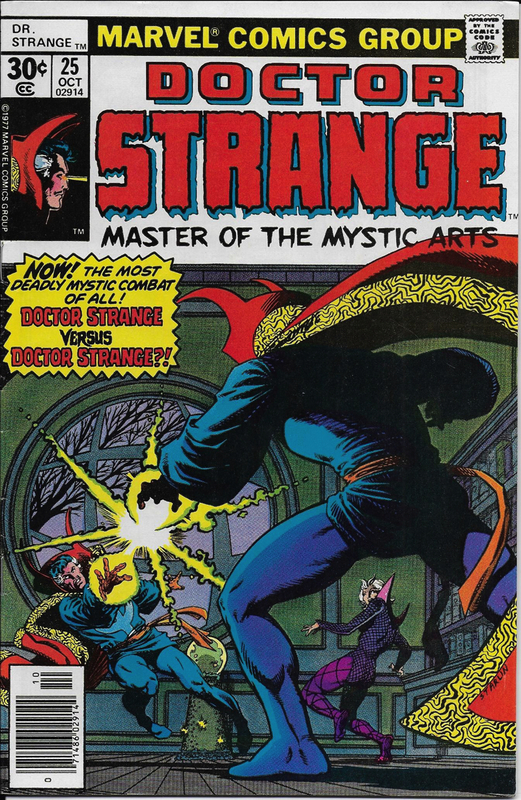 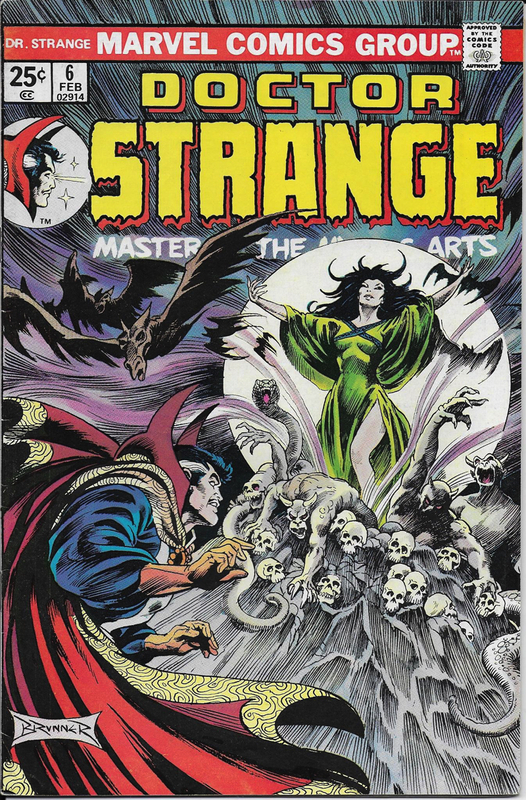 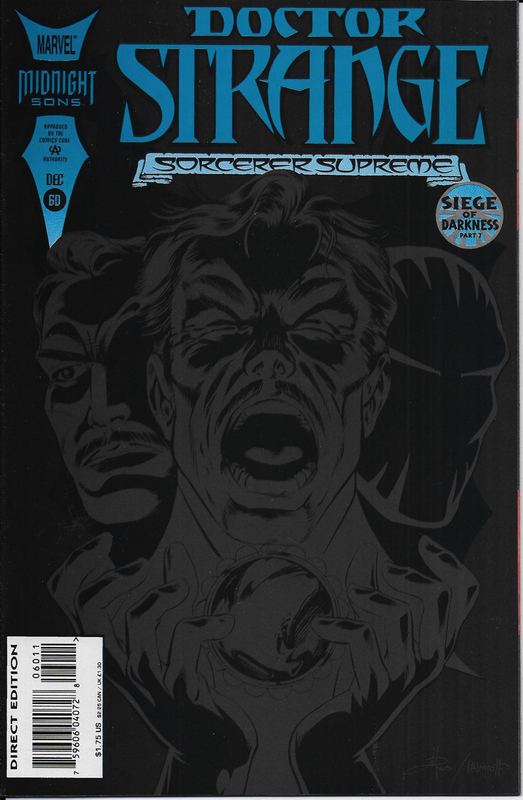 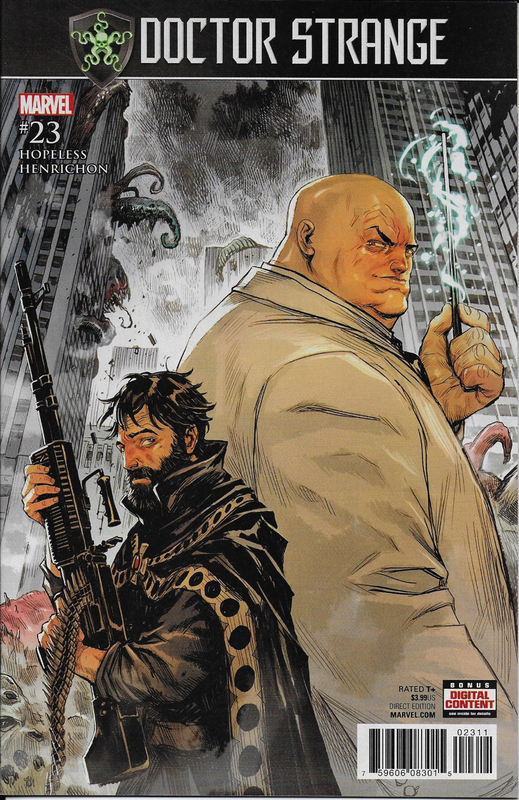 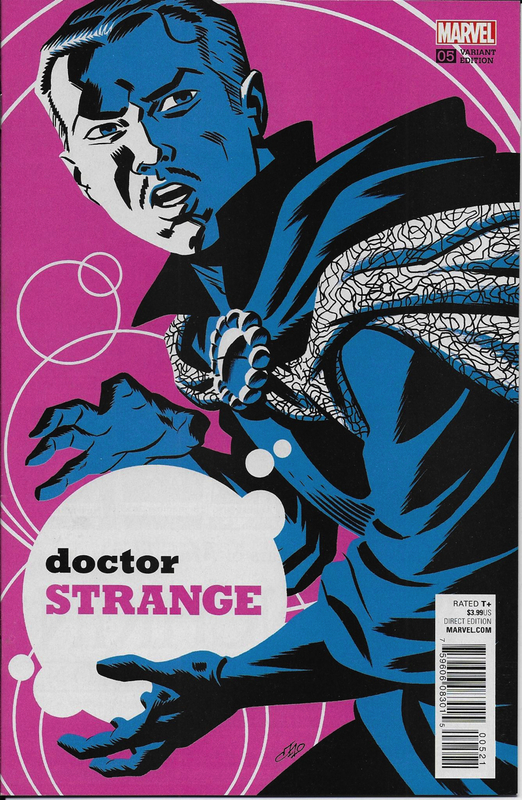 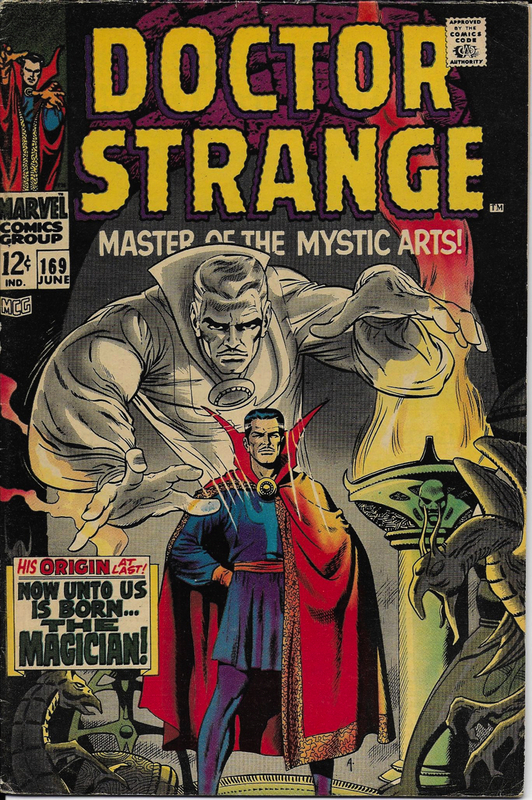 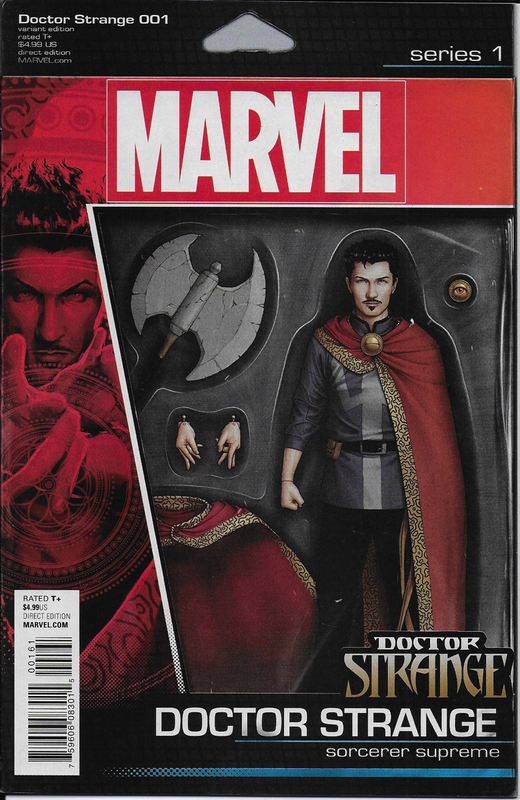 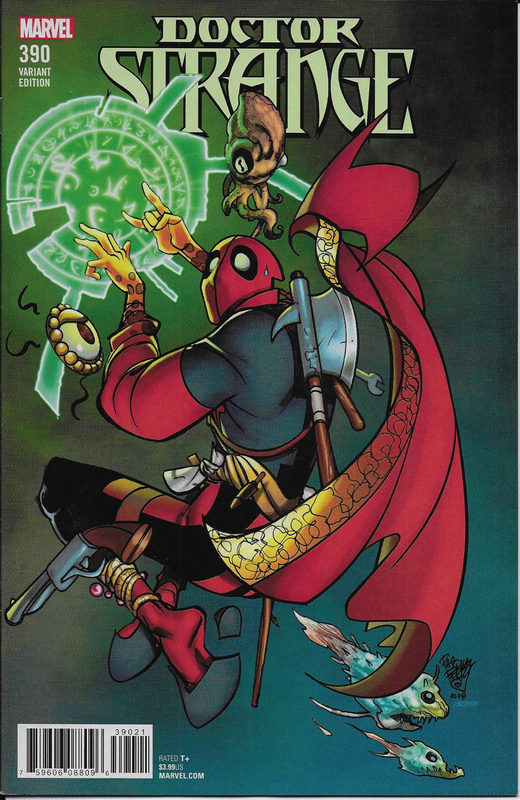 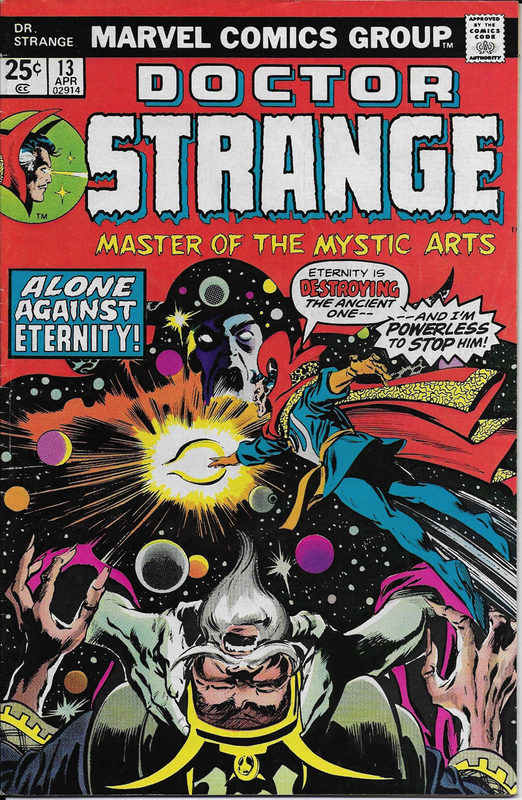 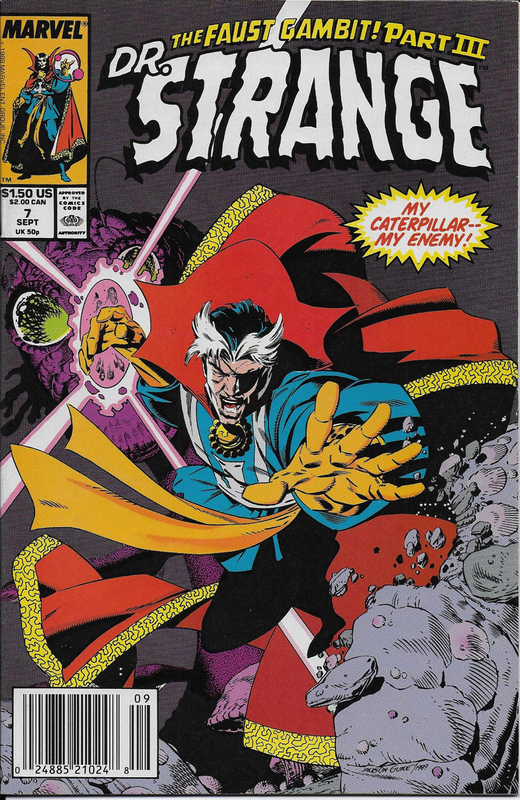 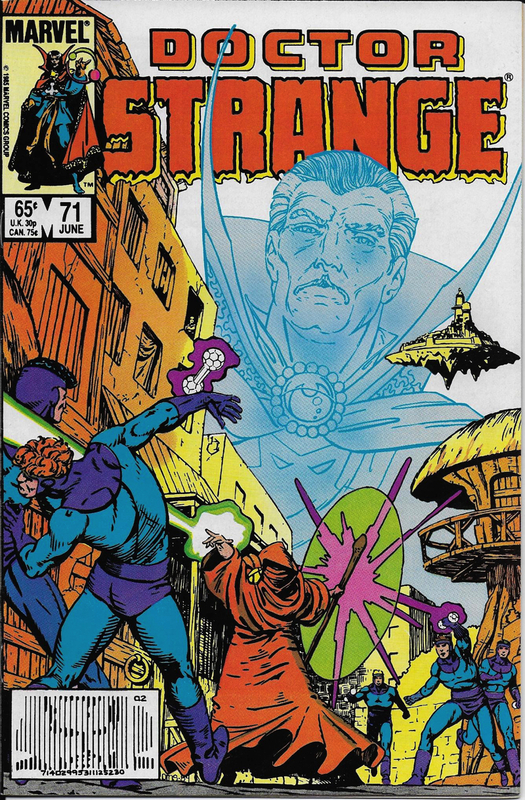 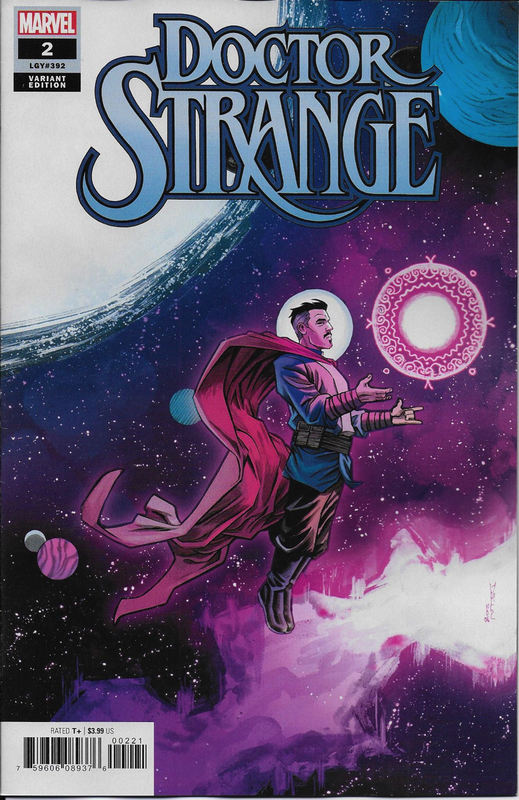 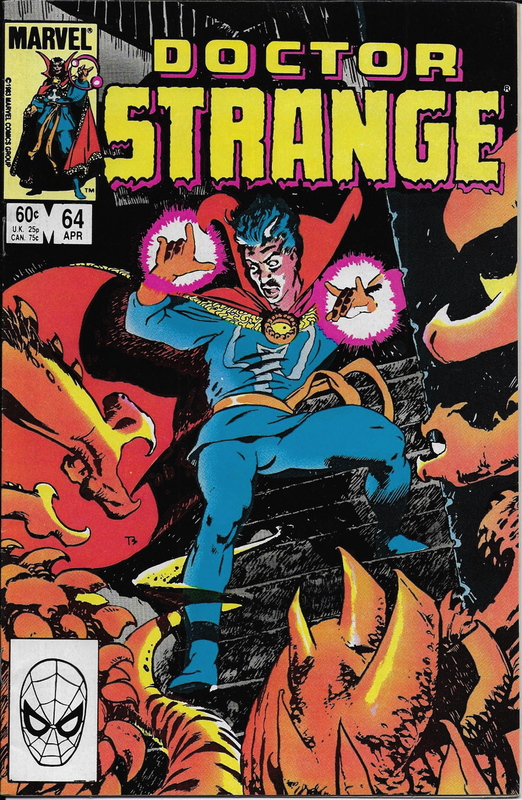 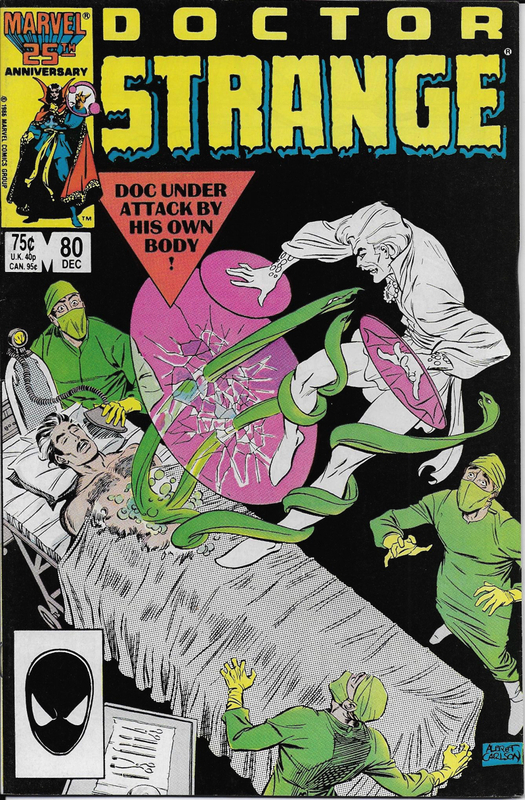 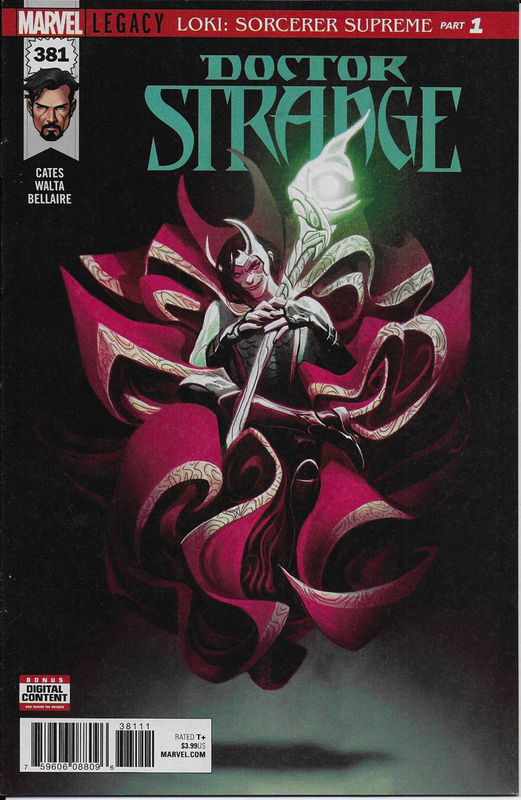 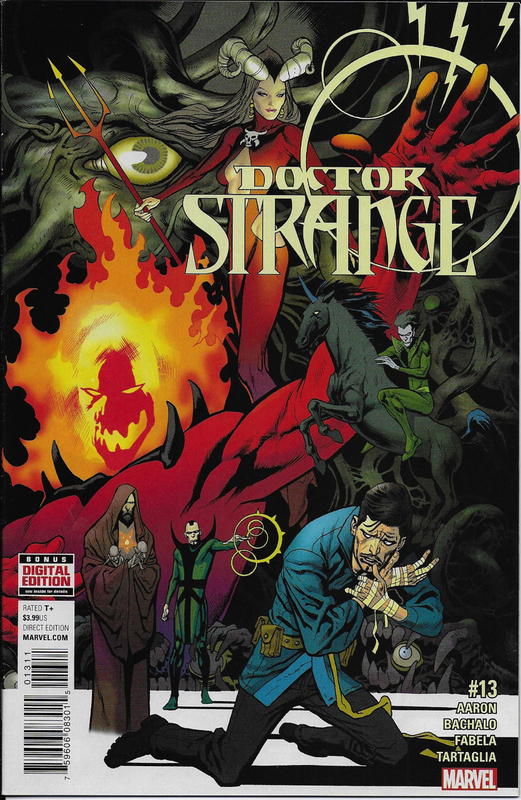 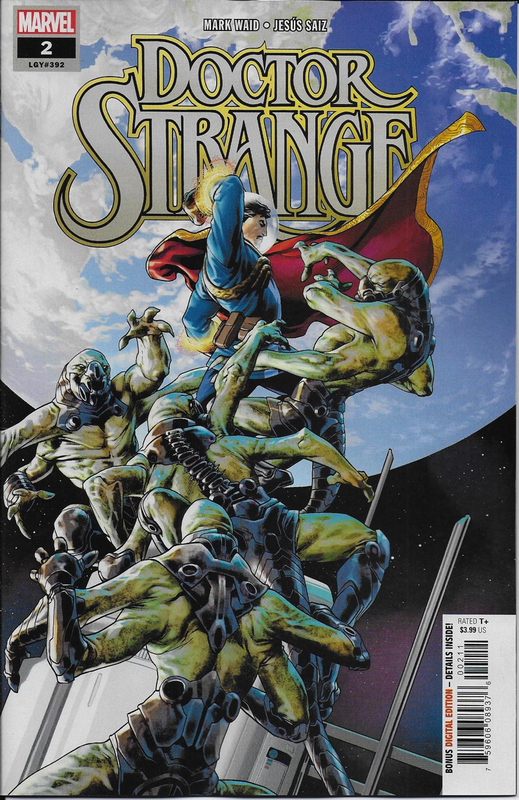 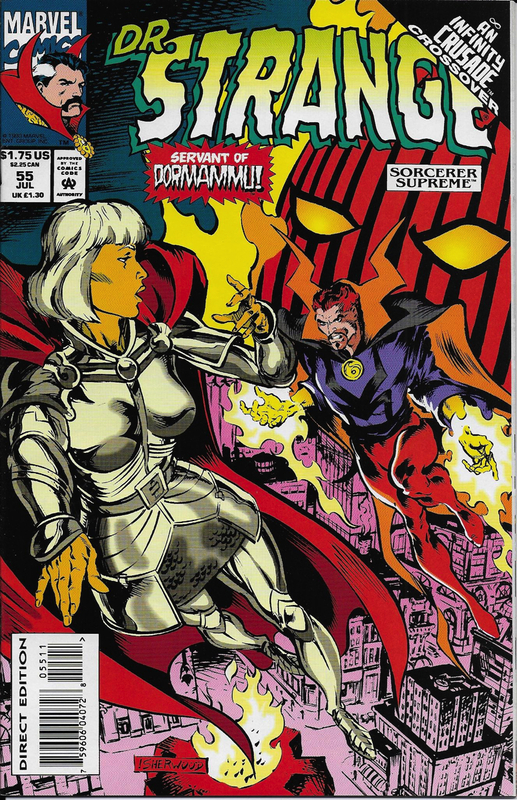 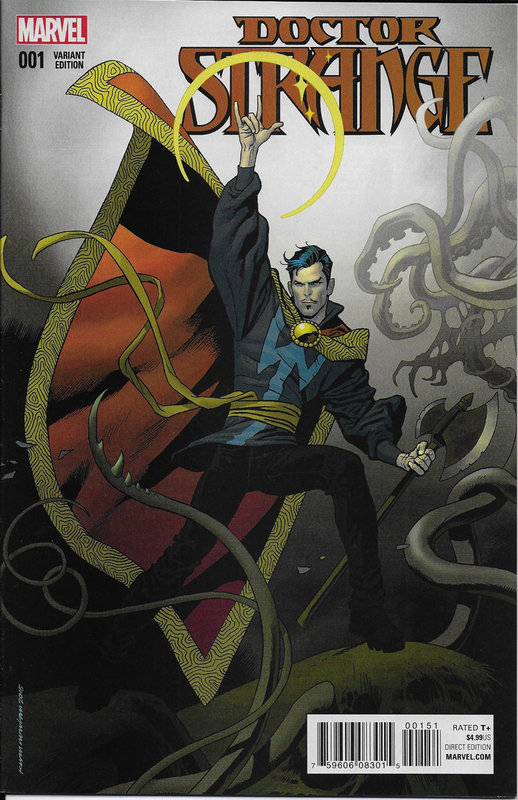 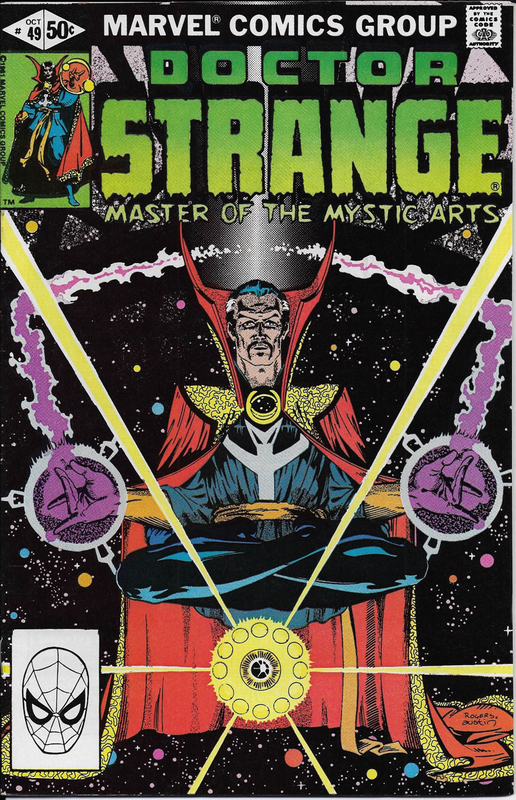 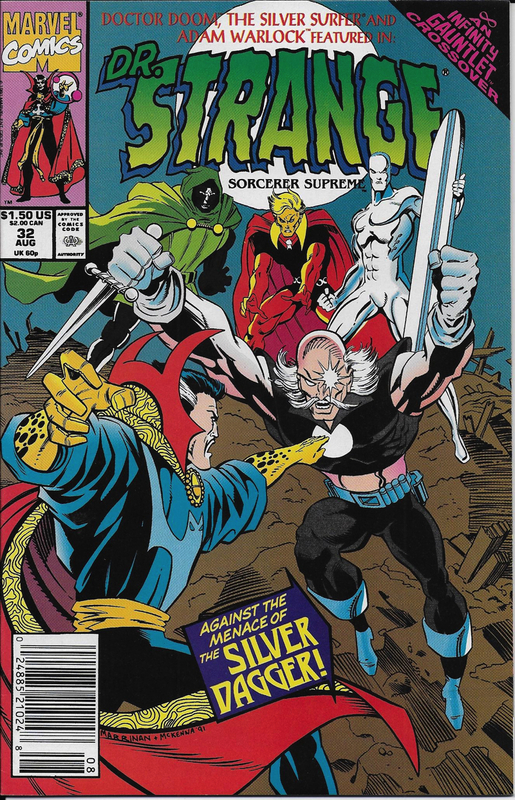 ﻿This ﻿page ﻿catalogs ﻿the ﻿primary ﻿Doctor ﻿Strange ﻿series ﻿comics ﻿that ﻿are ﻿in ﻿the ﻿collection. 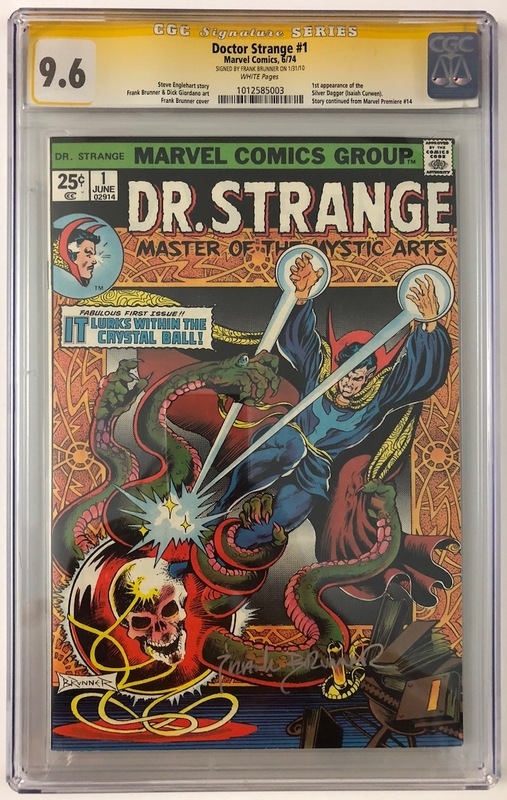 ﻿The ﻿pictures ﻿are ﻿of ﻿the ﻿actual ﻿comics ﻿in ﻿the ﻿collection. 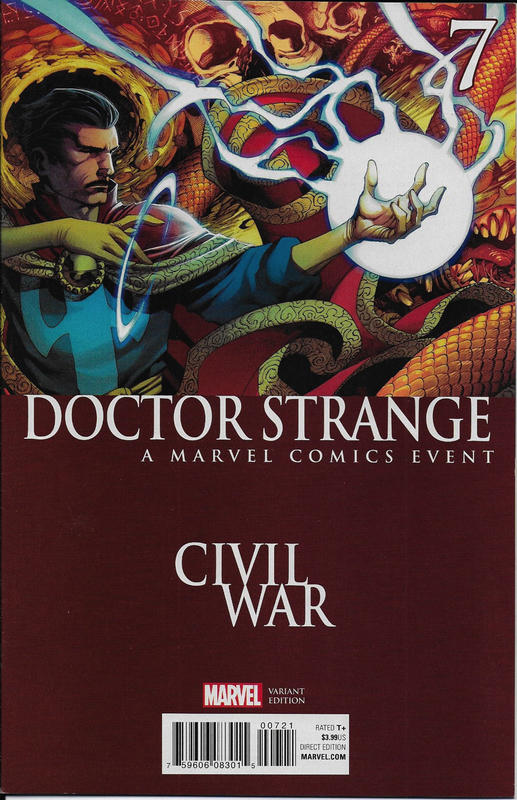 ﻿The ﻿Details ﻿link ﻿will ﻿take ﻿you ﻿to ﻿a ﻿wiki ﻿page ﻿not ﻿associated ﻿with ﻿the ﻿Archive ﻿with ﻿more ﻿information ﻿on ﻿the ﻿book. 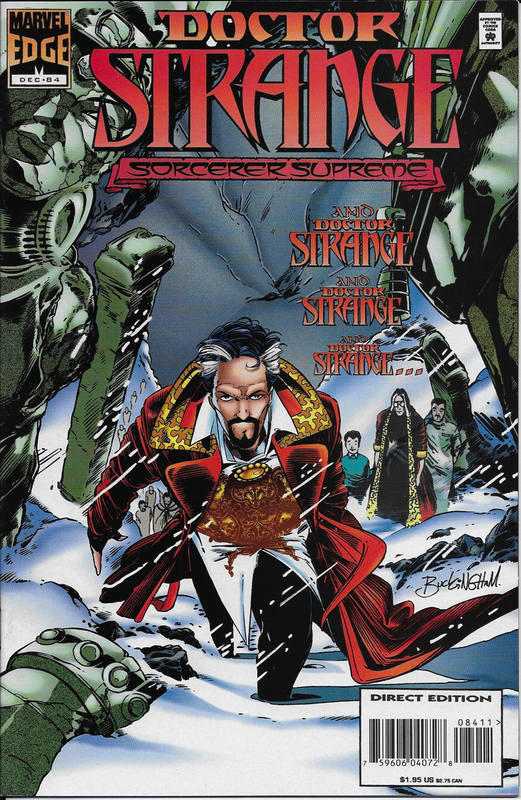 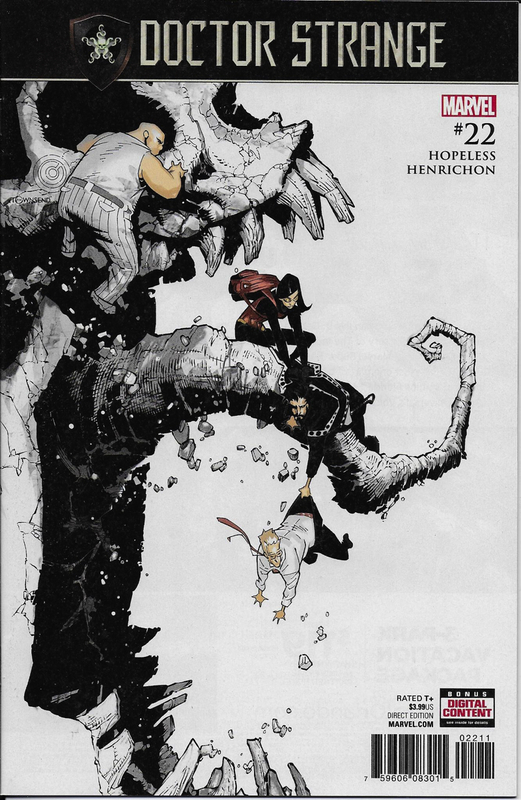 ﻿One-shots, ﻿mini-series, ﻿and ﻿important ﻿Doctor ﻿Strange ﻿runs ﻿in ﻿other ﻿titles ﻿are ﻿cataloged ﻿on ﻿other ﻿pages. 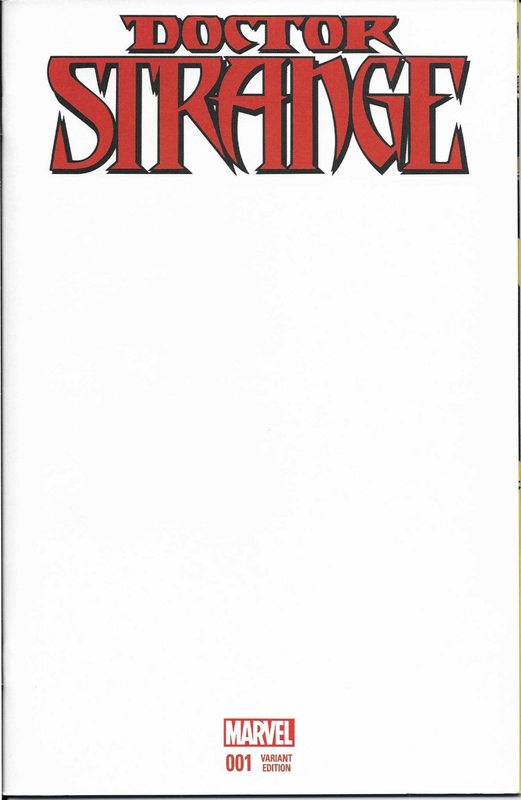 ﻿Refer ﻿to ﻿the ﻿menu ﻿above. 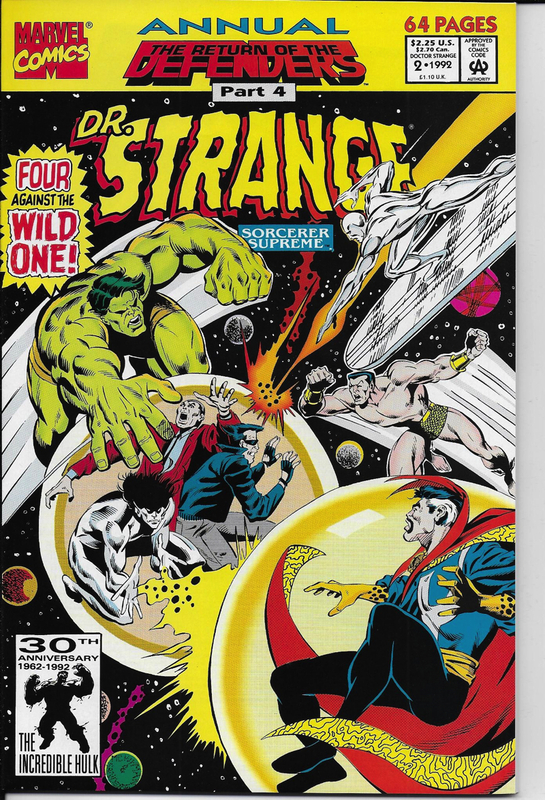 ﻿With ﻿the ﻿crazy ﻿things ﻿Marvel ﻿does ﻿to ﻿their ﻿numbering ﻿schemes, ﻿I ﻿refer ﻿to ﻿the ﻿series ﻿by ﻿the ﻿year ﻿they ﻿started ﻿not ﻿by ﻿a ﻿volume ﻿number. 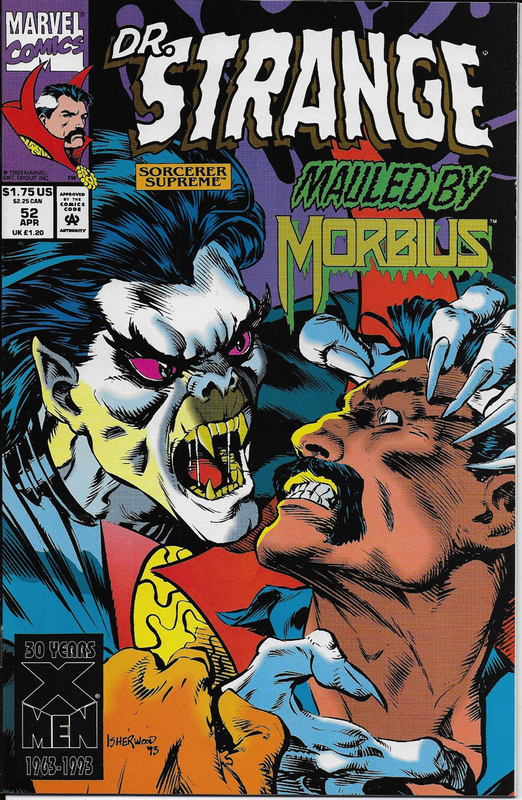 ﻿I ﻿also ﻿disagree ﻿with ﻿how ﻿other ﻿websites ﻿determine ﻿what ﻿volumes ﻿are ﻿which ﻿so ﻿its ﻿easier ﻿to ﻿just ﻿use ﻿dates. 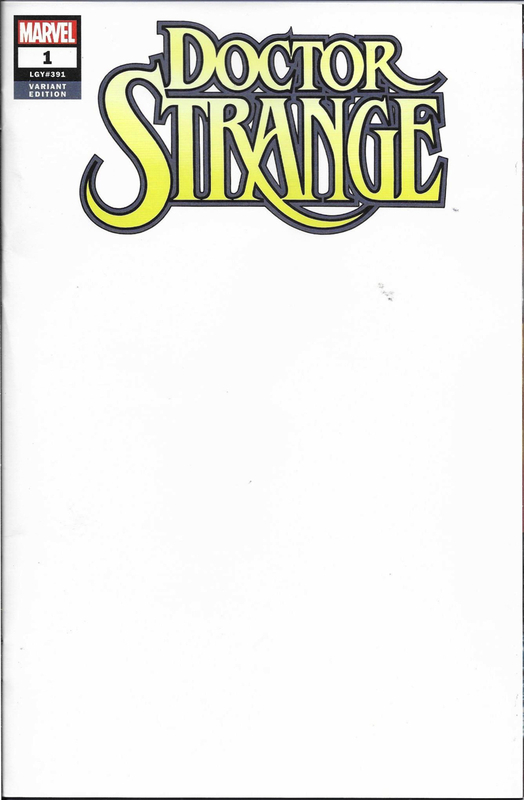 ﻿The ﻿dates ﻿I ﻿use ﻿for ﻿each ﻿comic ﻿is ﻿the ﻿date ﻿on ﻿the ﻿indicia ﻿page ﻿of ﻿the ﻿comic ﻿which ﻿can ﻿be ﻿different ﻿than ﻿the ﻿date ﻿it ﻿was ﻿actually ﻿released.